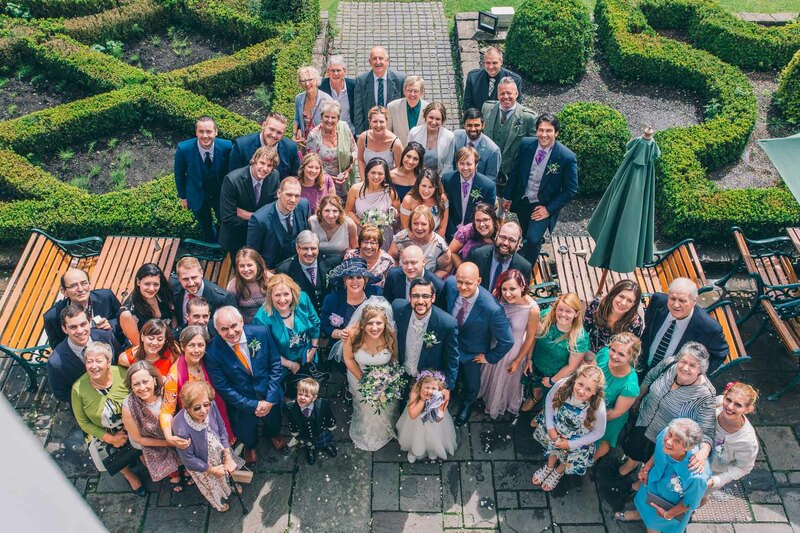 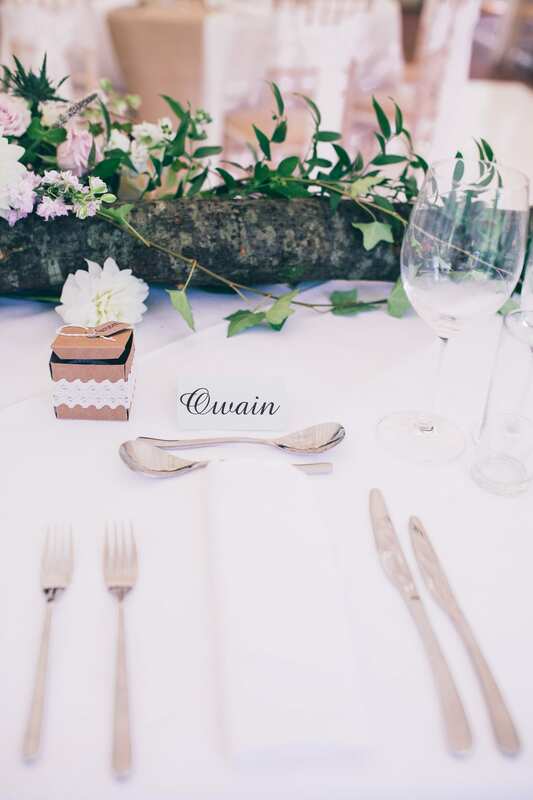 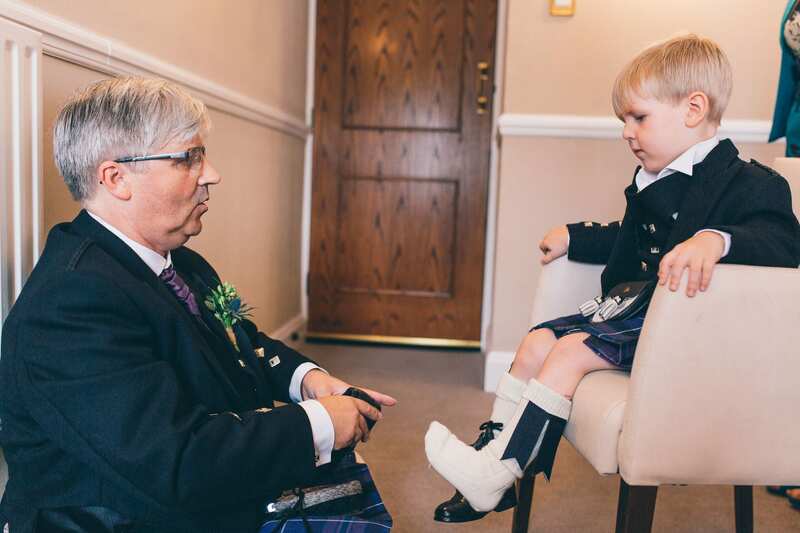 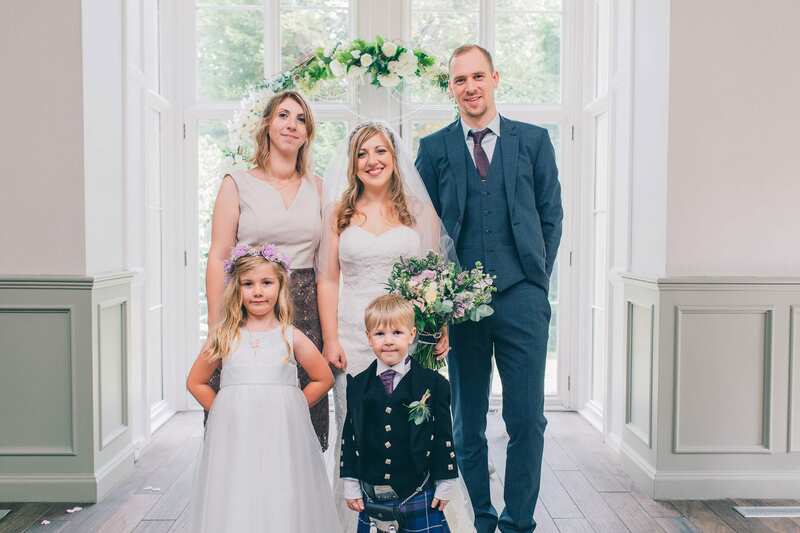 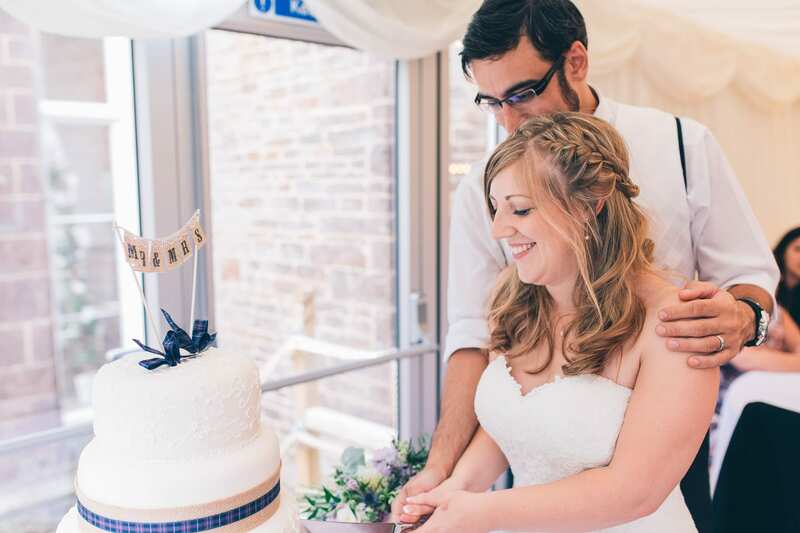 Owain & Heather’s Bryngarw House wedding was on a lovely but slightly wet day in July. 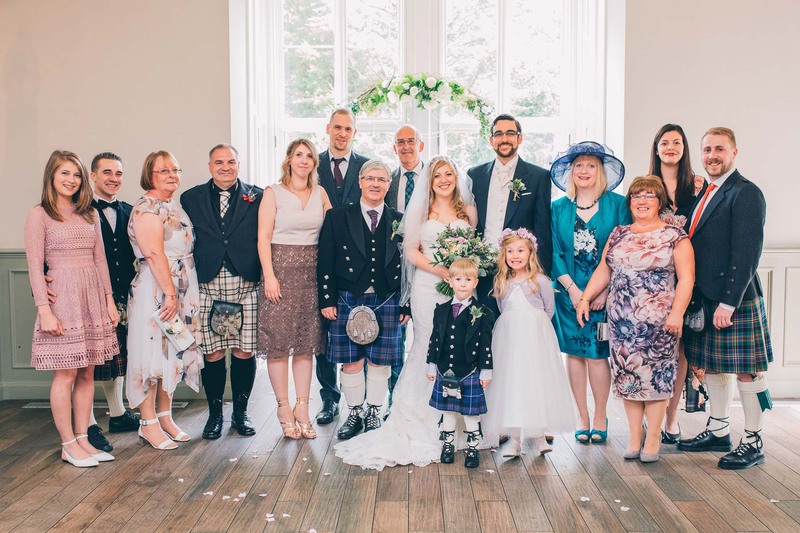 It was beautifully Scottish themed in blues, greens and purple and despite the slightly wet start to the day turned out beautifully just when we needed it to in time for the group shot and portraits. 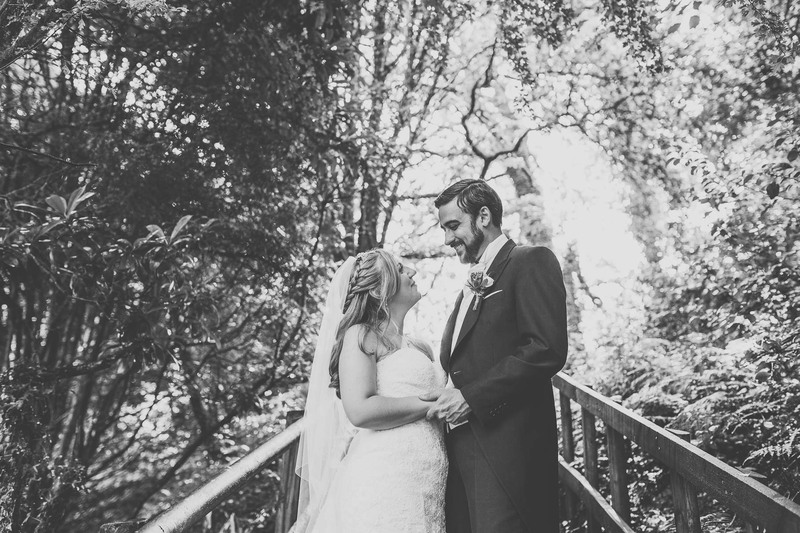 A really lovely day at Bryngarw House in South Wales. 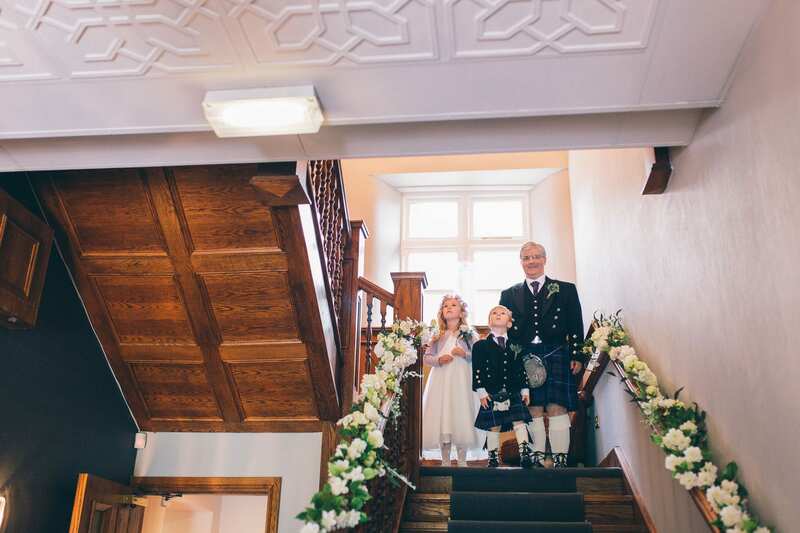 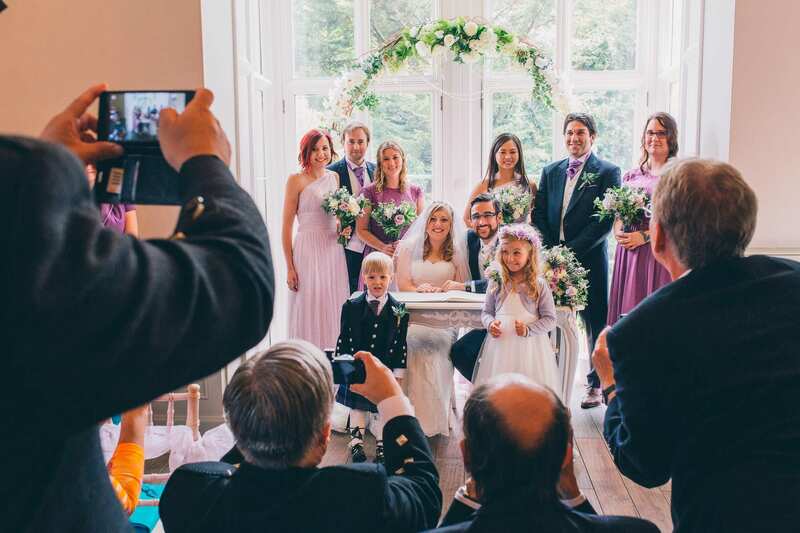 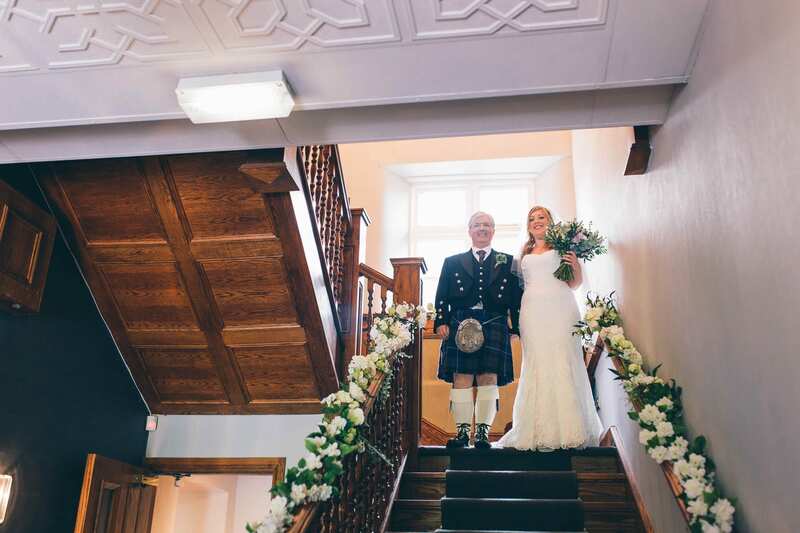 Have a scroll down Owain & Heather’s photographs and you can read all about their wedding in their words at the end. 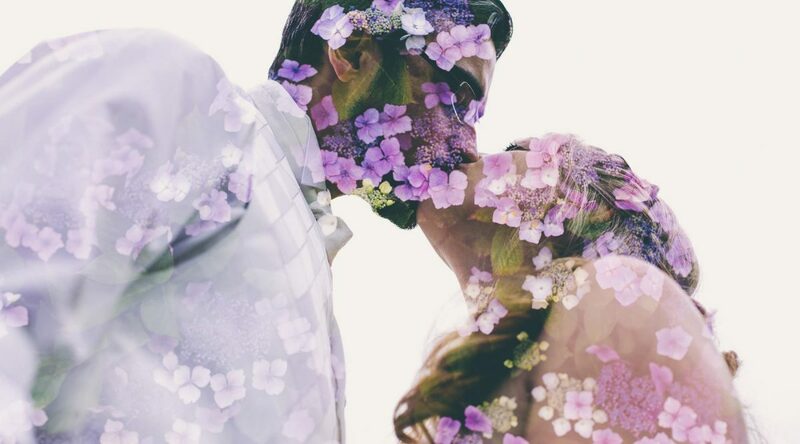 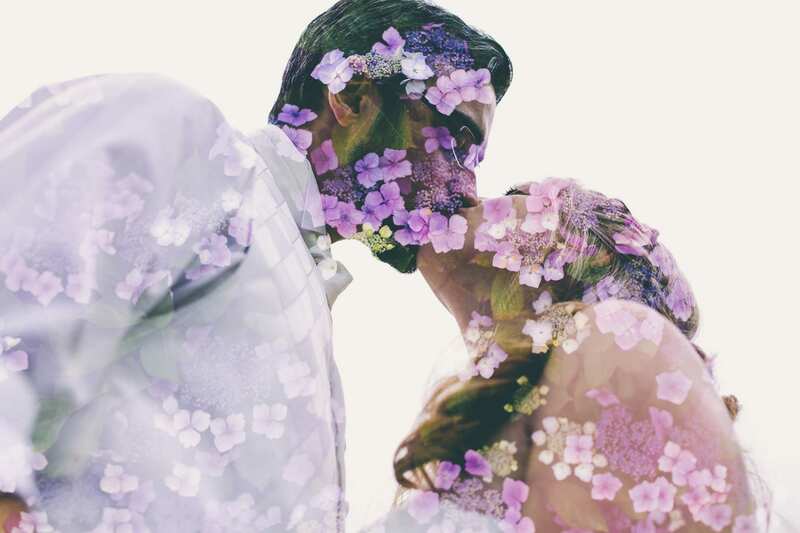 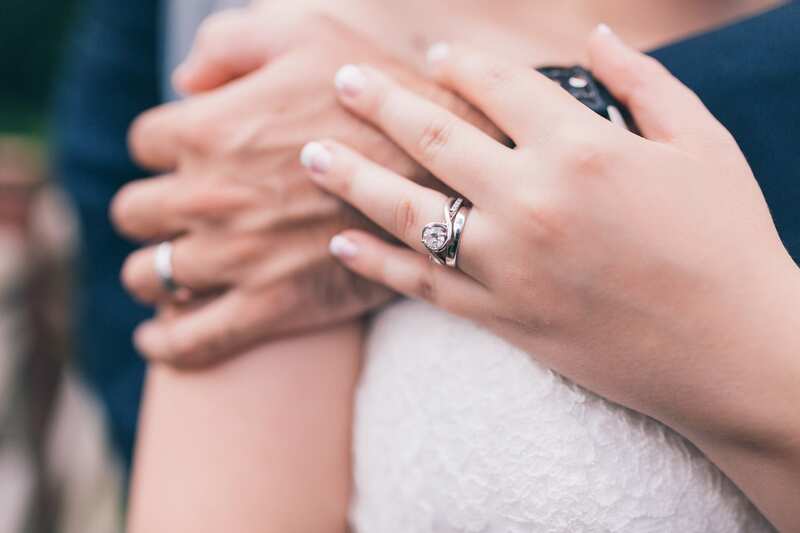 Don’t put to much pressure on it, the day should be about of your marriage. 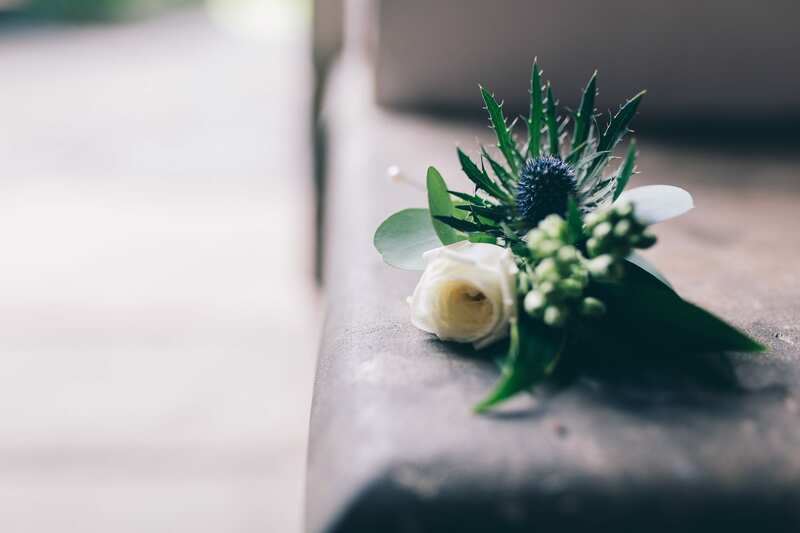 It’s a day to celebrate with those who matter most to you, all the other little details are not what matters at the end of the day. 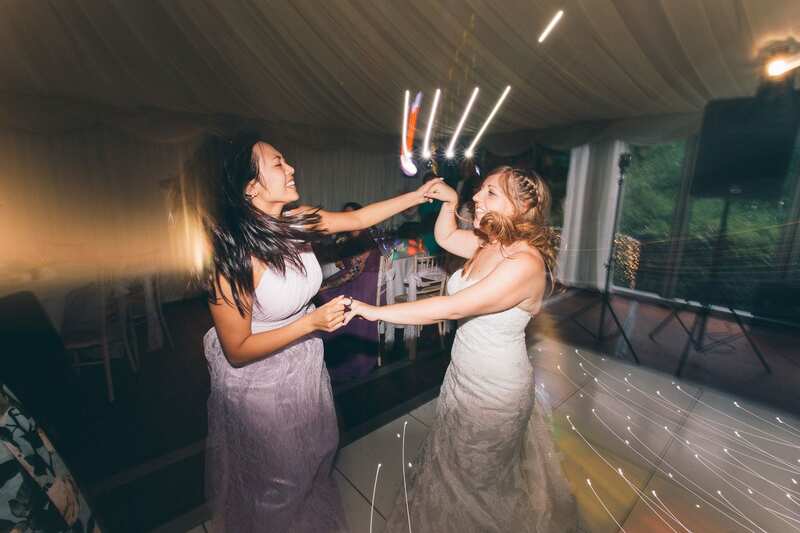 We met through a mutual friend at university. 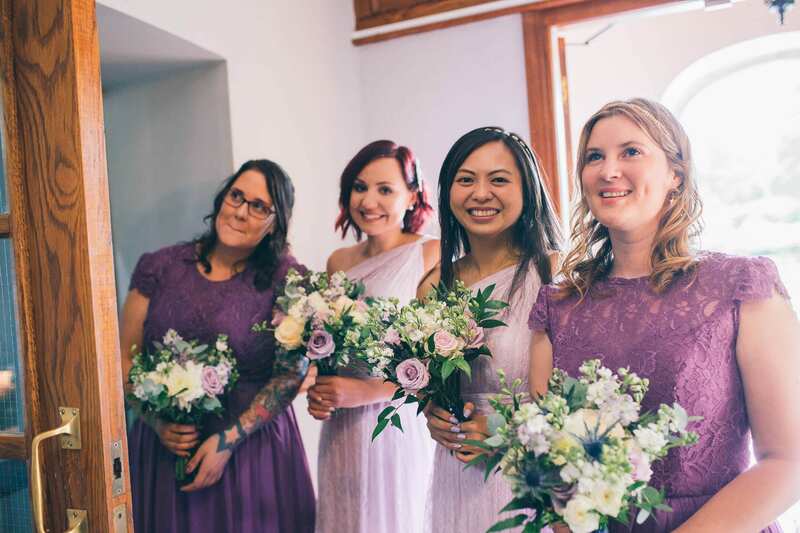 We were friends for about 2 years then moved in together with our other friends. 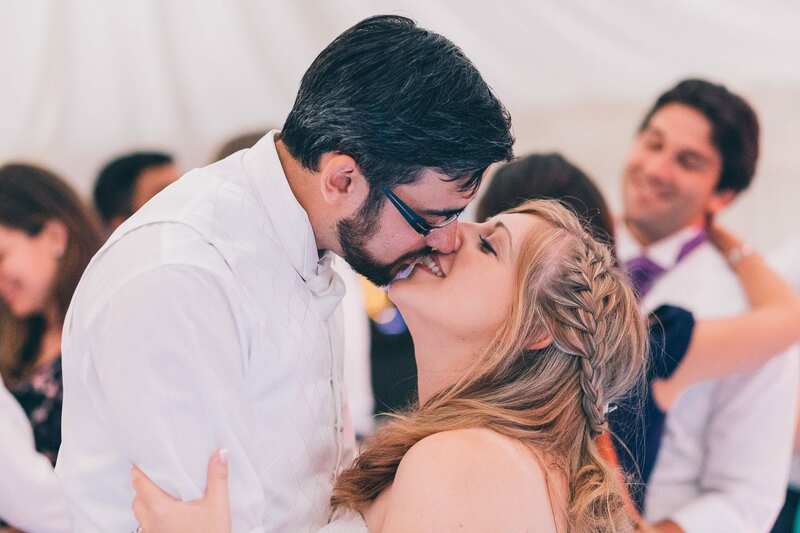 After a year or two of living together we decided to start dating, which was a surprise to us, but not so much to all of our friends. 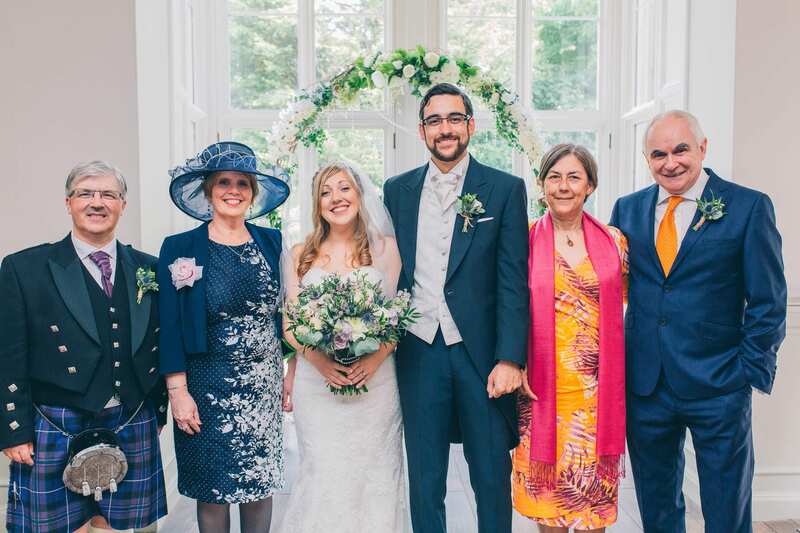 After this we then spent a year or two in separate parts of the country with Heather studying her masters in Glasgow and Me Studying my PGCE in Wolverhampton. 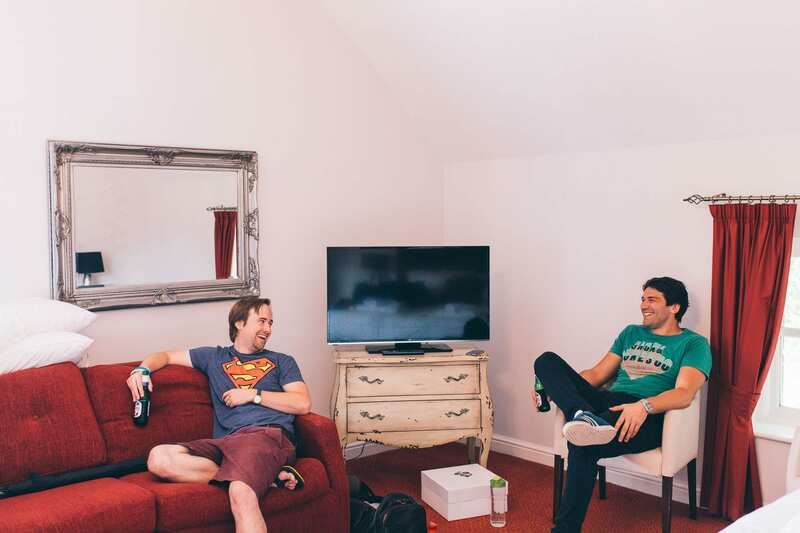 We finally moved back in together in a little flat in Cardiff bay before buying our first house together. 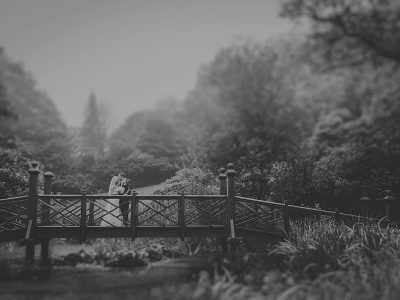 We got engaged in February, after a Wales vs Scotland match in the Millennium stadium (Wales won). 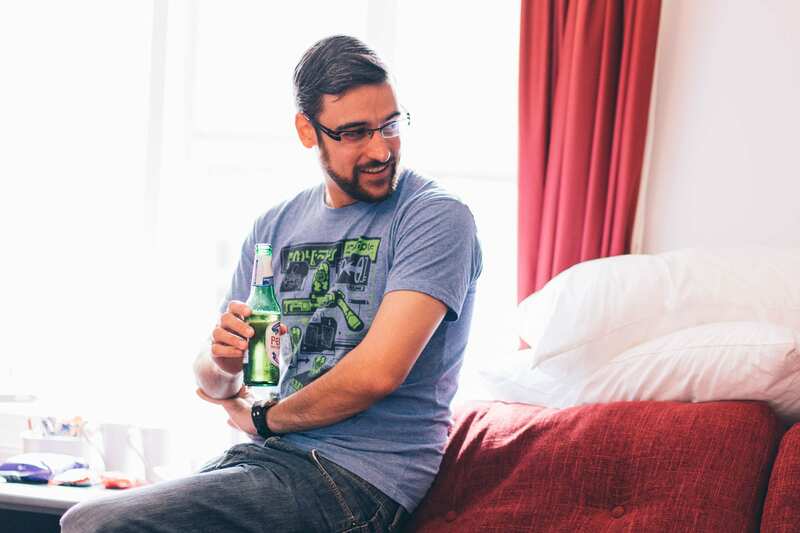 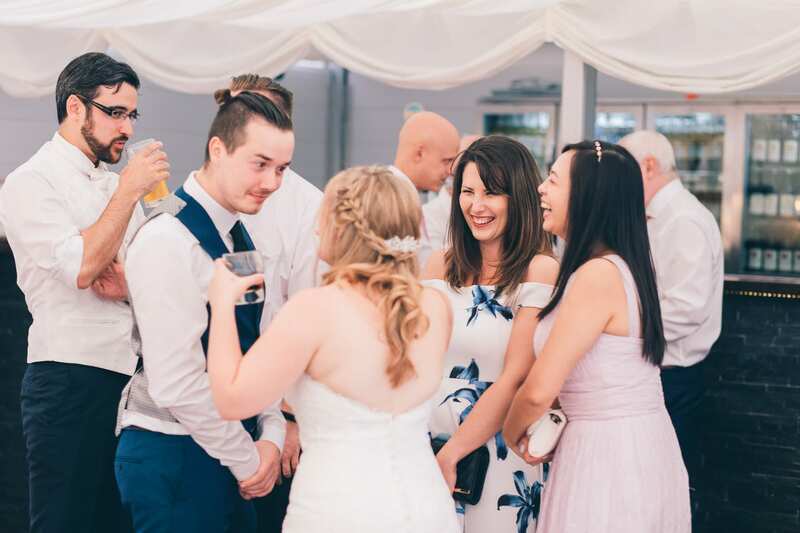 I had originally planned to propose at the stadium, but being sat next to family friends and with the floor covered in beer I decided not to do it then. 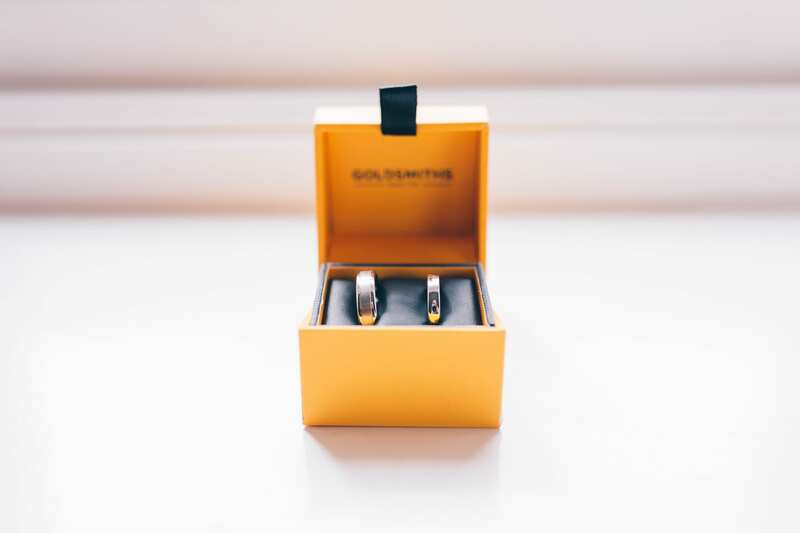 In the end I proposed at home feeling that a more intimate proposal was more our style, we were engaged for about 18 months in total. 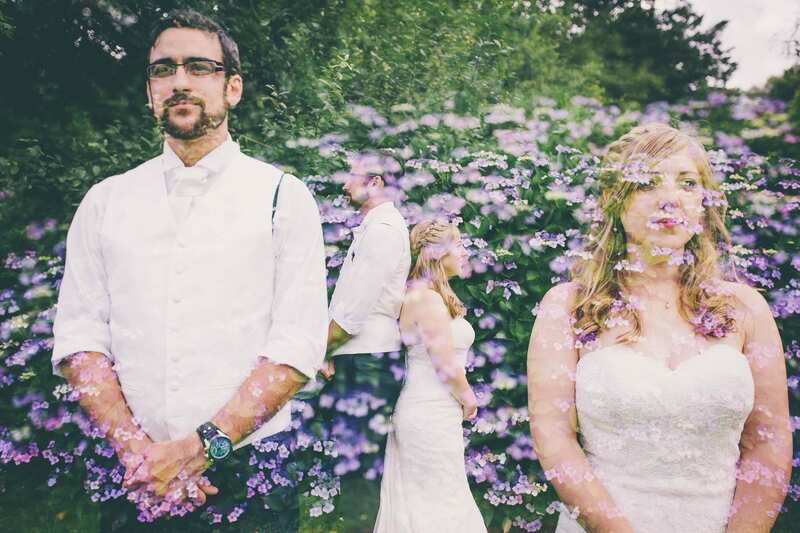 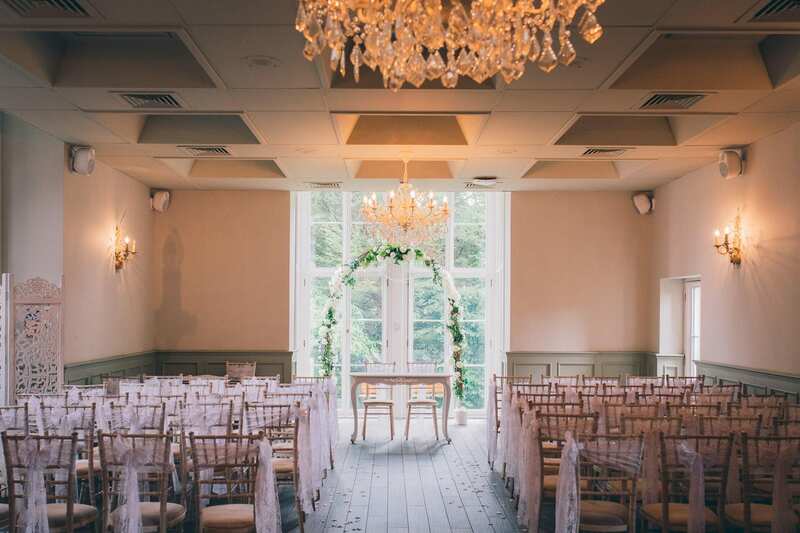 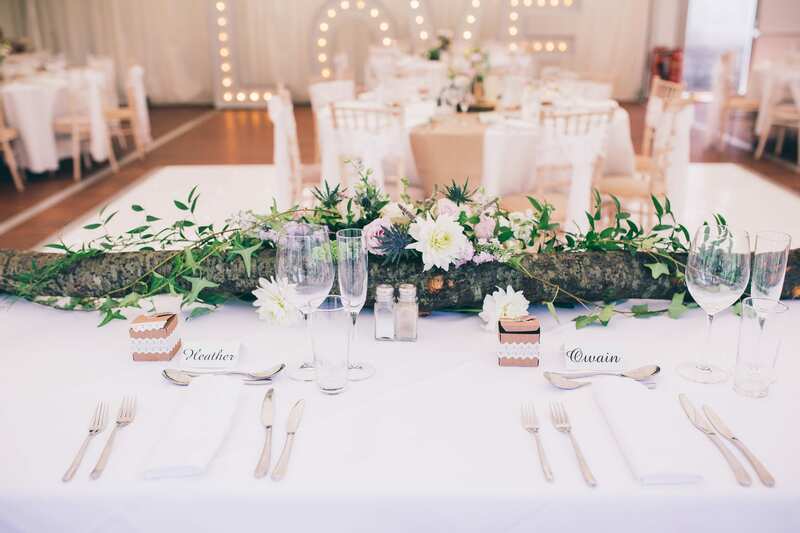 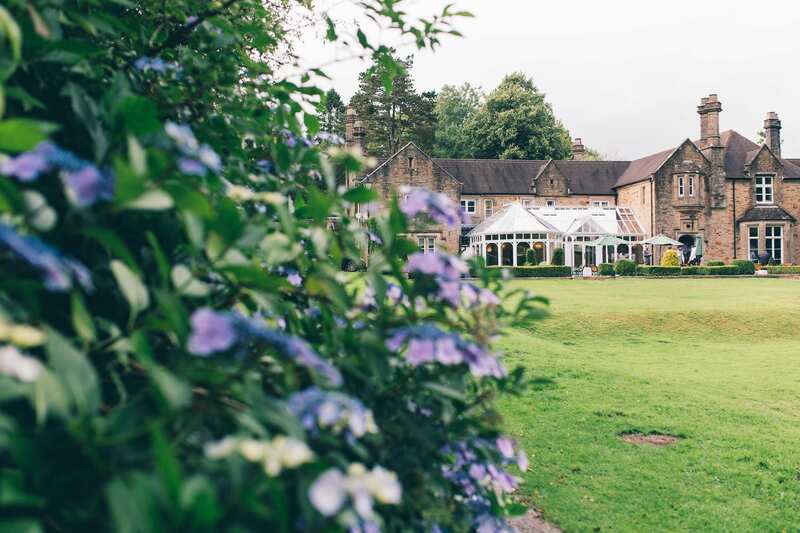 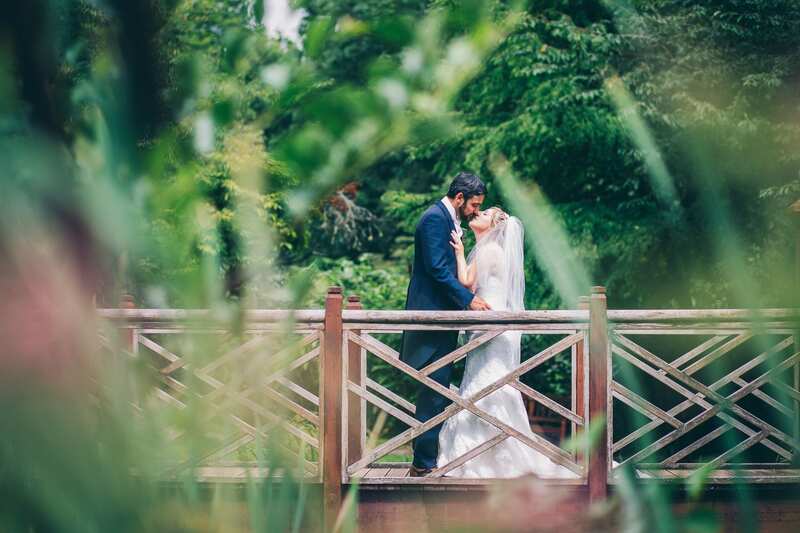 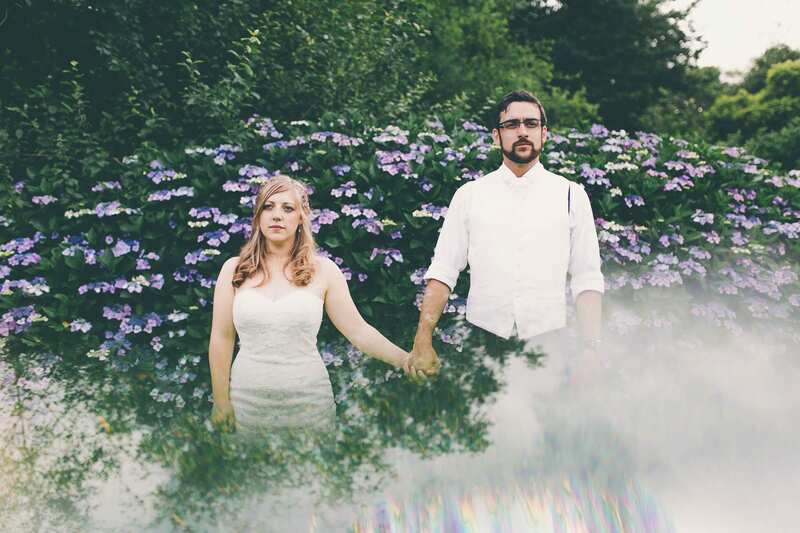 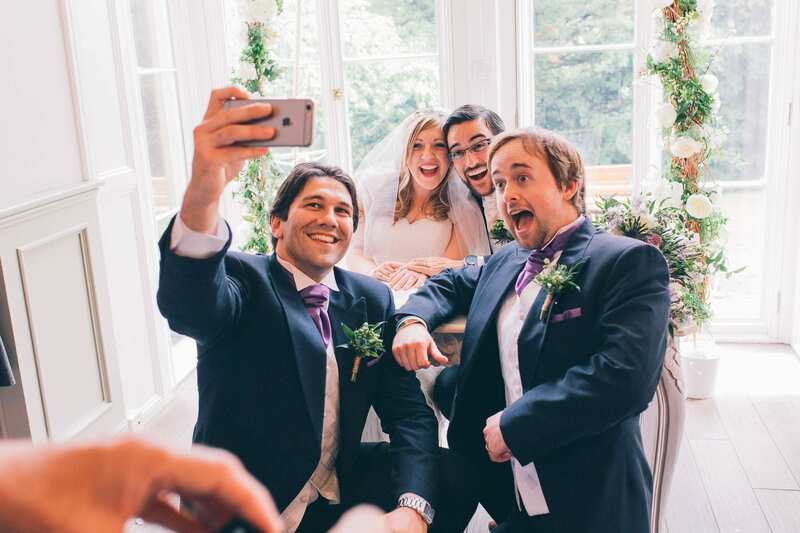 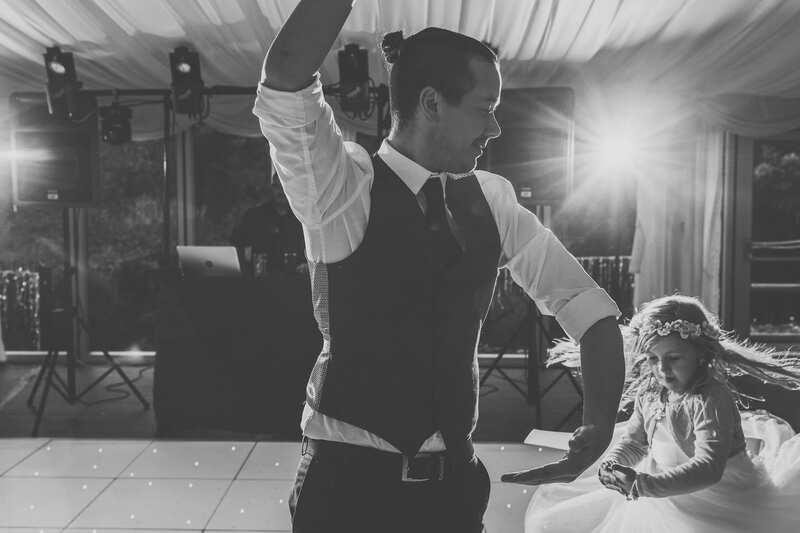 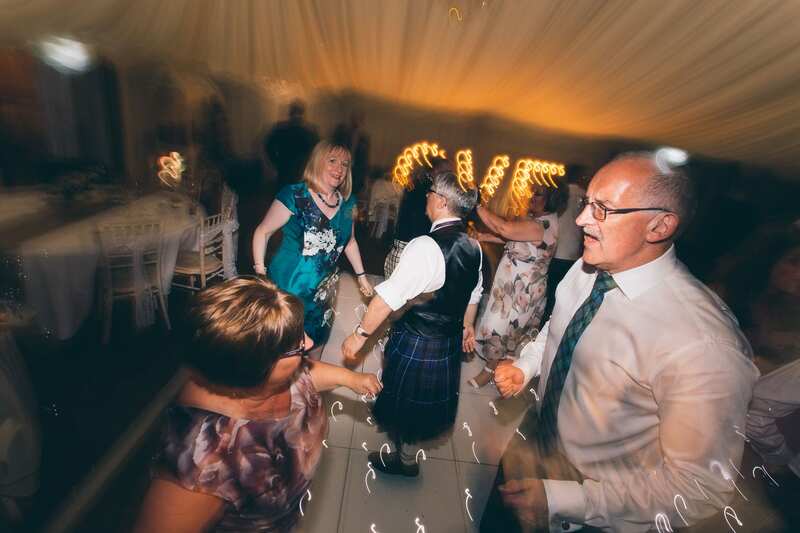 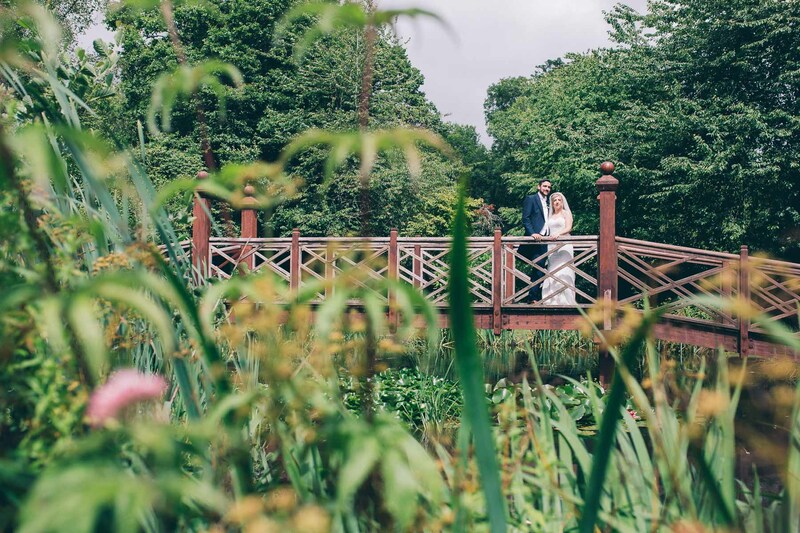 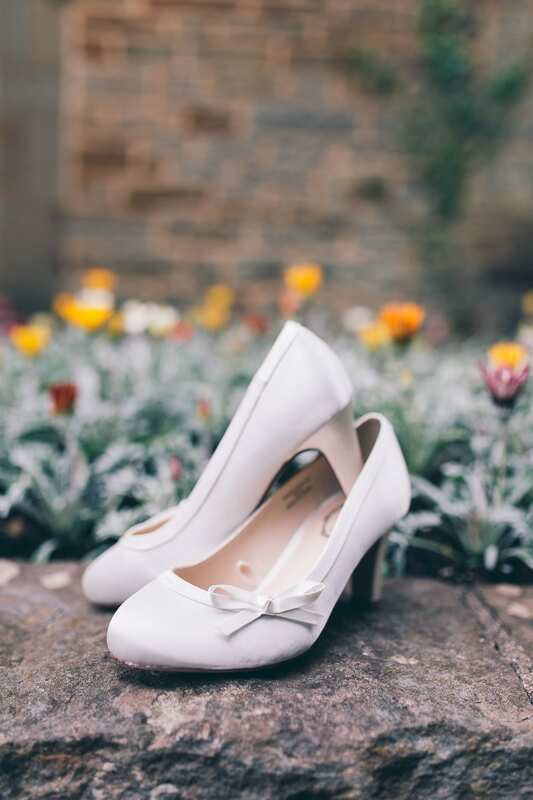 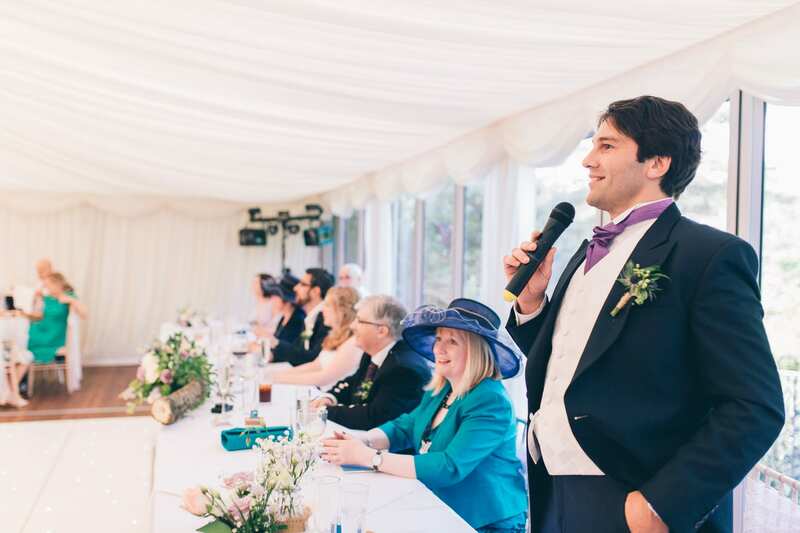 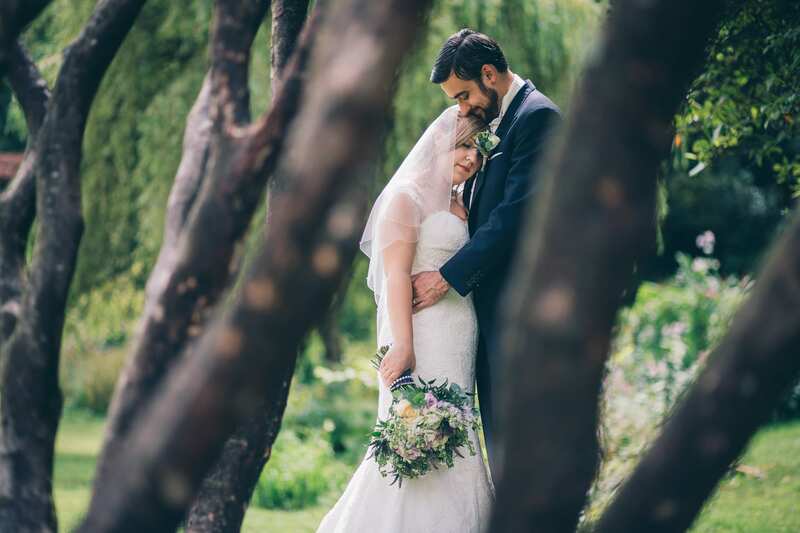 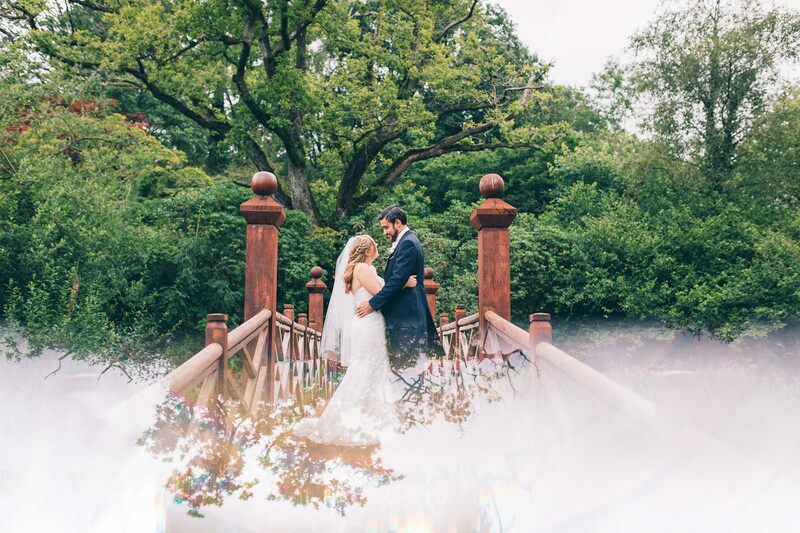 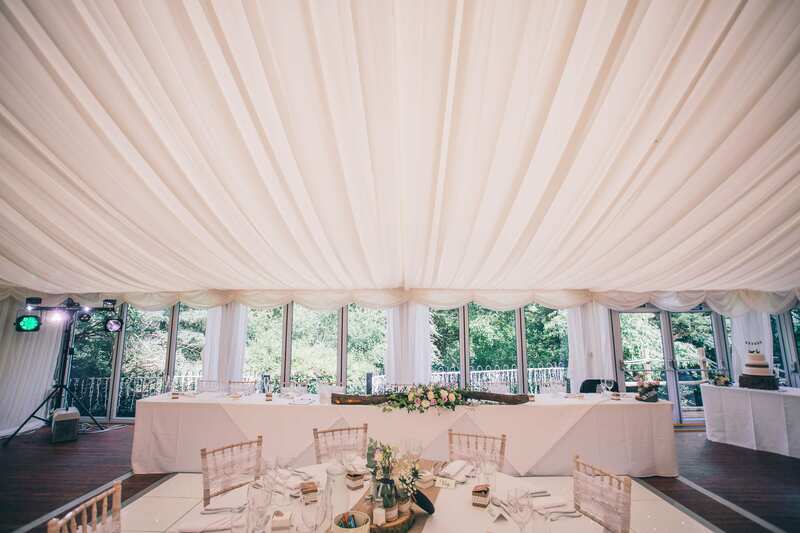 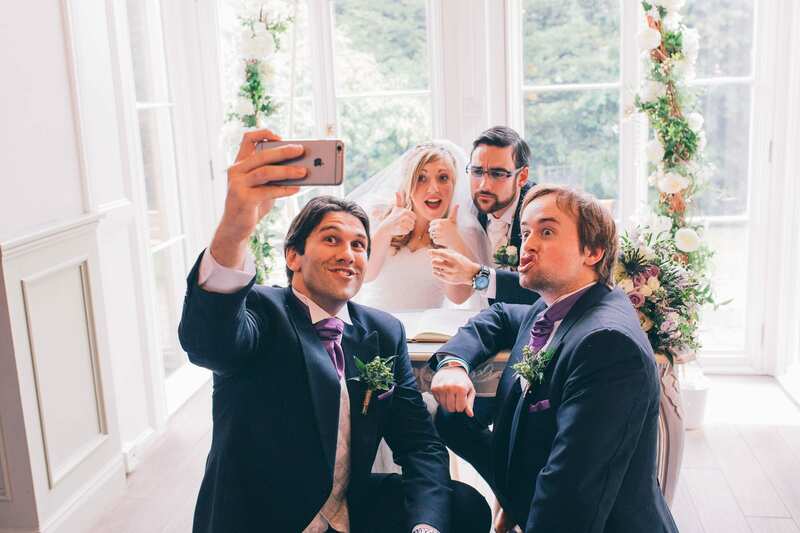 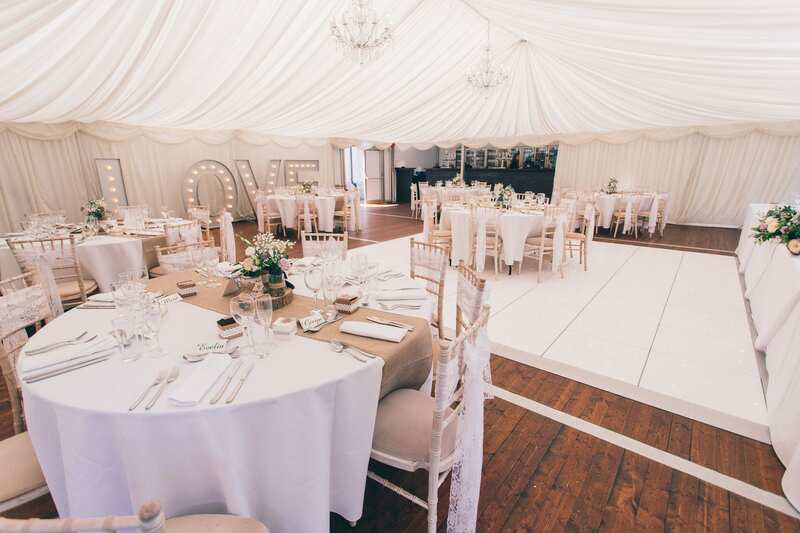 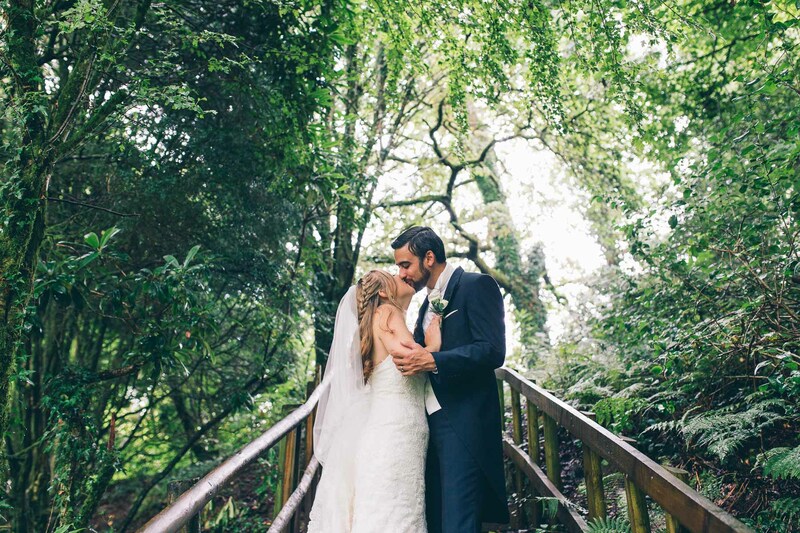 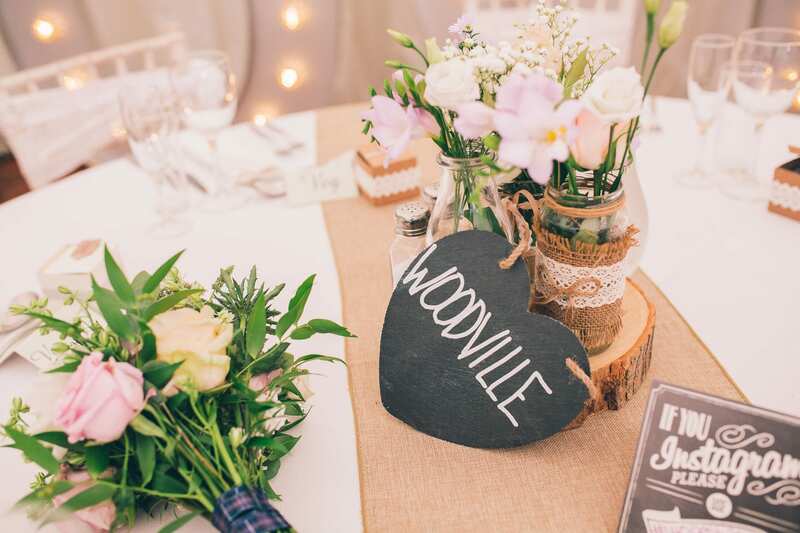 The venue was in an ideal location for us and was set in a beautiful country park. 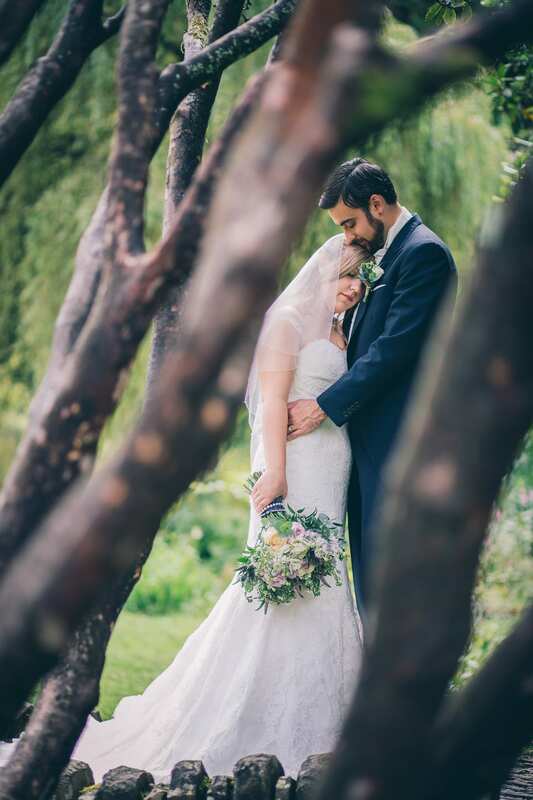 The grounds helped set the feel of our wedding and the ceremony room had a lovely bright and intimate feel. 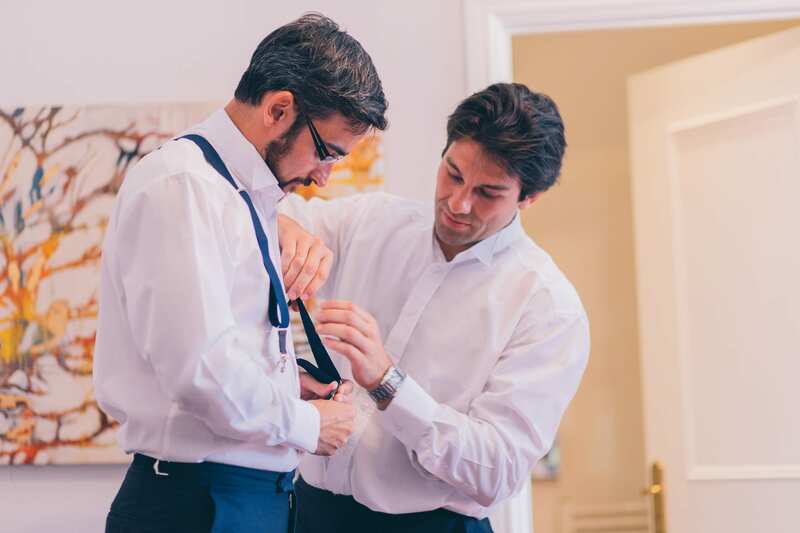 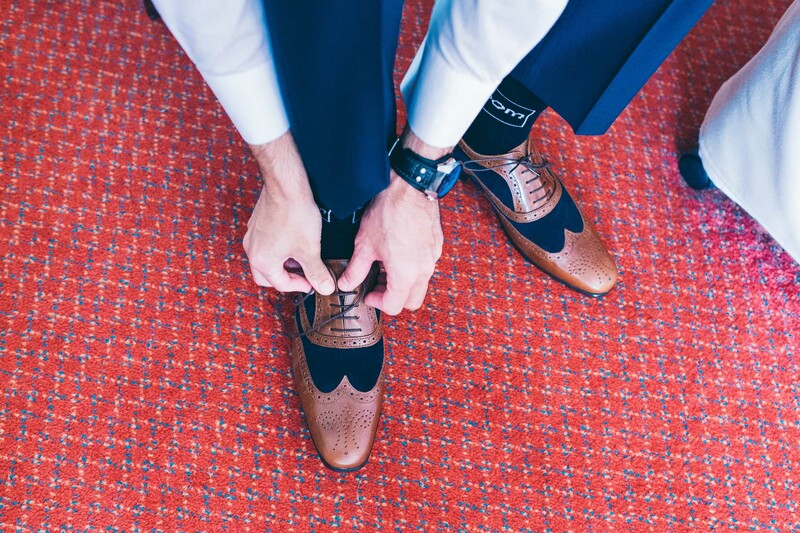 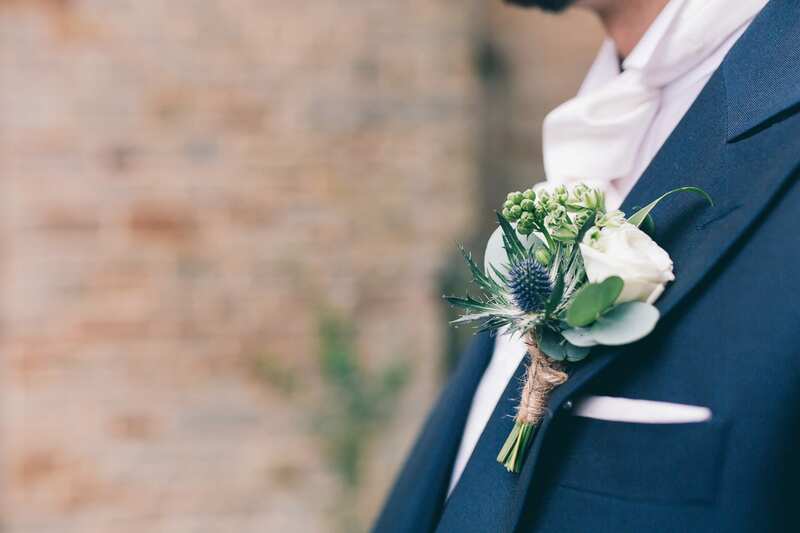 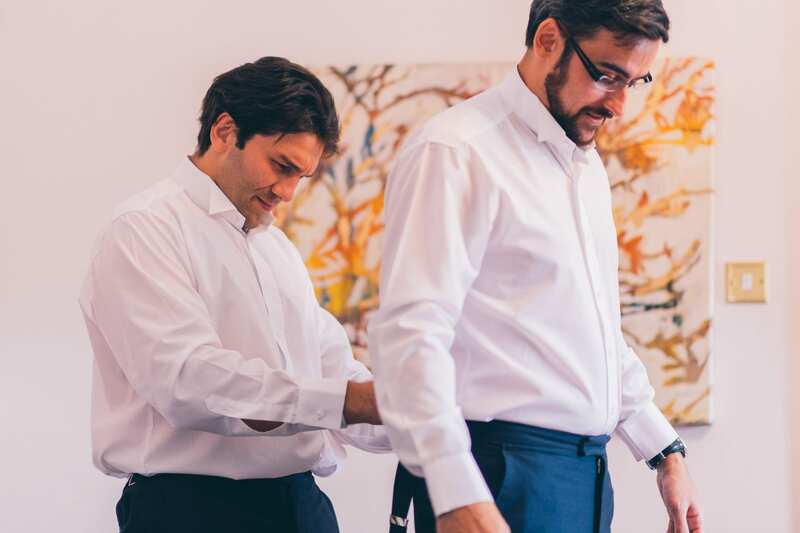 Owain – I had originally just wanted a traditional blue suit, however after trying on the tail coat I felt that would be a more special approach. 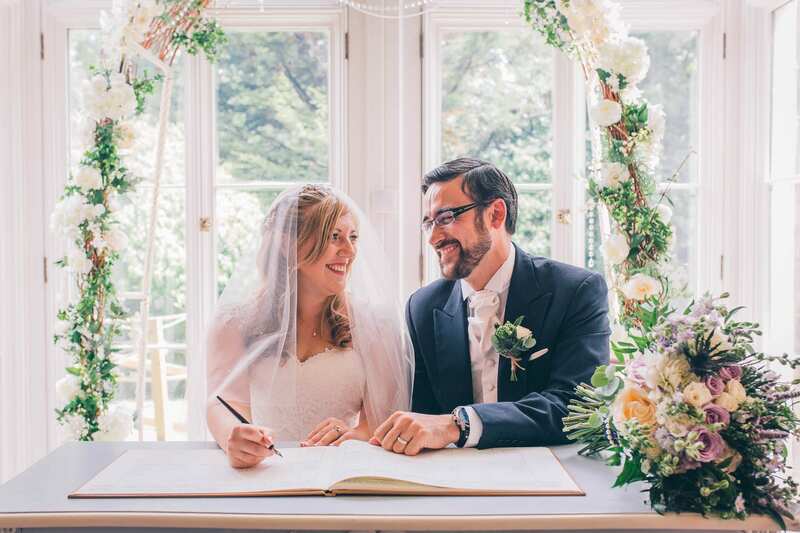 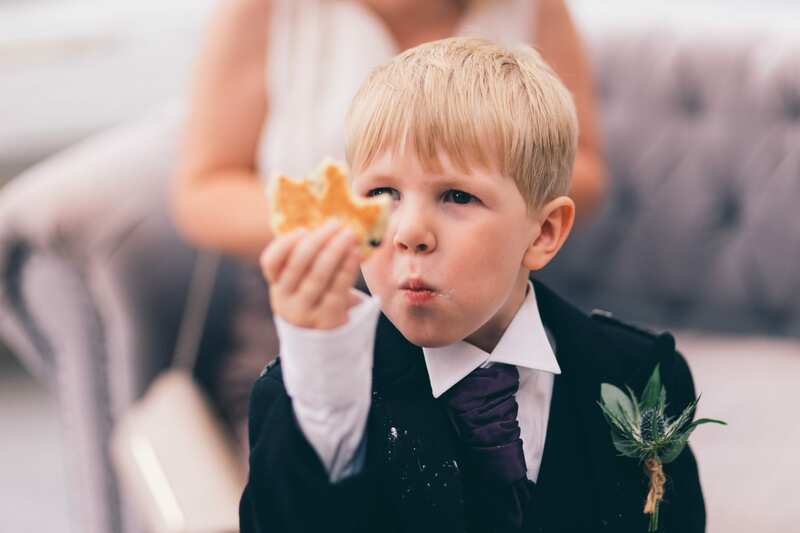 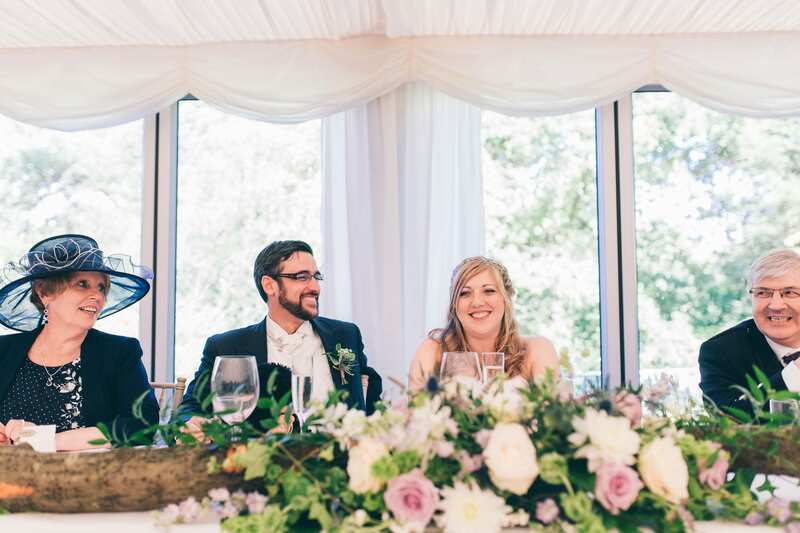 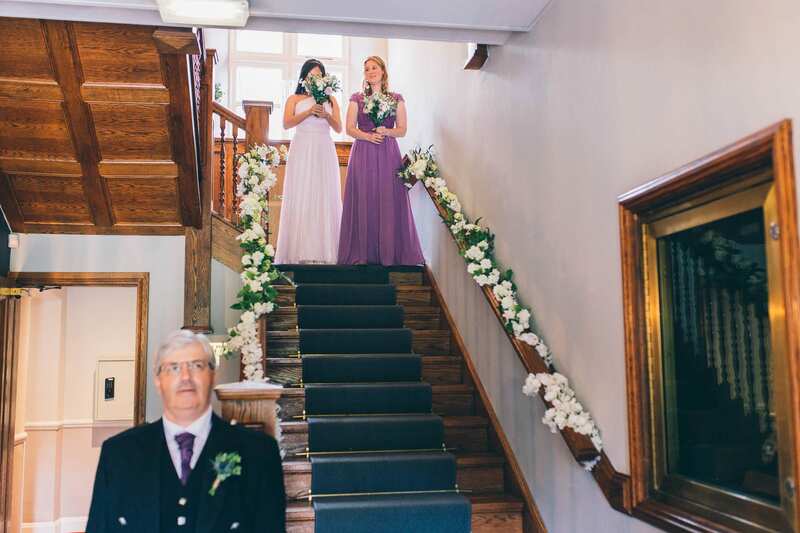 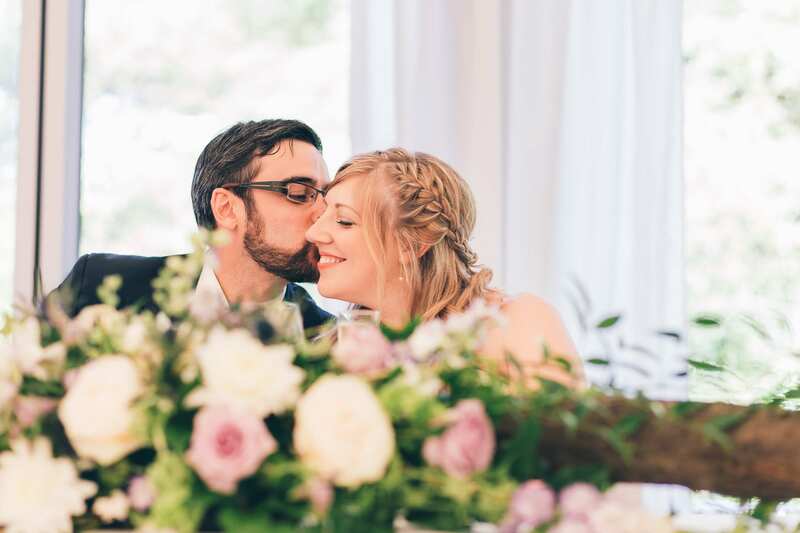 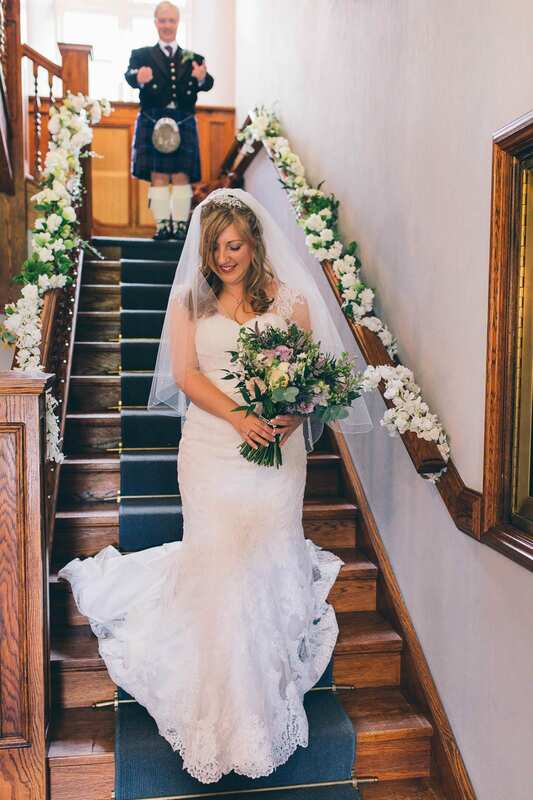 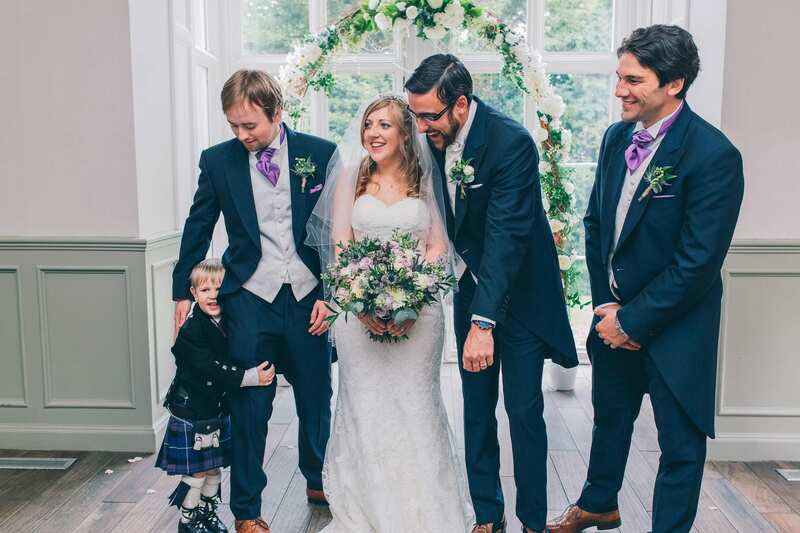 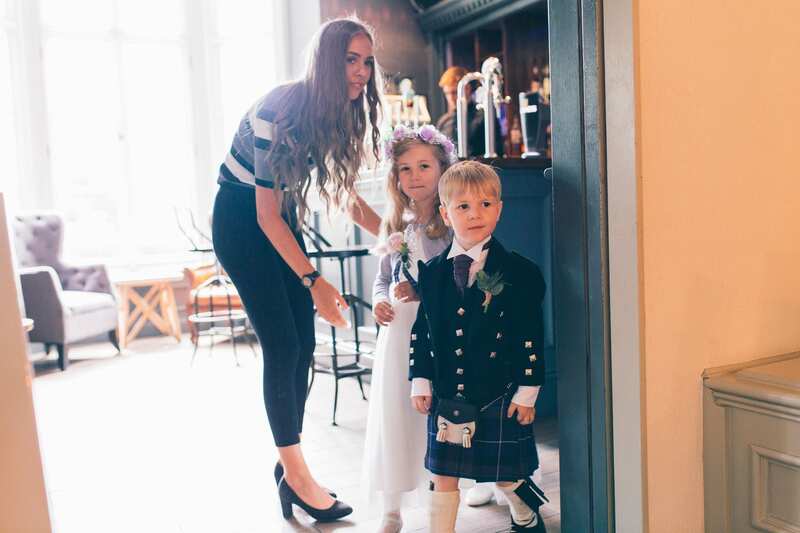 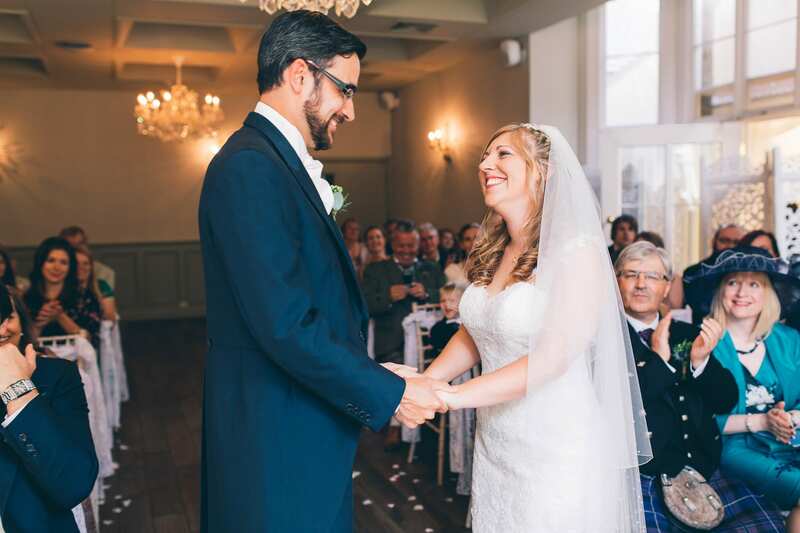 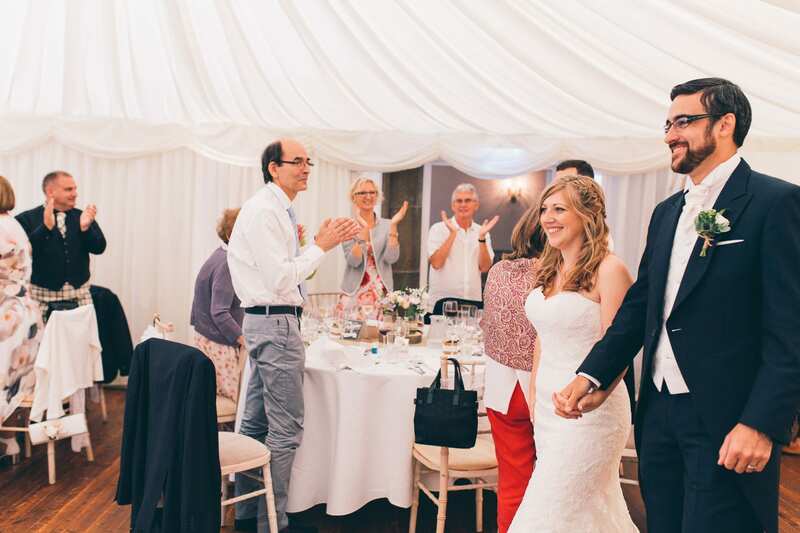 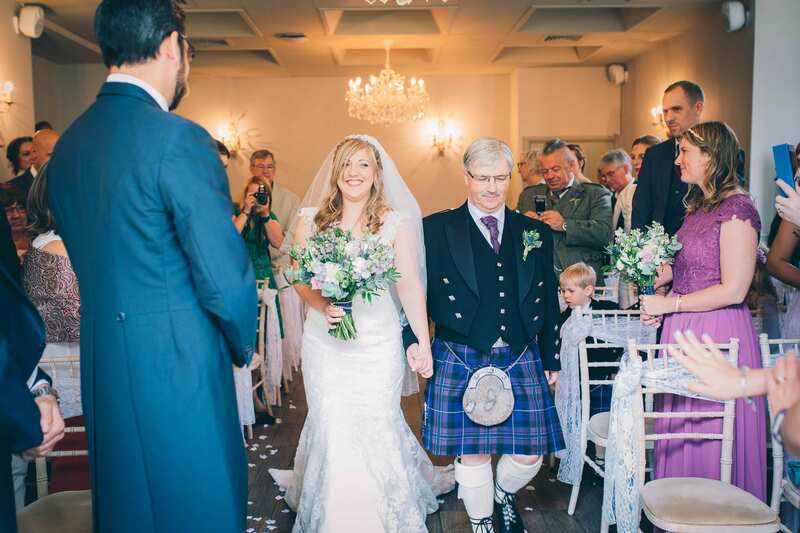 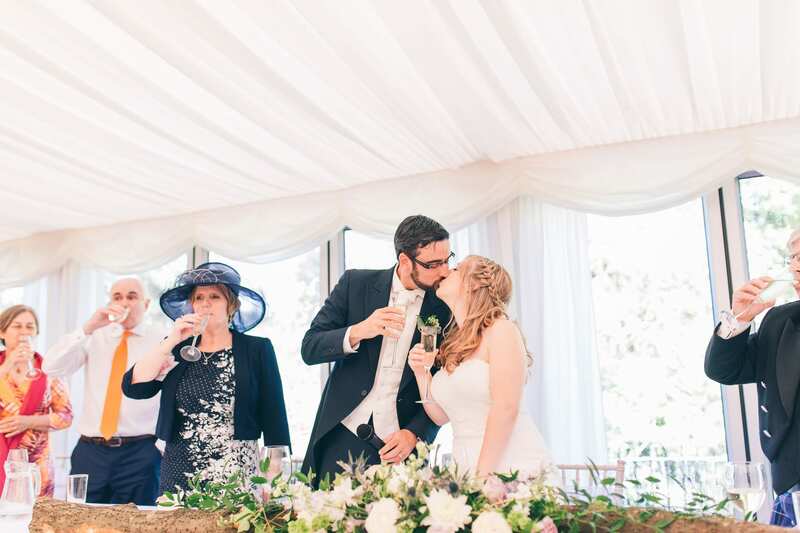 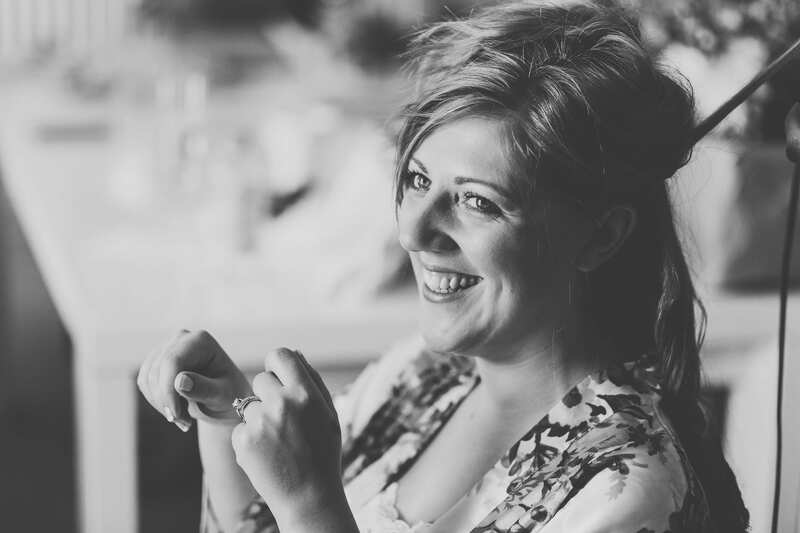 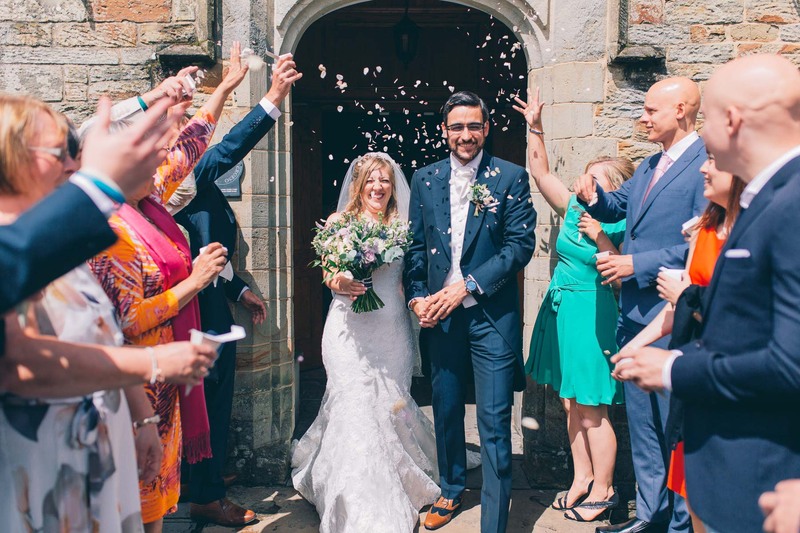 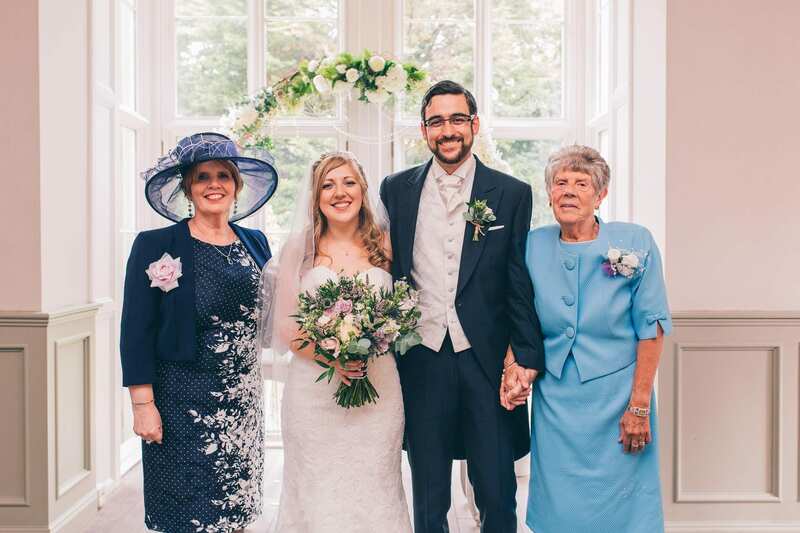 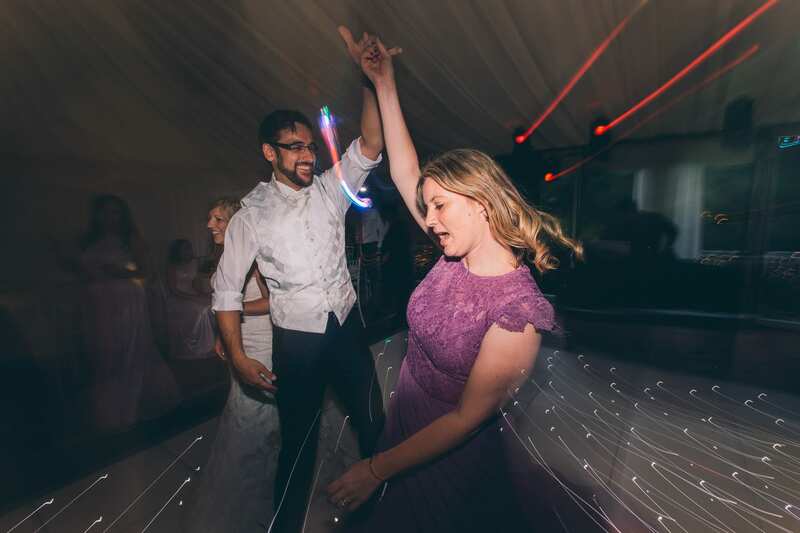 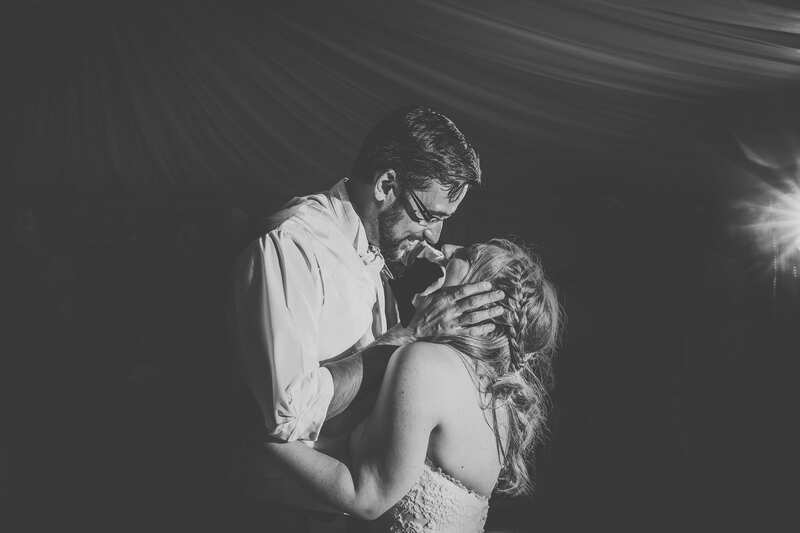 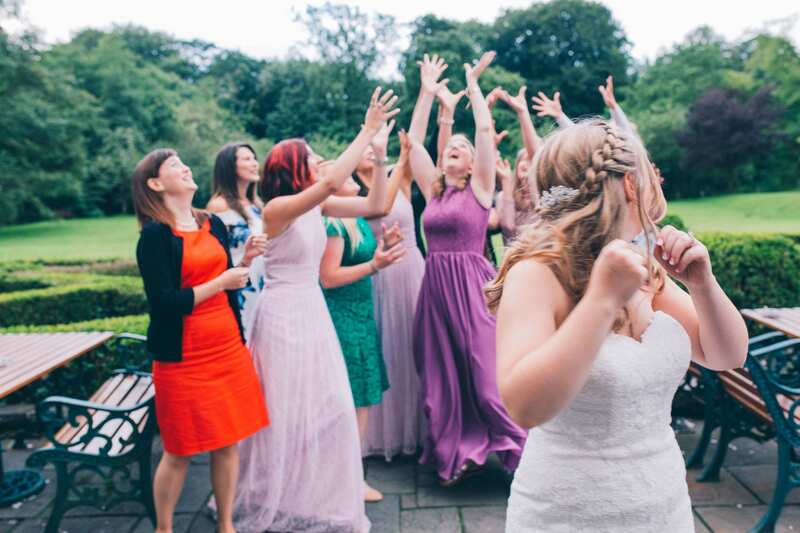 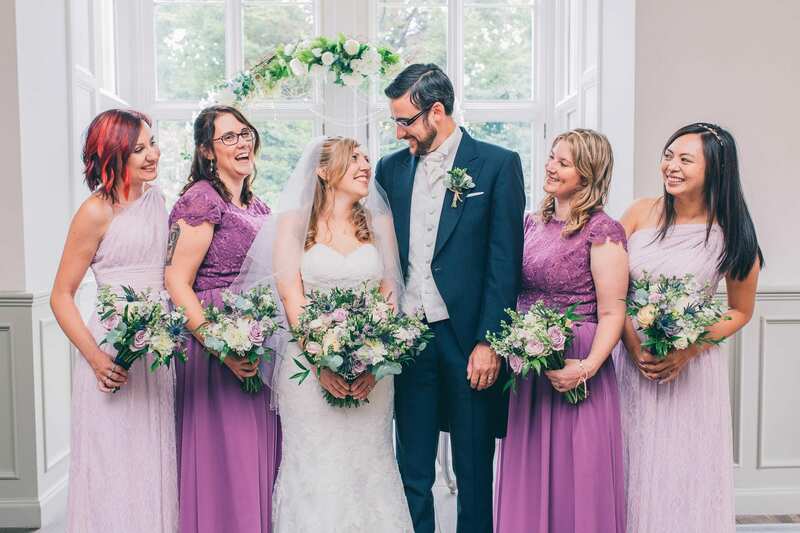 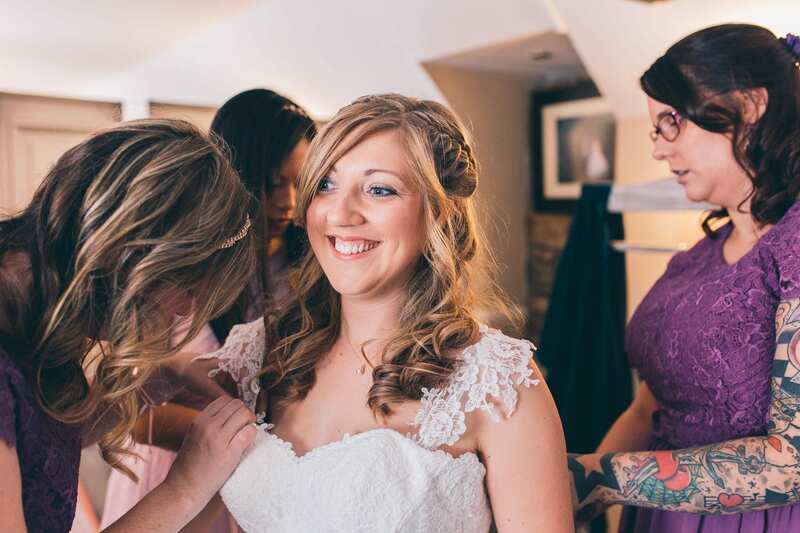 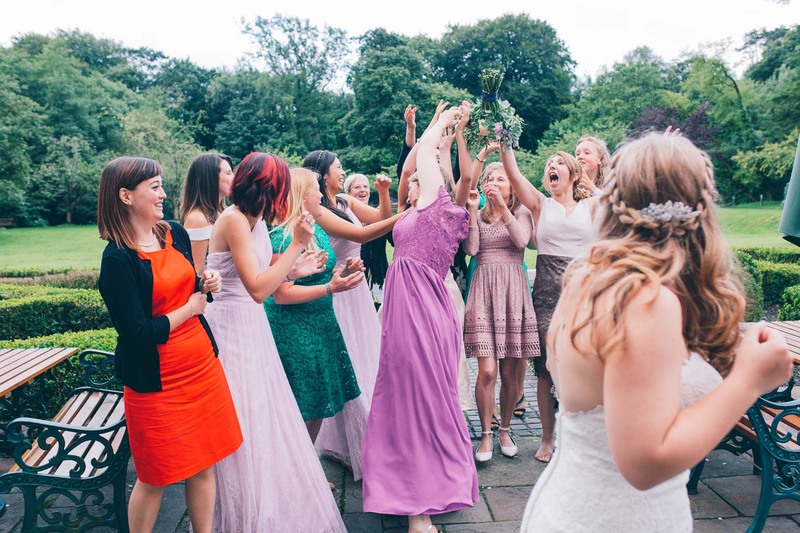 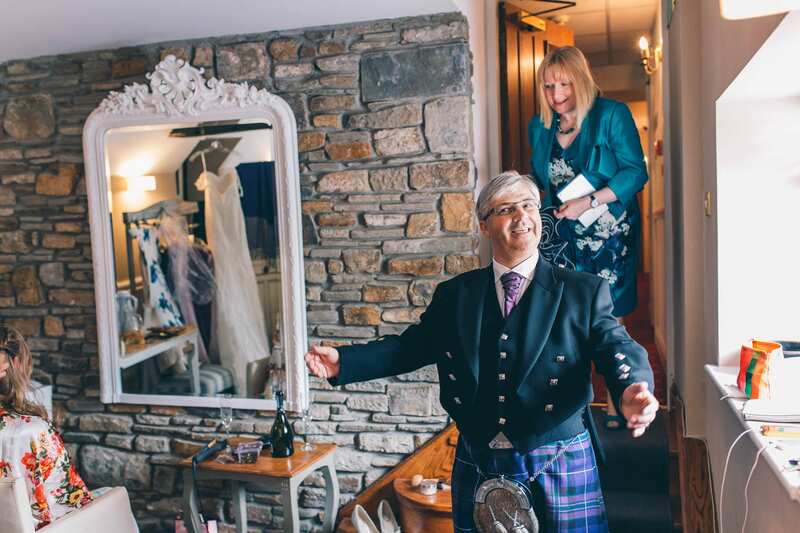 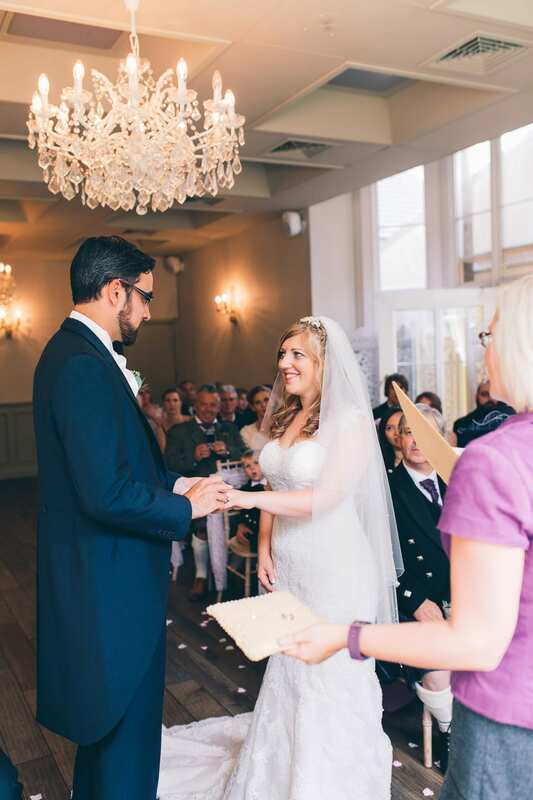 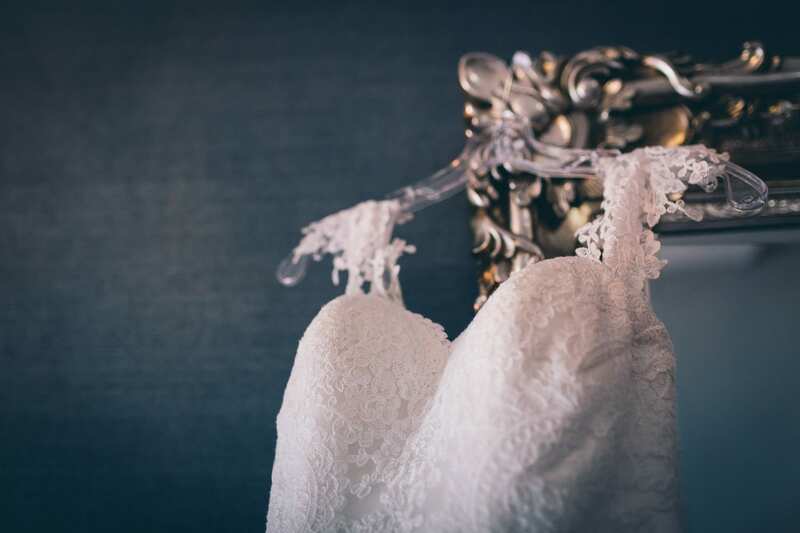 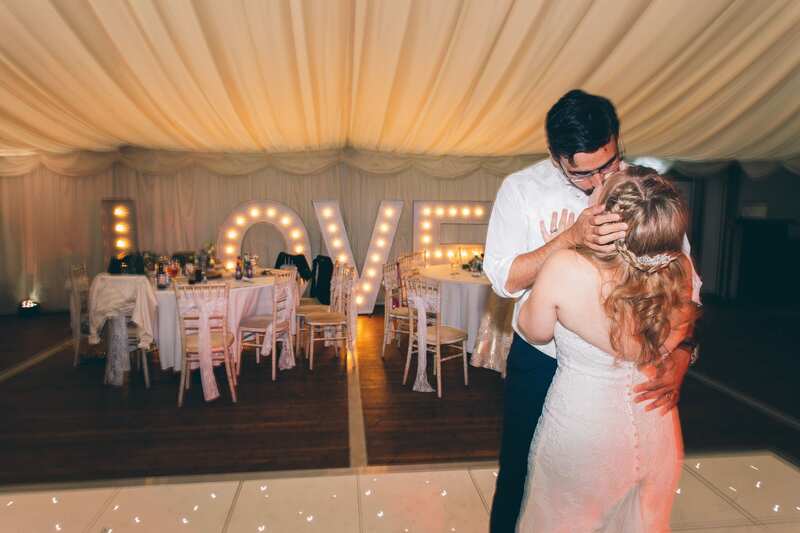 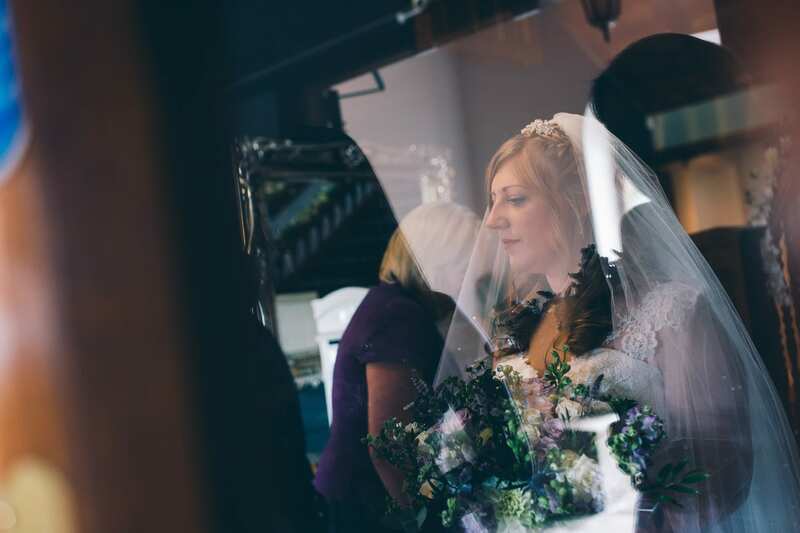 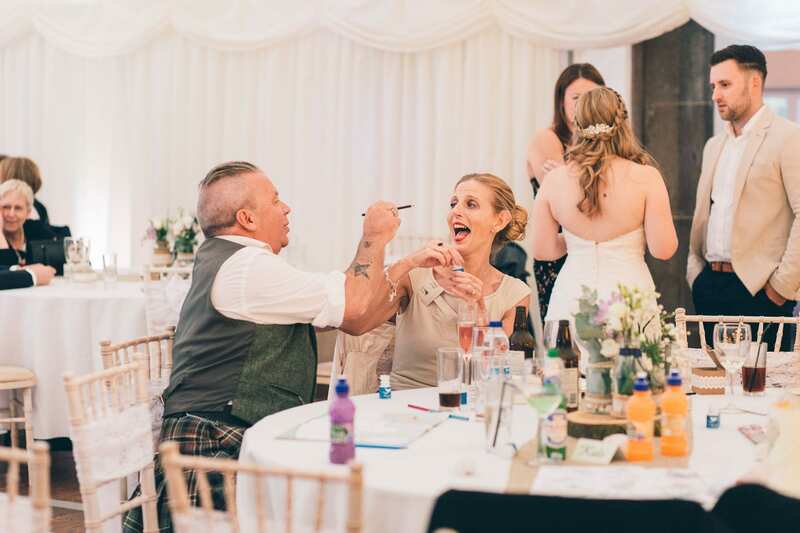 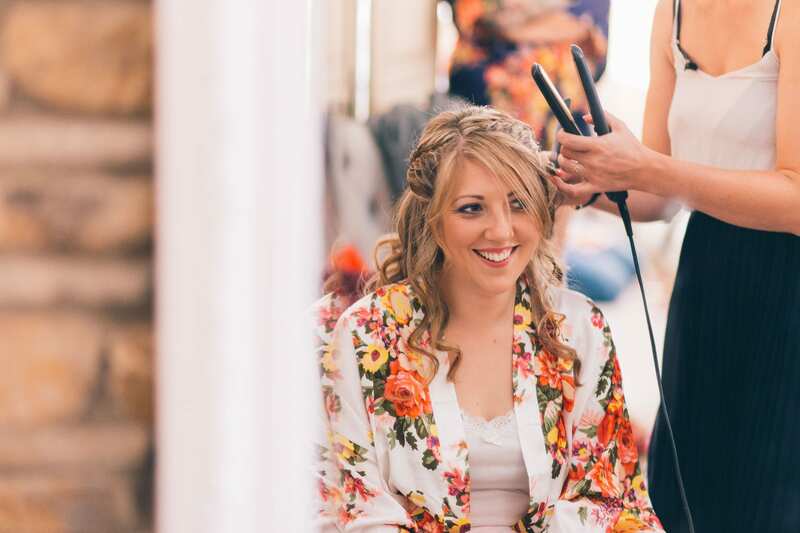 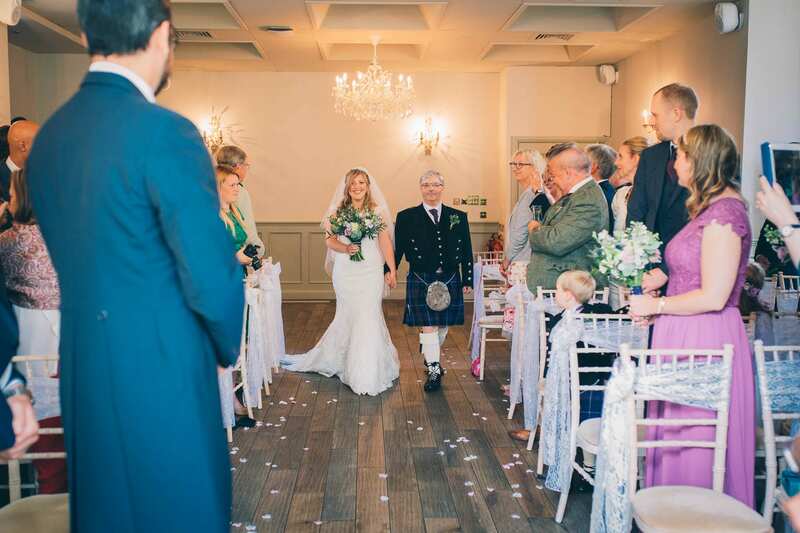 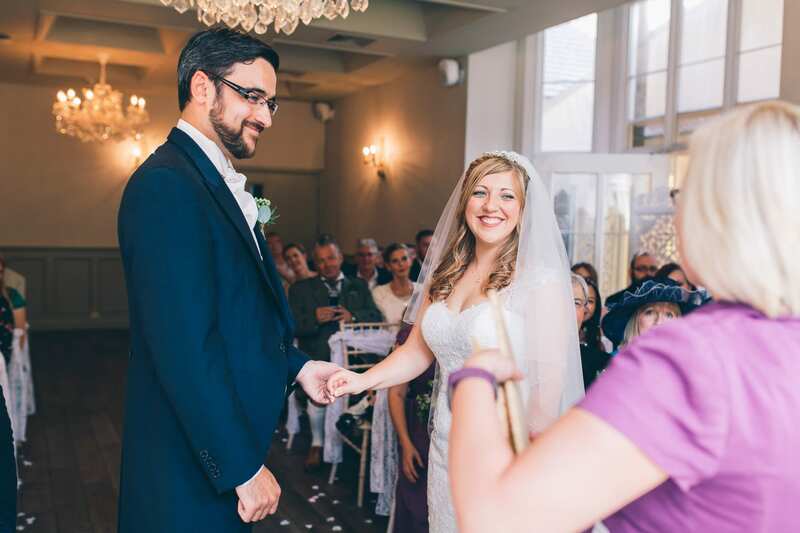 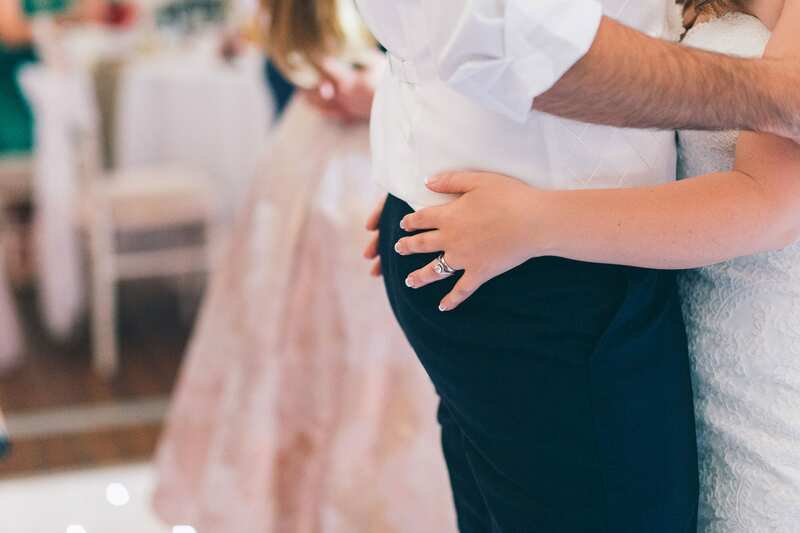 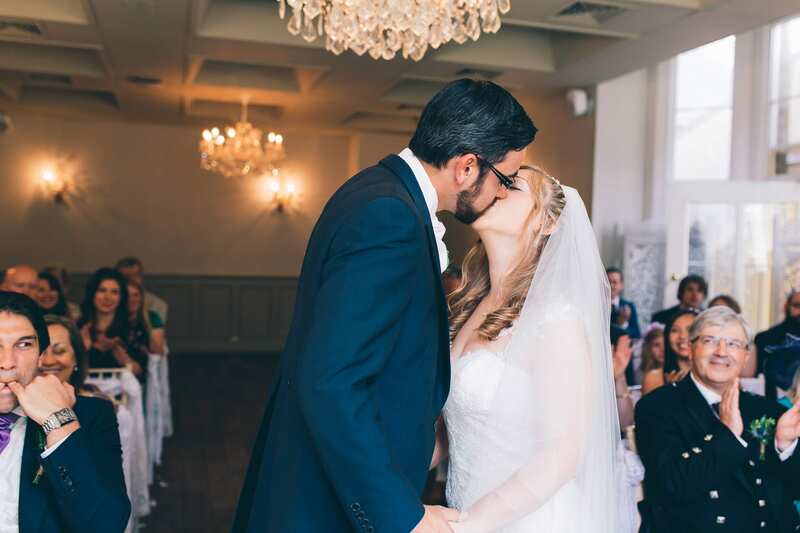 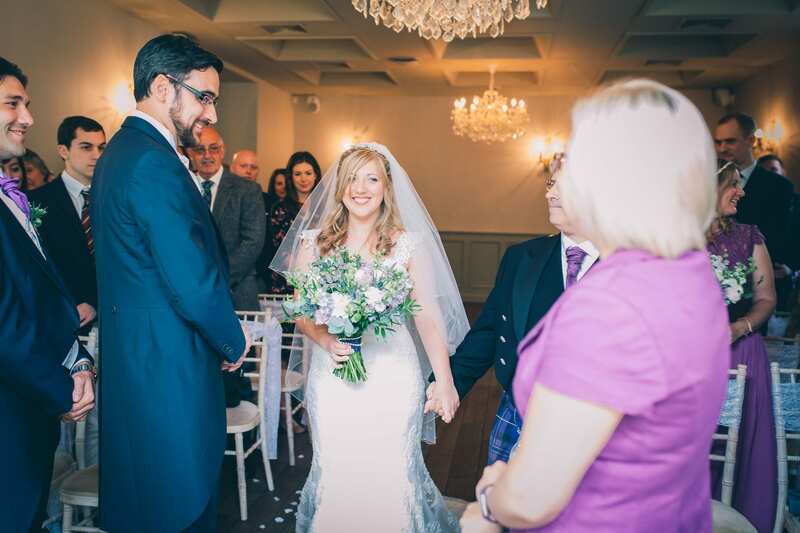 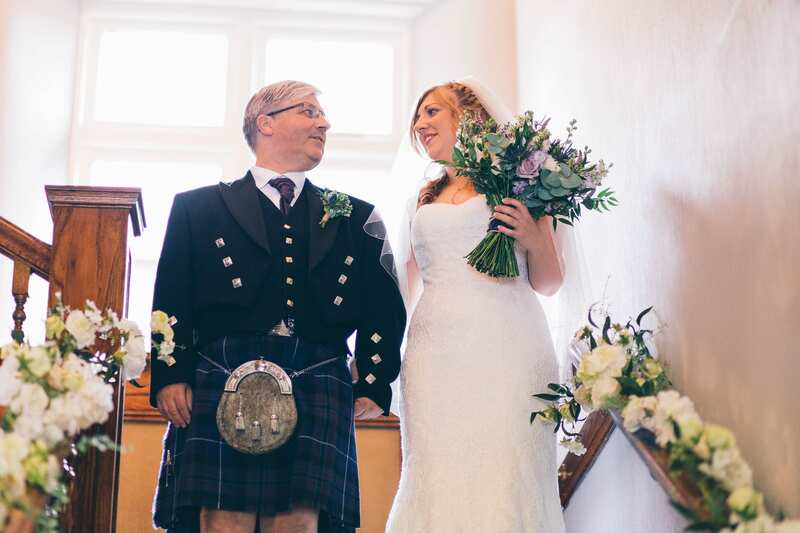 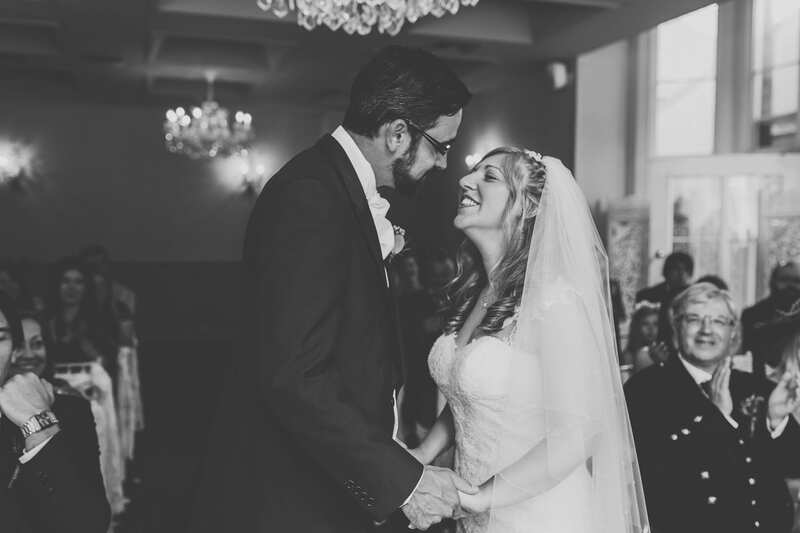 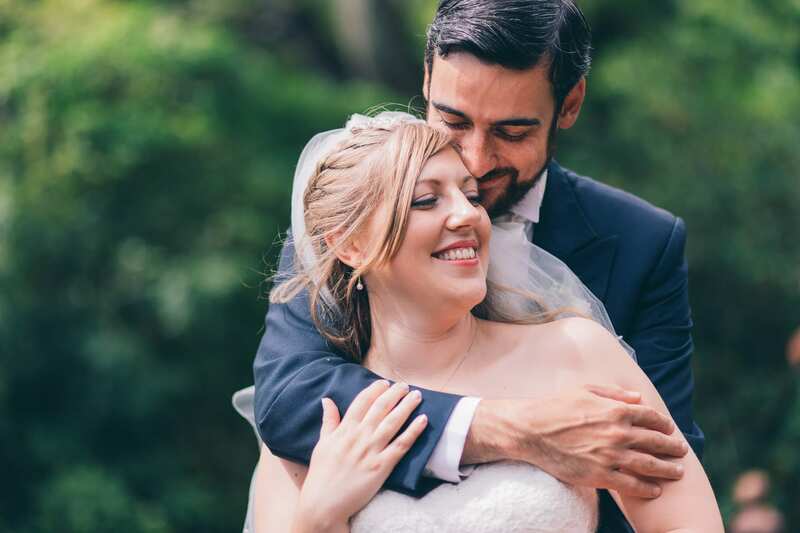 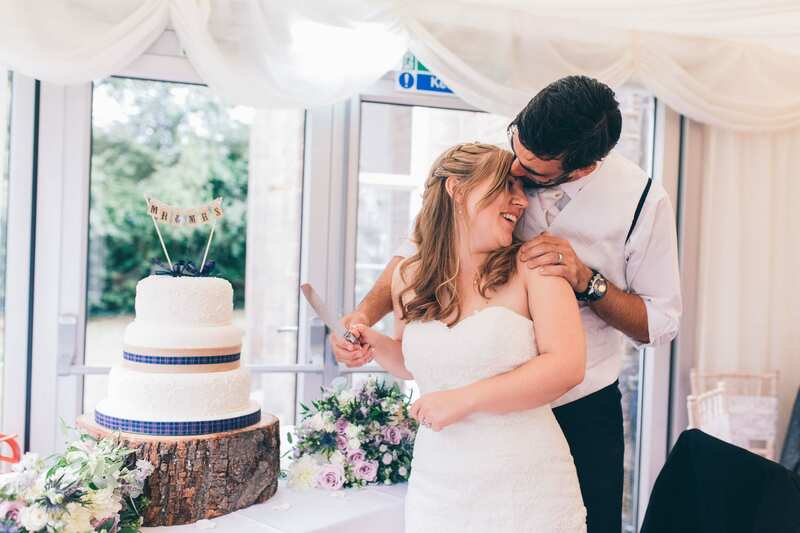 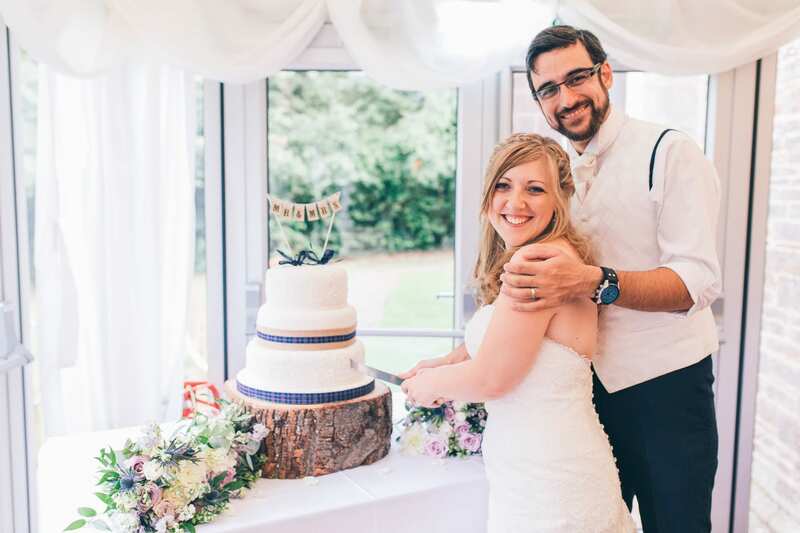 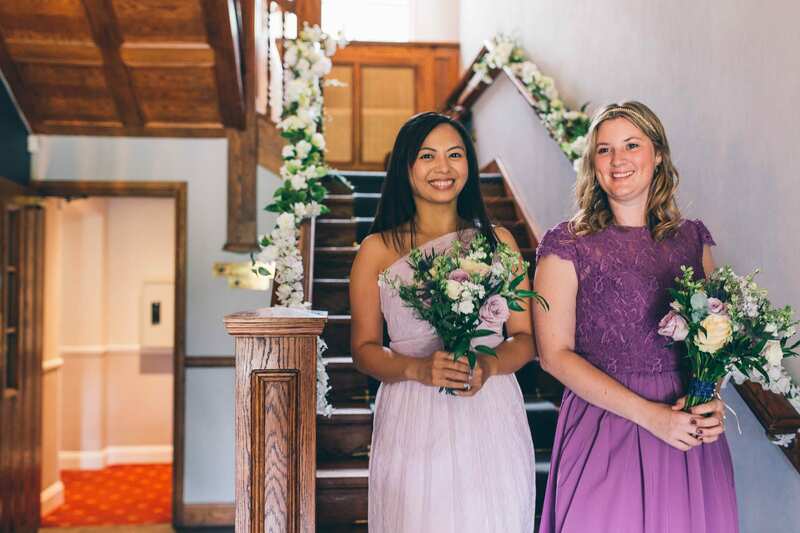 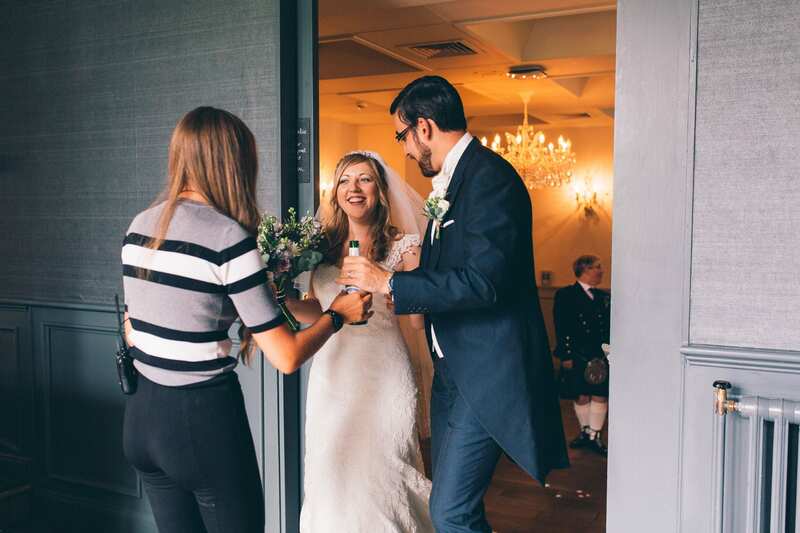 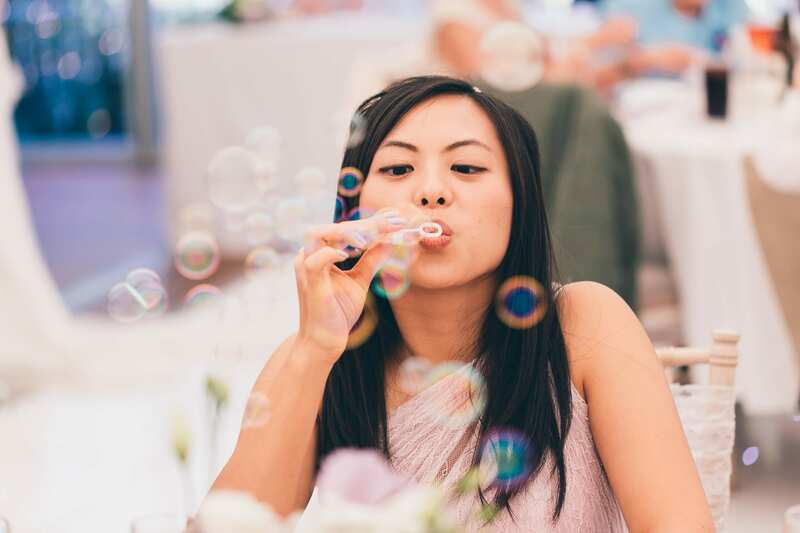 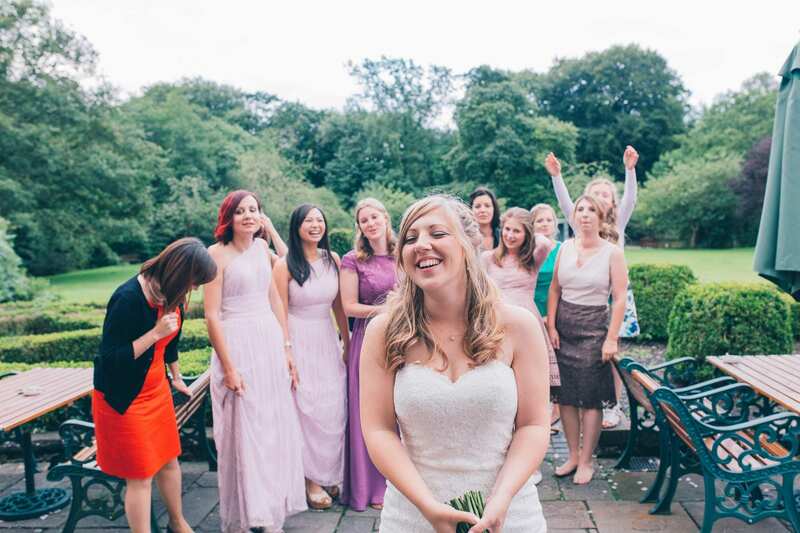 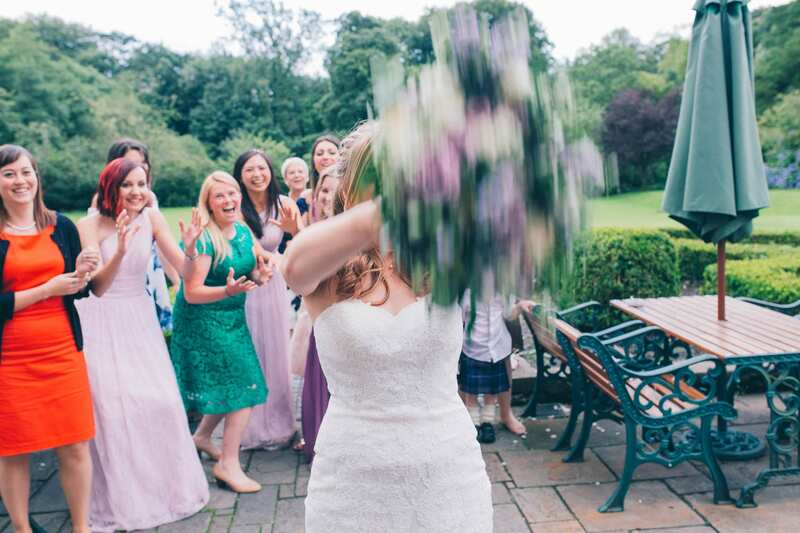 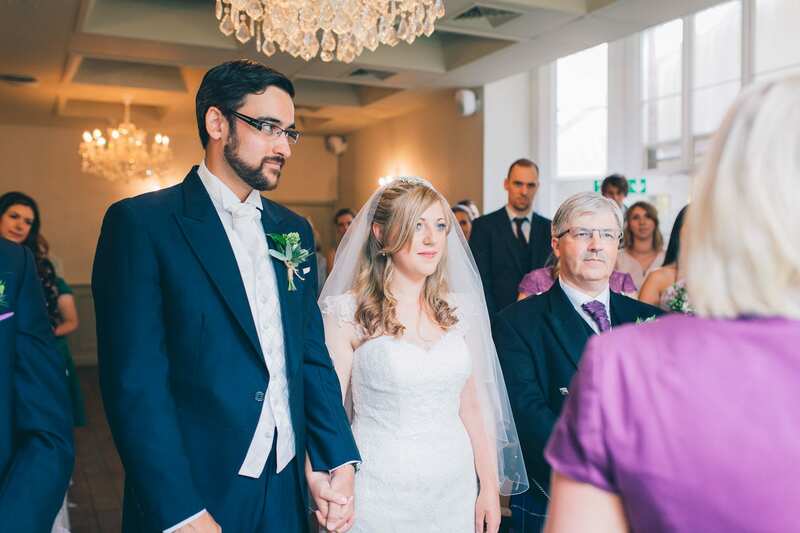 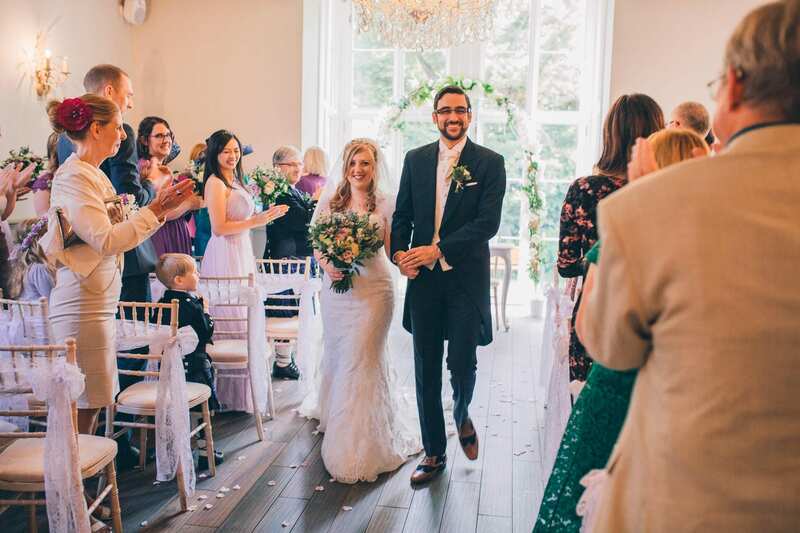 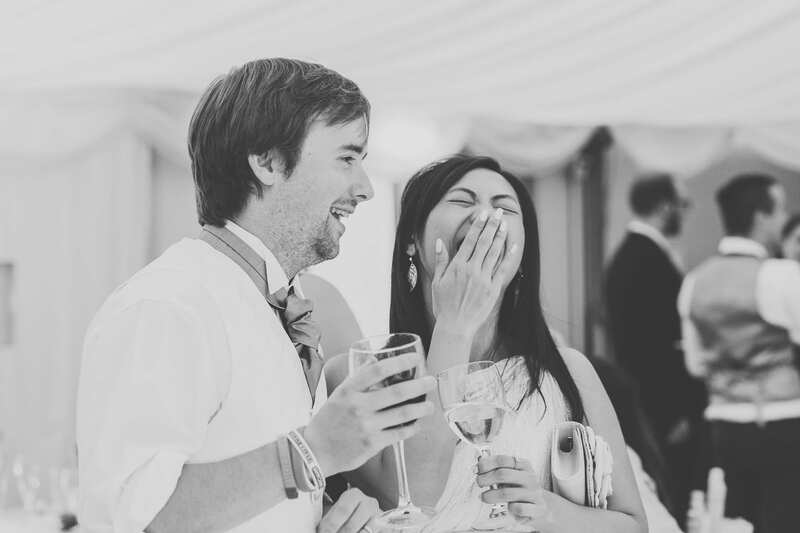 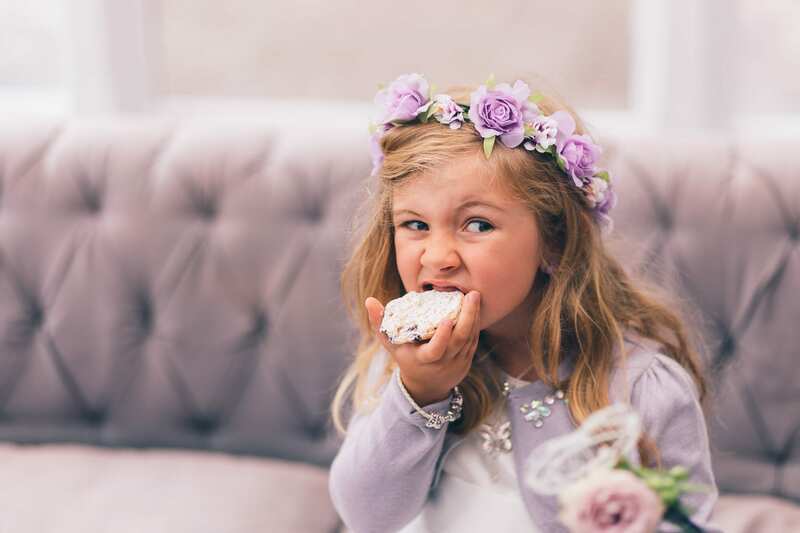 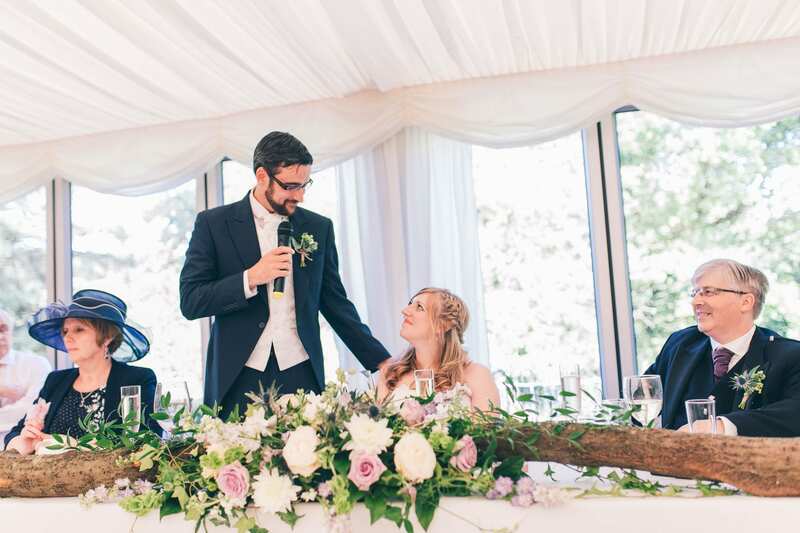 Heather – I also initially thought I would go for something very different to what I chose, I was going to wear a ball gown/a line gown but I tried on a fishtail dress that really flattered my figure, that I didn’t know had! 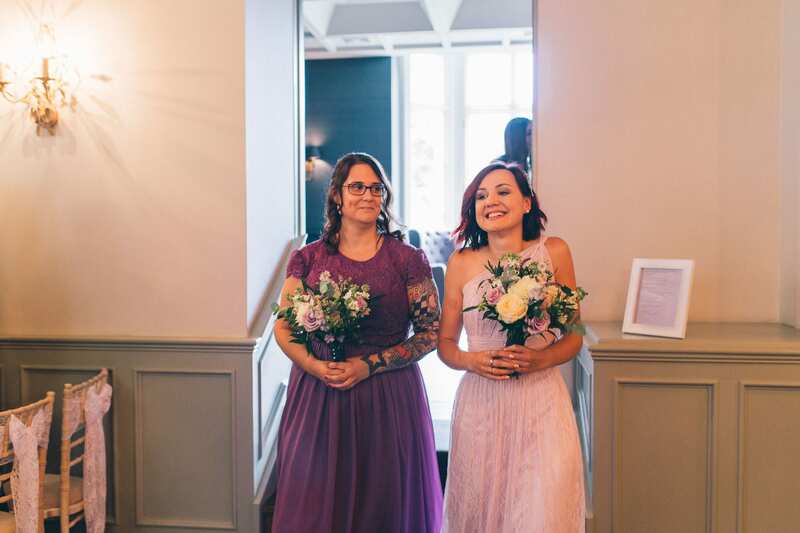 It made me feel special and people commented on me in the dress, rather than the dress, which just made me feel wonderful! 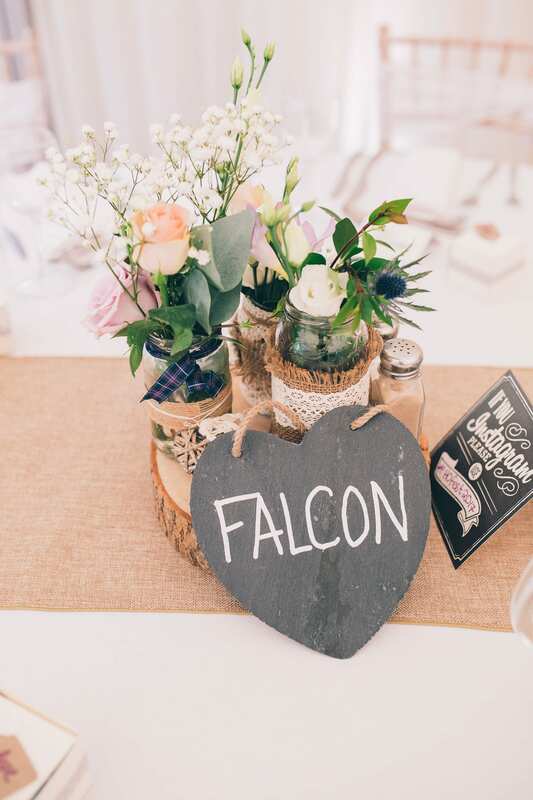 I wanted a theme that was relaxed and didn’t put too much pressure on us or the guests, since we are quite a relaxed couple. 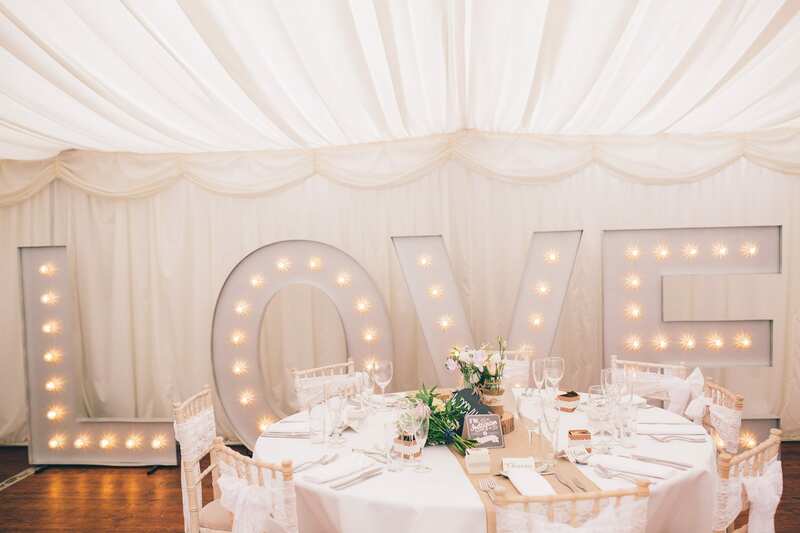 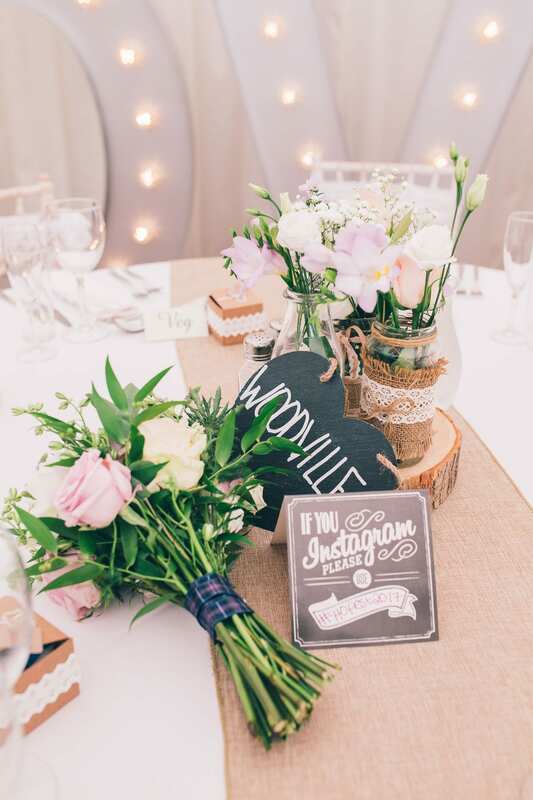 We ended up with a more vintage theme that suited the venue well. 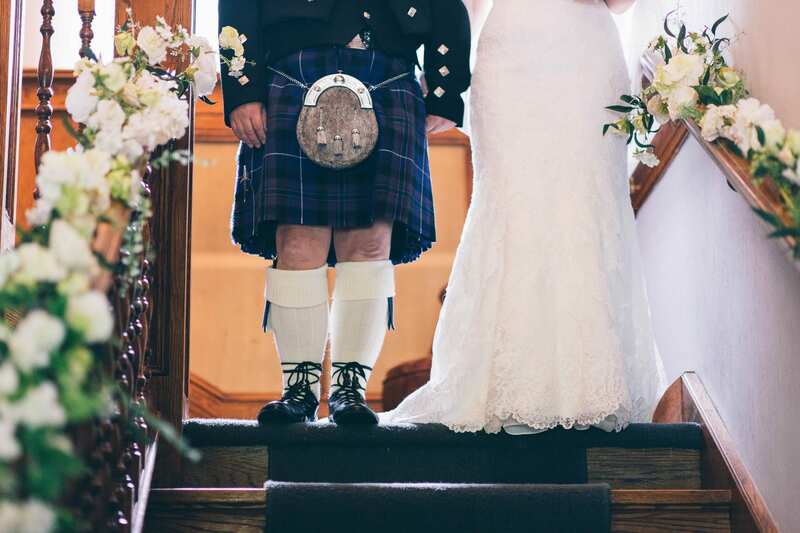 I have a Scottish background and I wanted to bring that out in some of the decor. 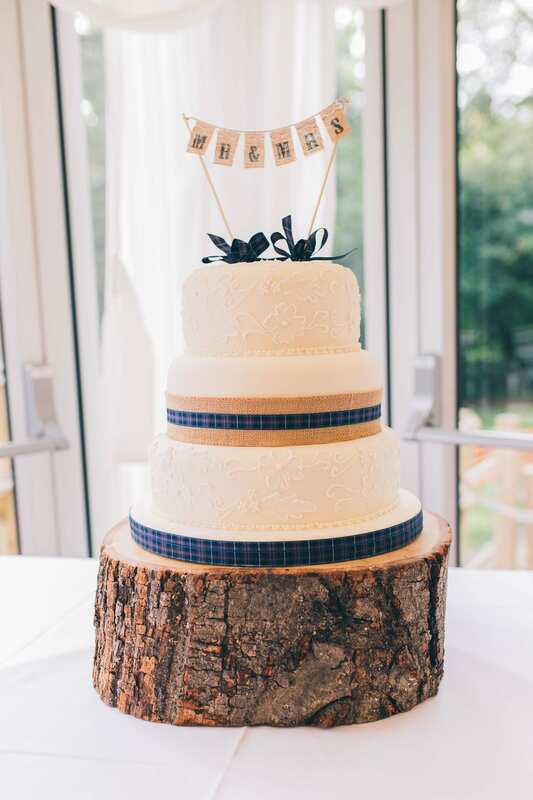 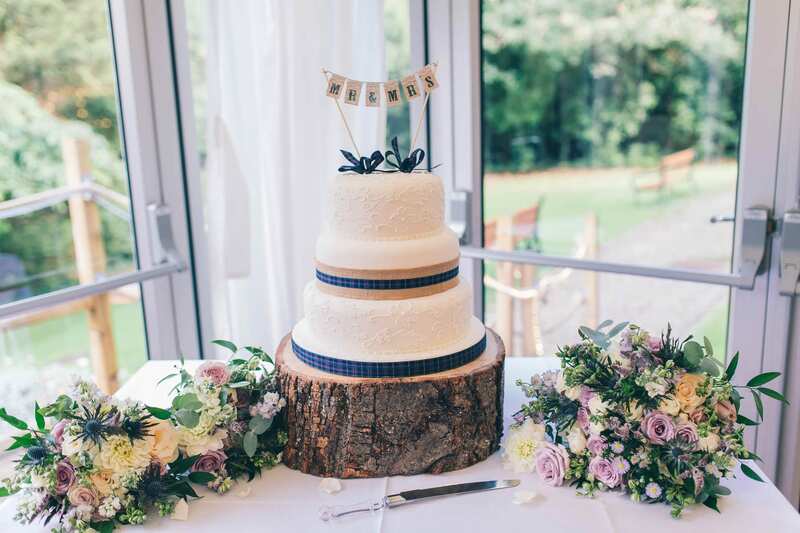 I picked a lovely tartan that went well with the colours we chose that we used subtly on the flowers and cake. 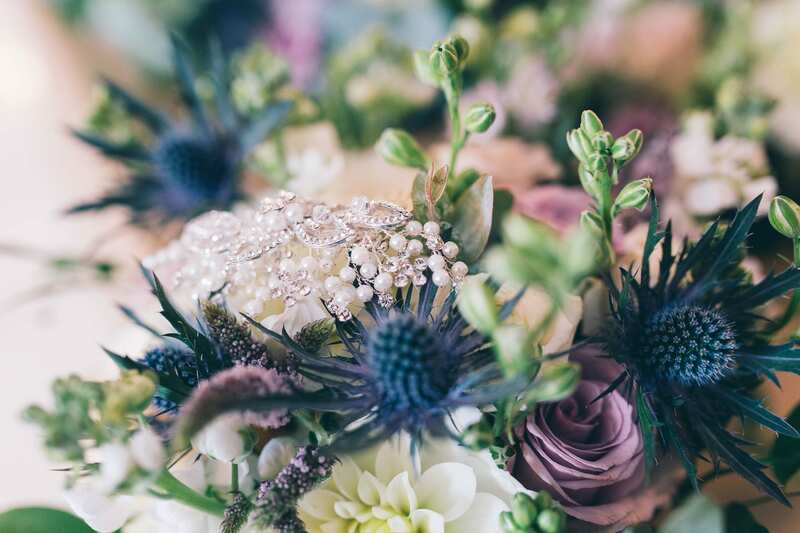 I wanted my flowers to look like the had been picked from a garden, but with purple tones with a few thistles. 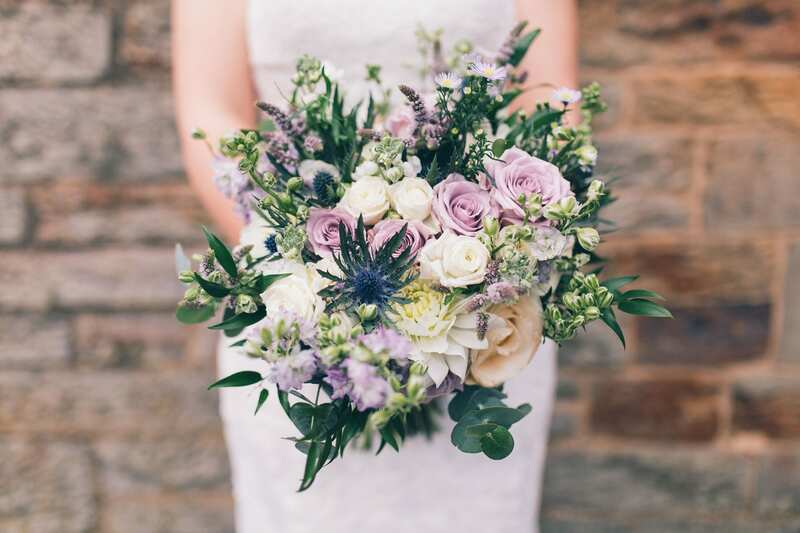 I think Samara (our florist) did a wonderful job! 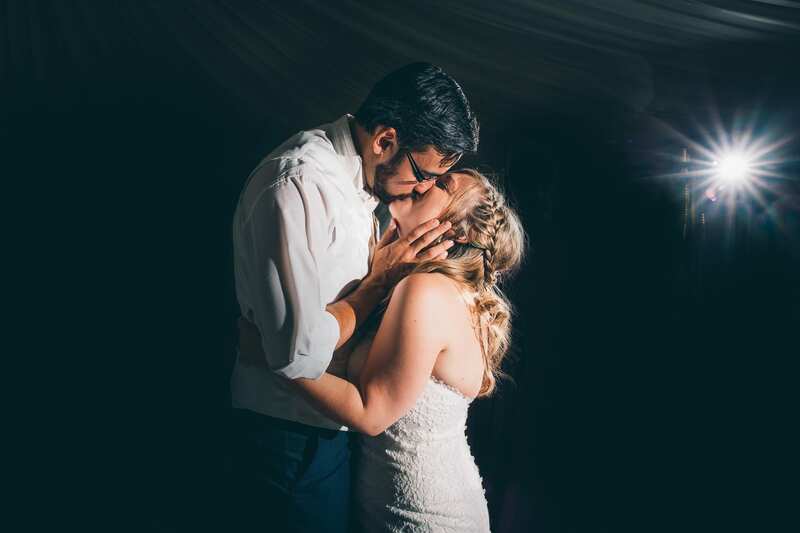 They were stunning and exactly what I wanted! 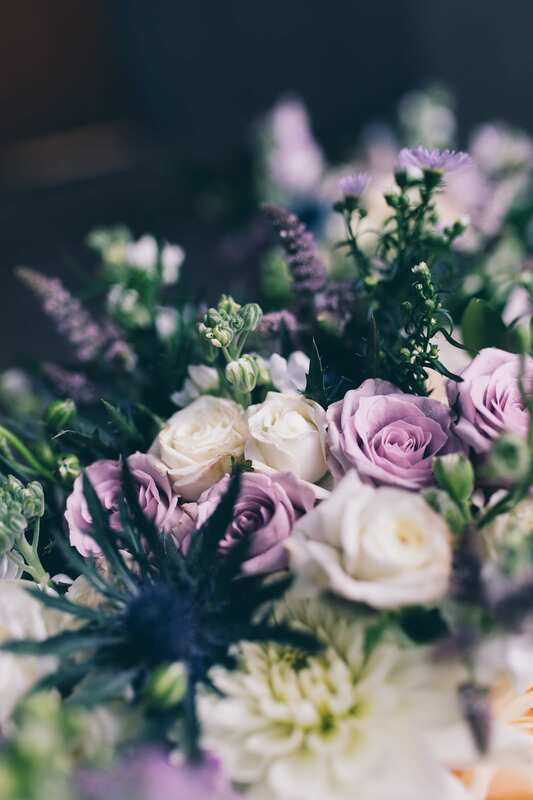 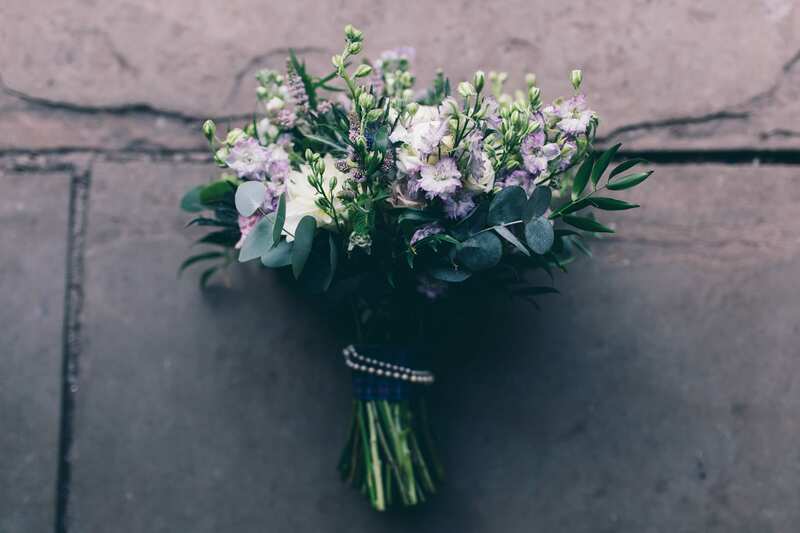 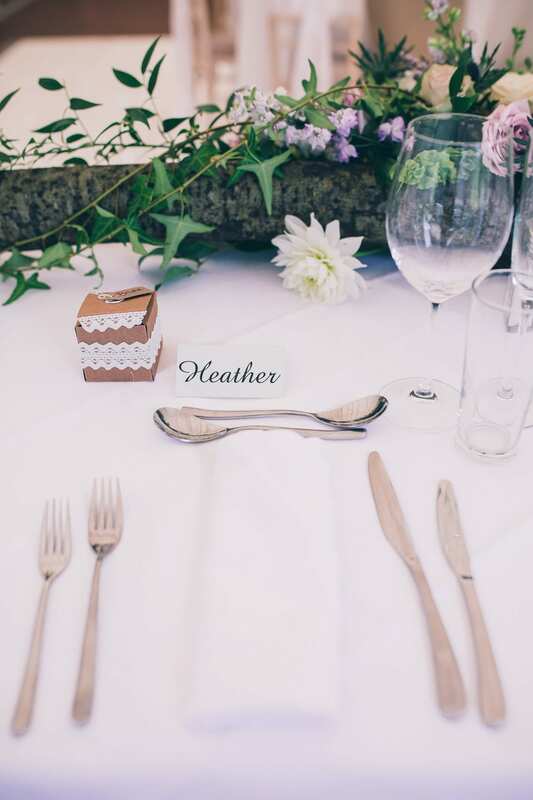 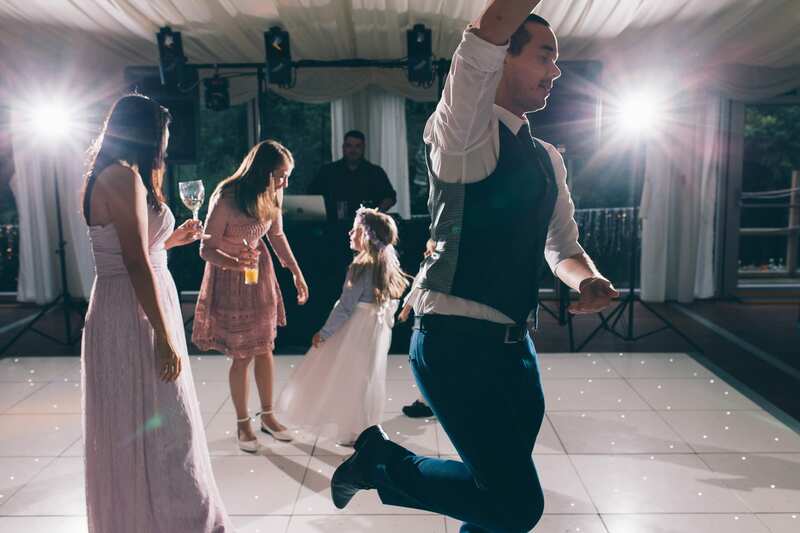 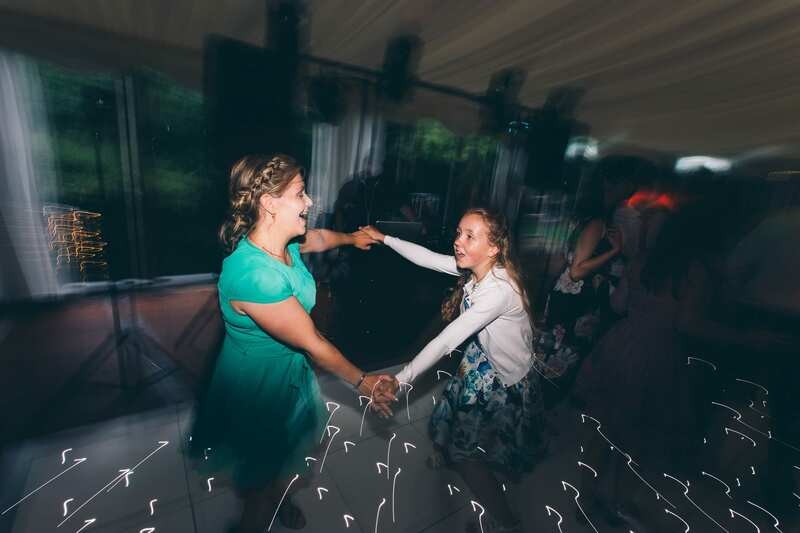 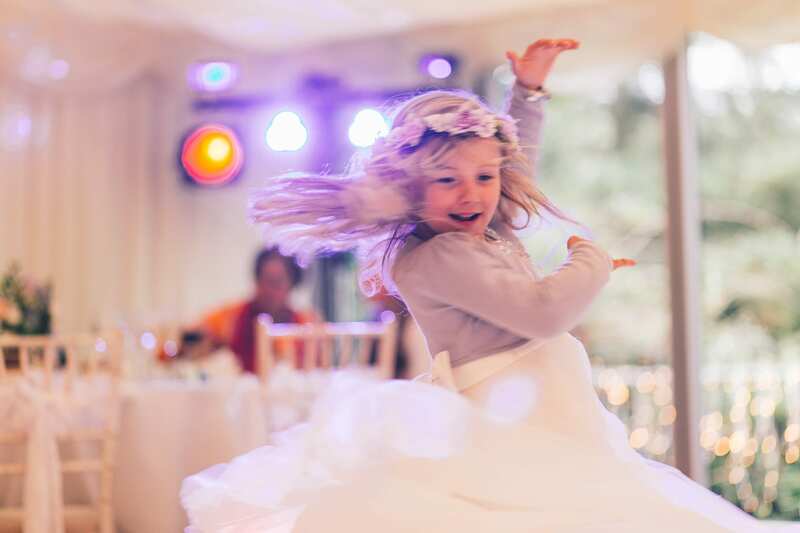 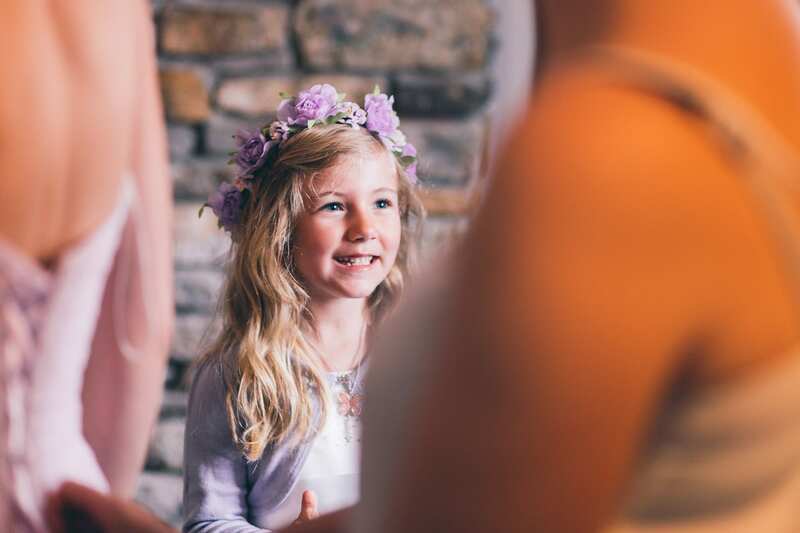 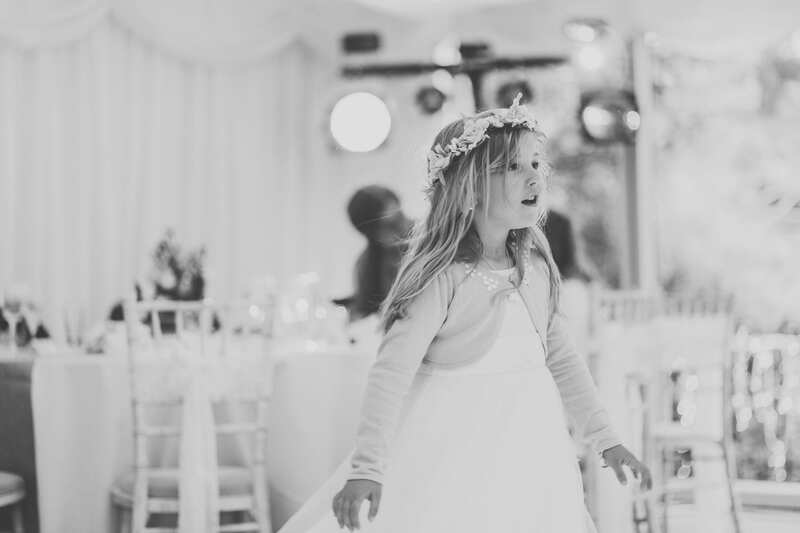 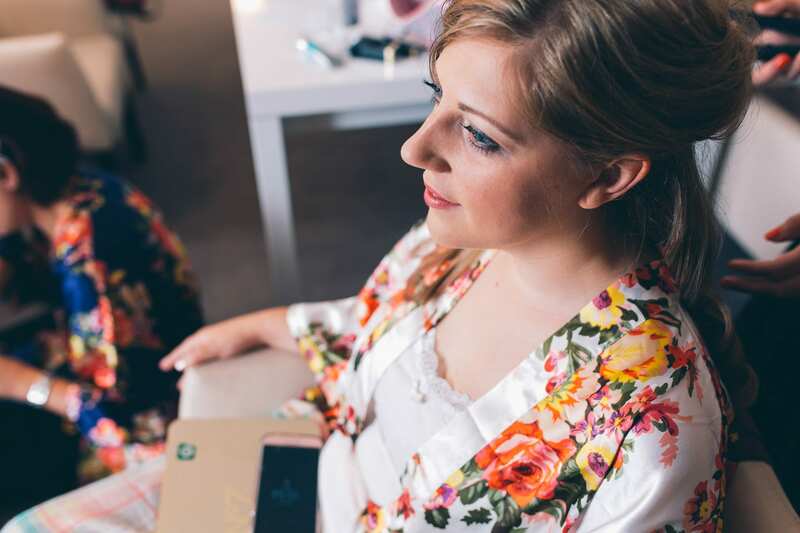 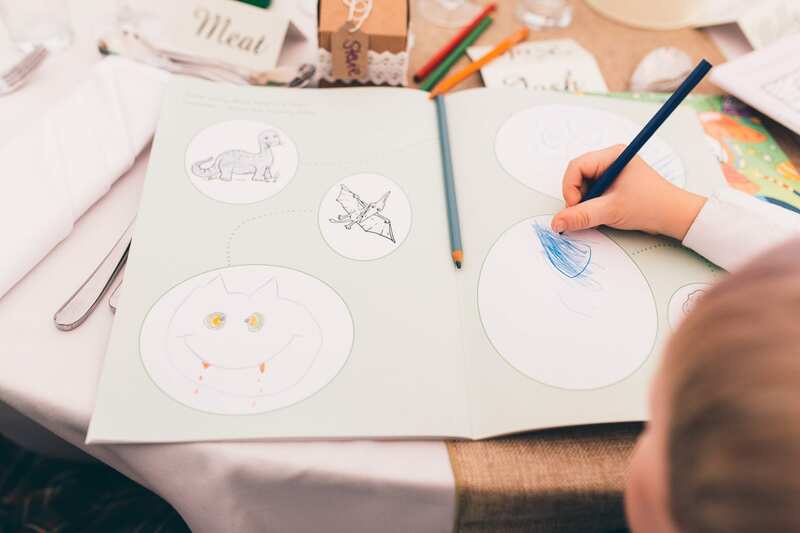 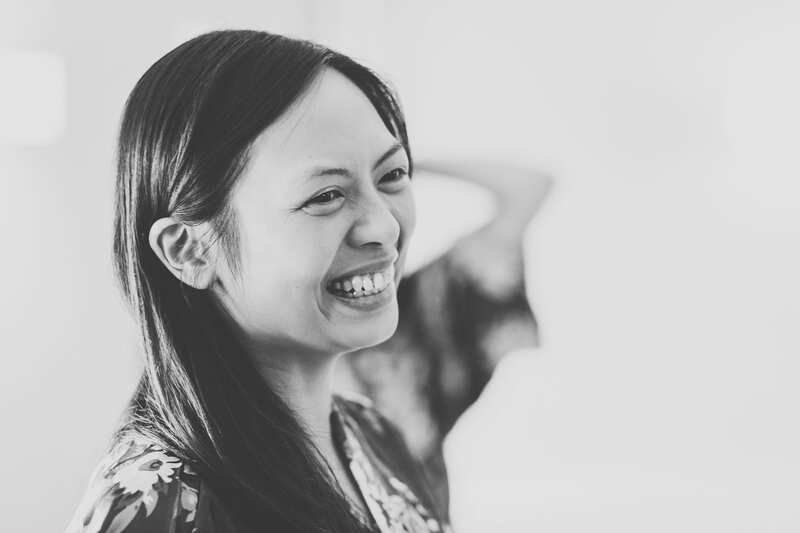 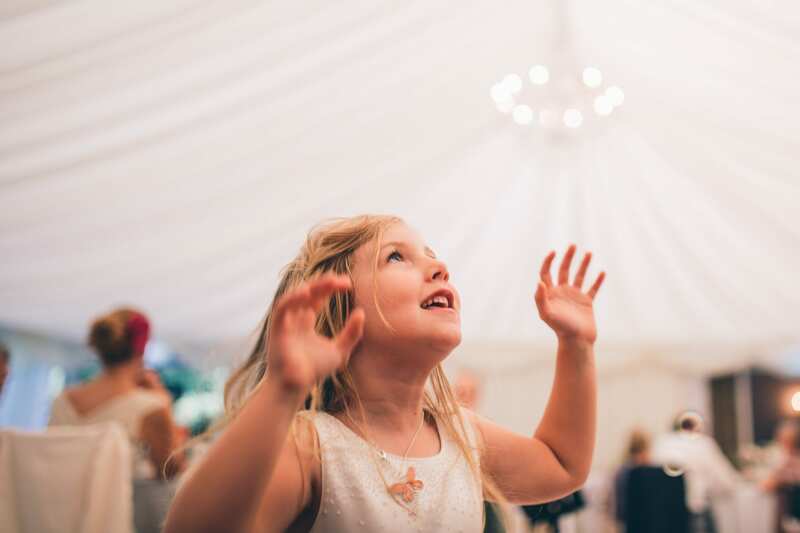 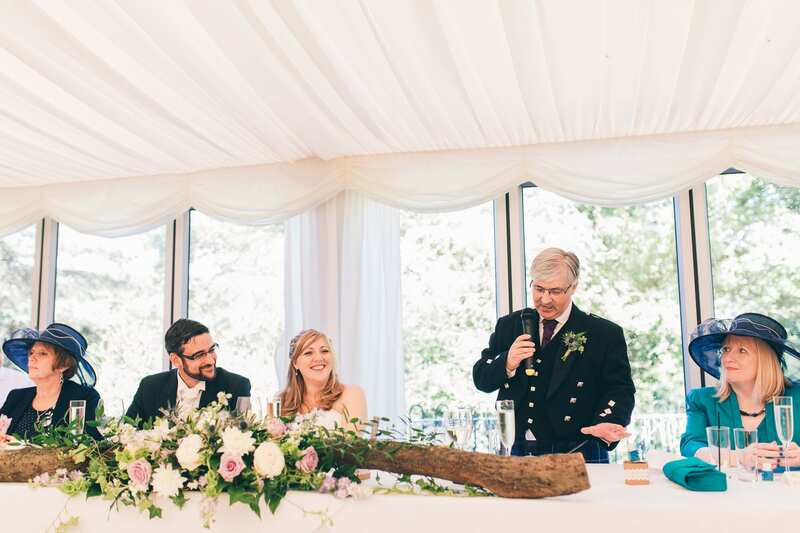 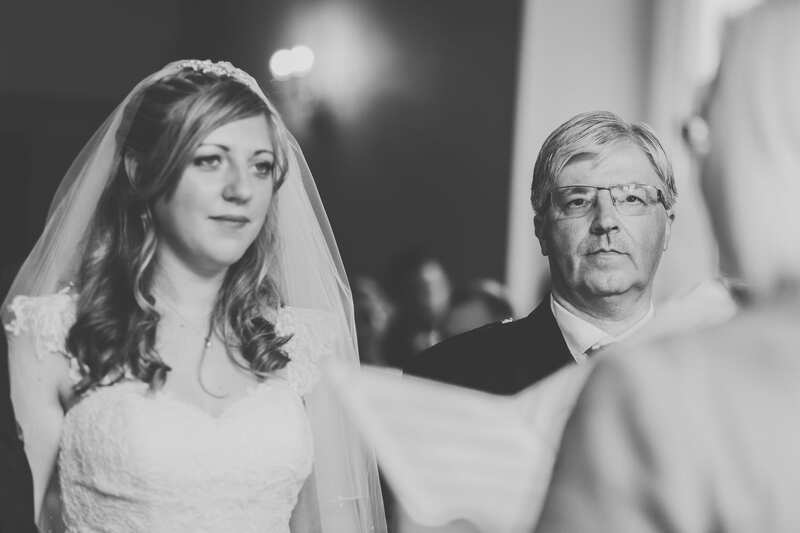 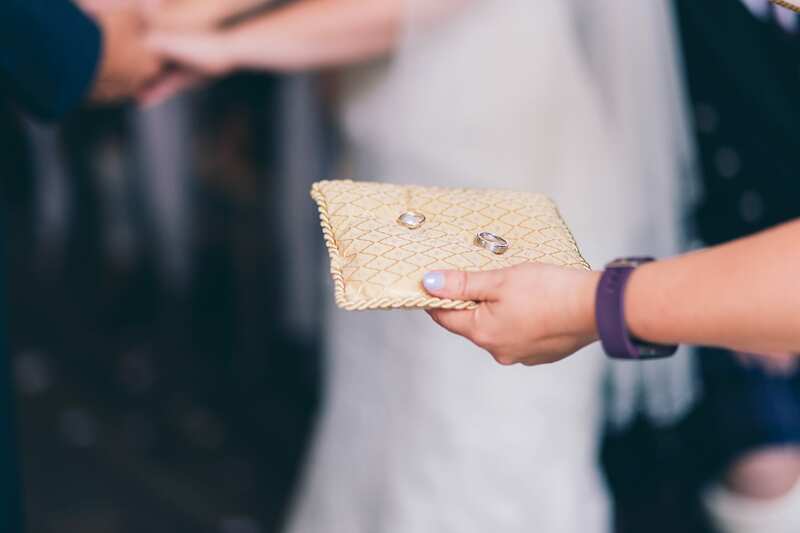 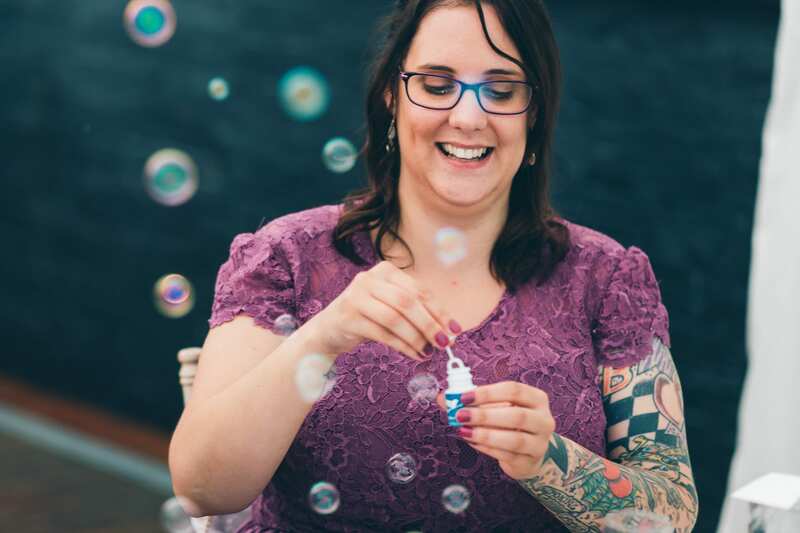 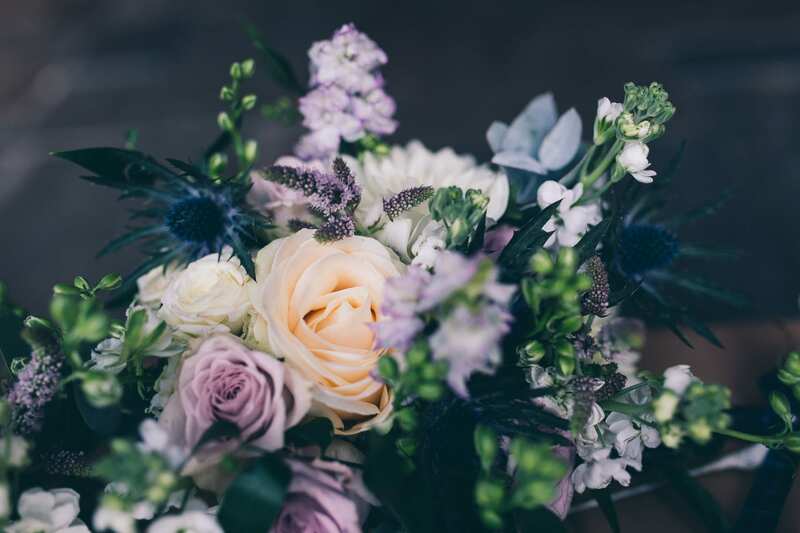 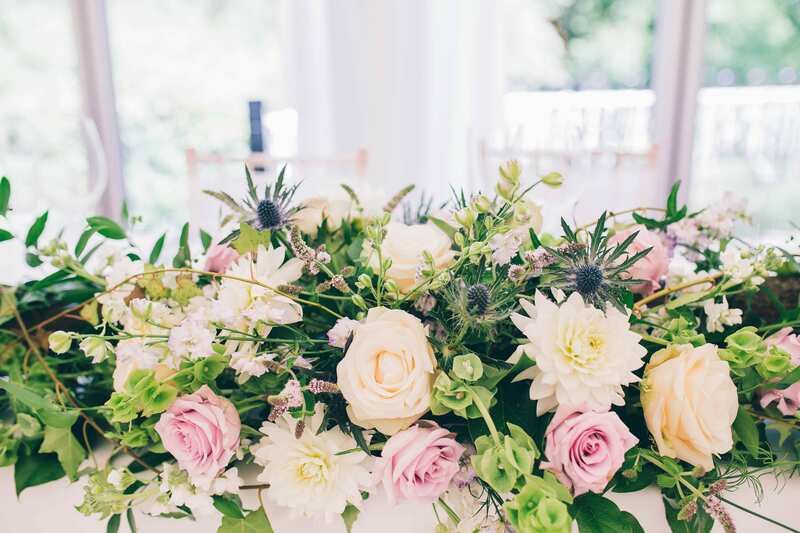 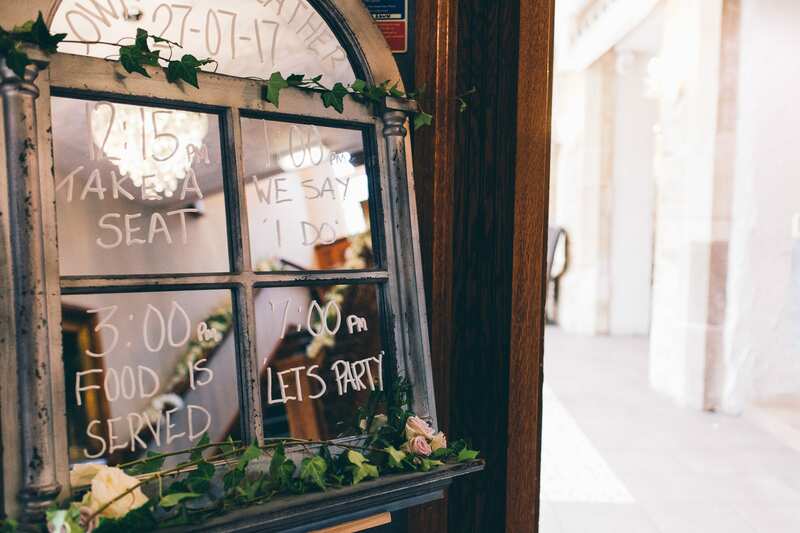 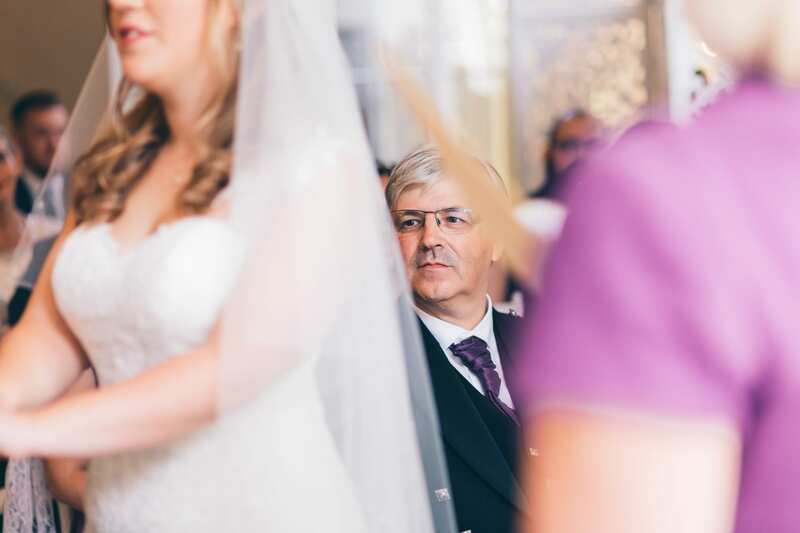 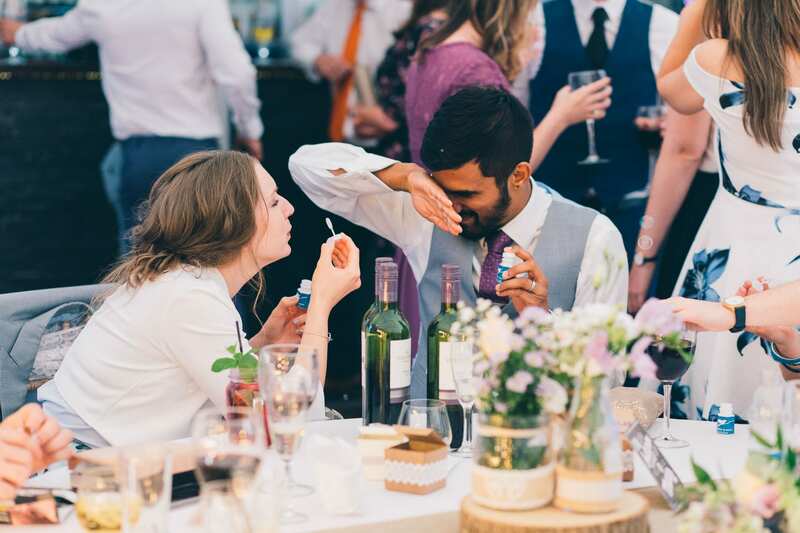 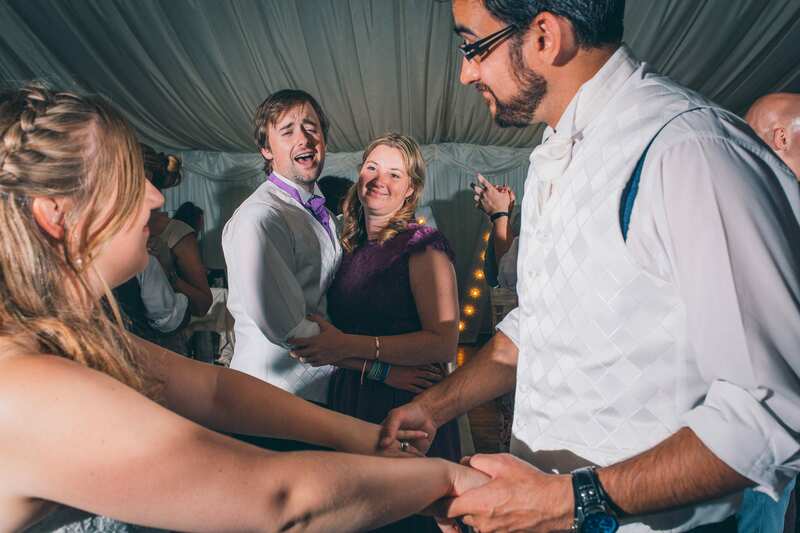 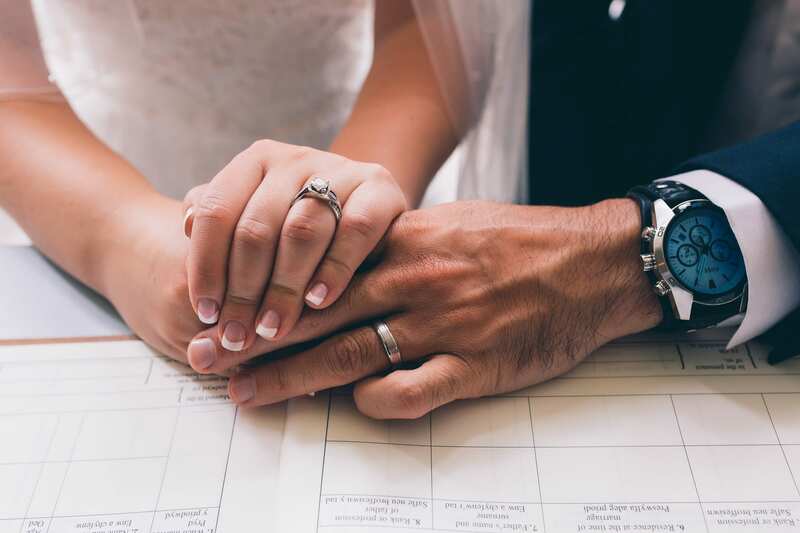 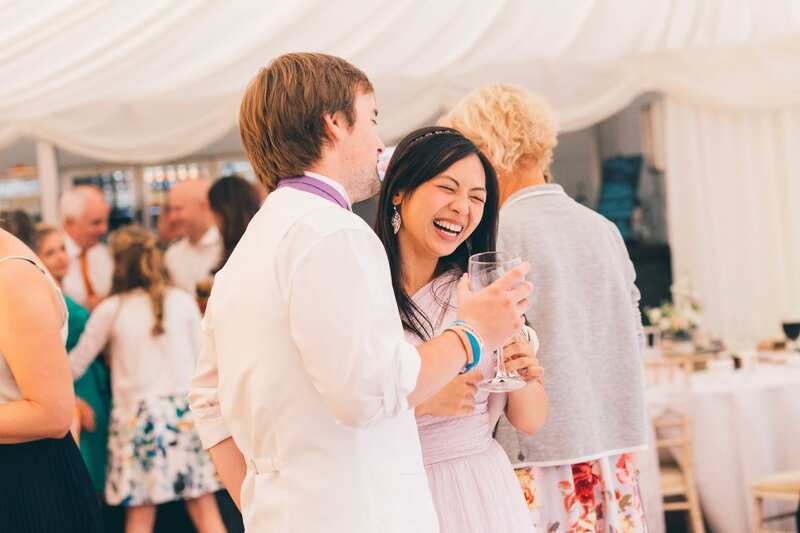 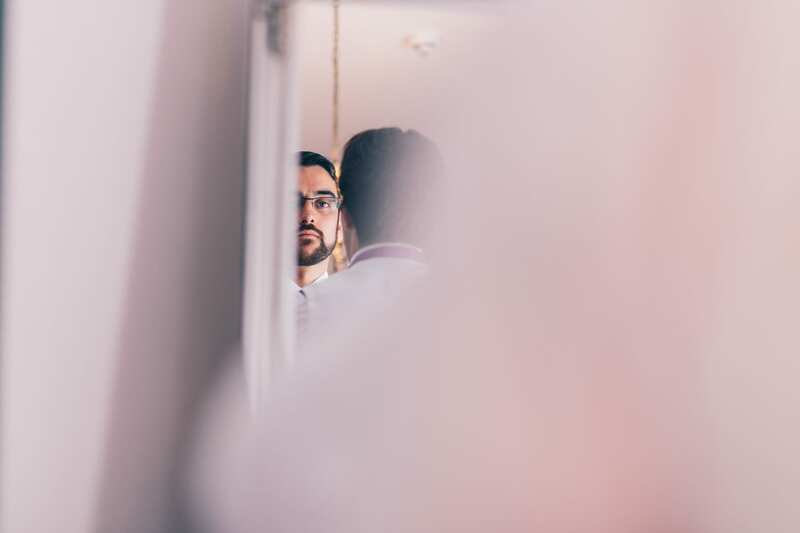 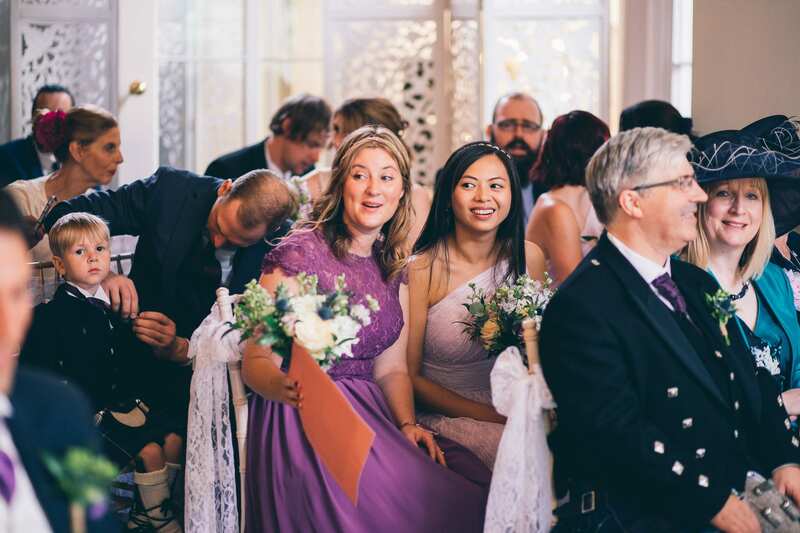 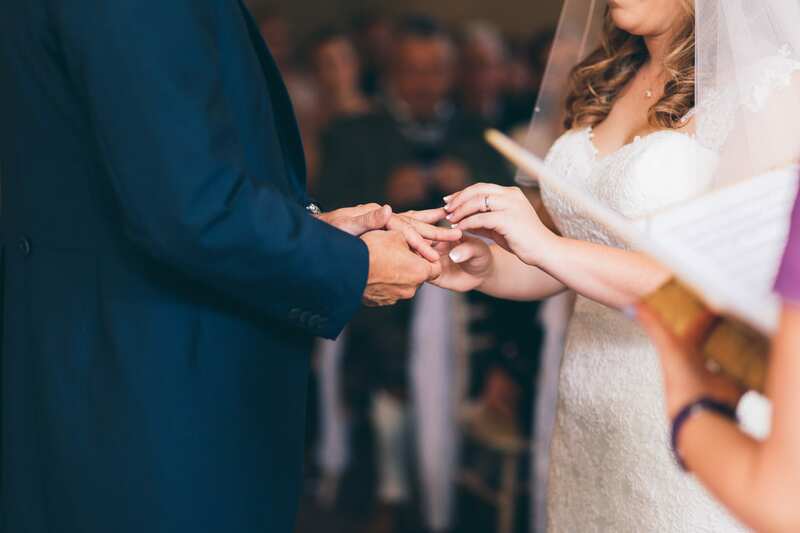 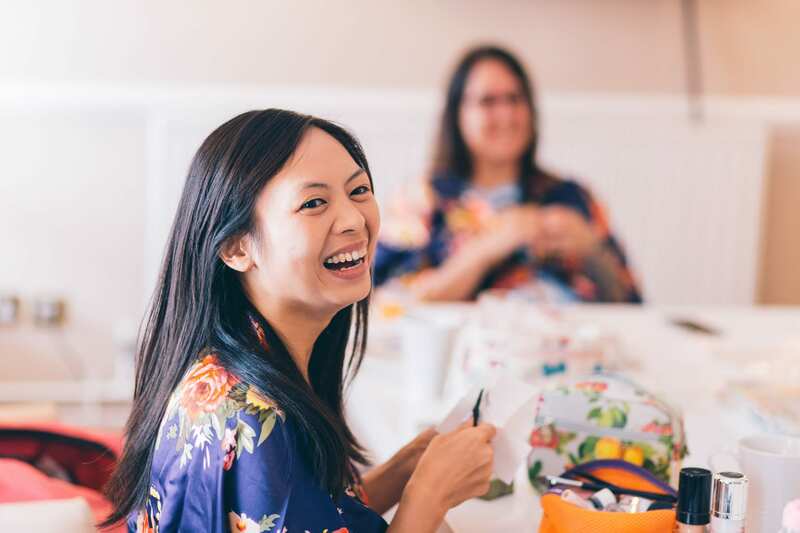 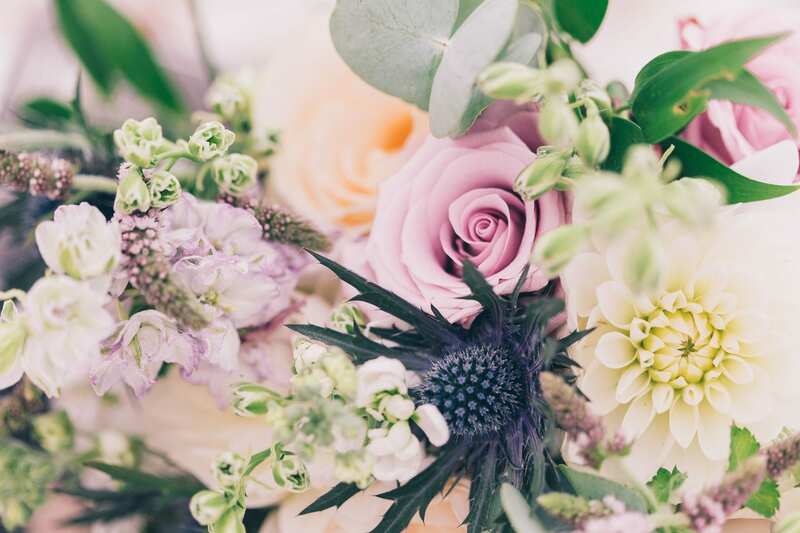 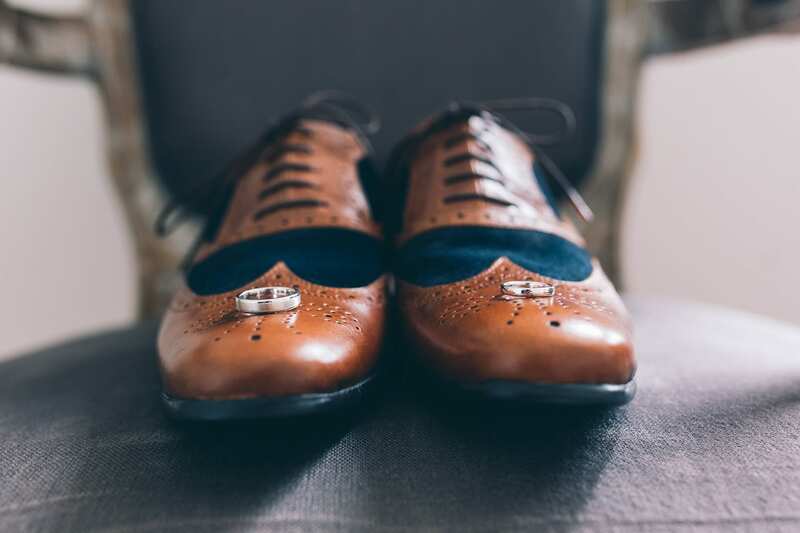 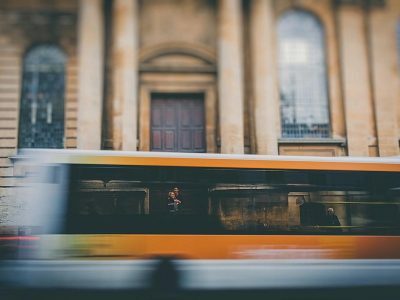 Heather’s sister was unable to attend the wedding as she was travelling, however she wanted to be part of the ceremony so found some poems that she felt would be suitable for the big day. 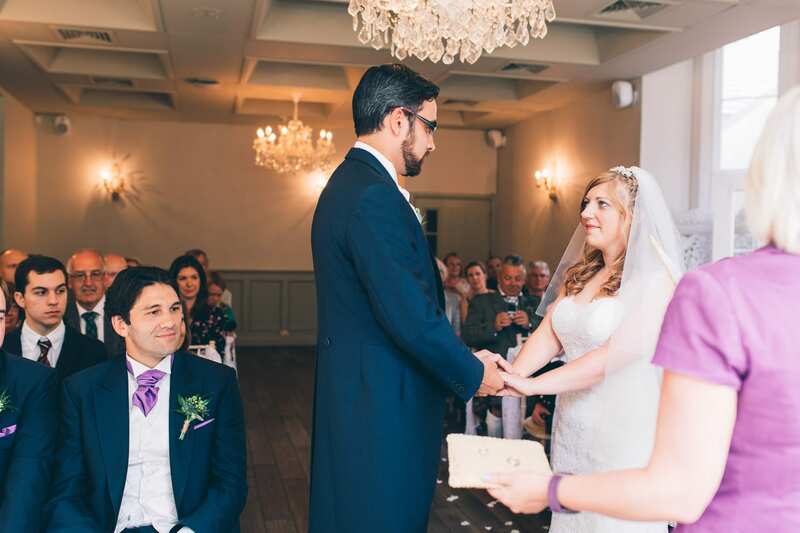 We both chose our favourite to read as vows. 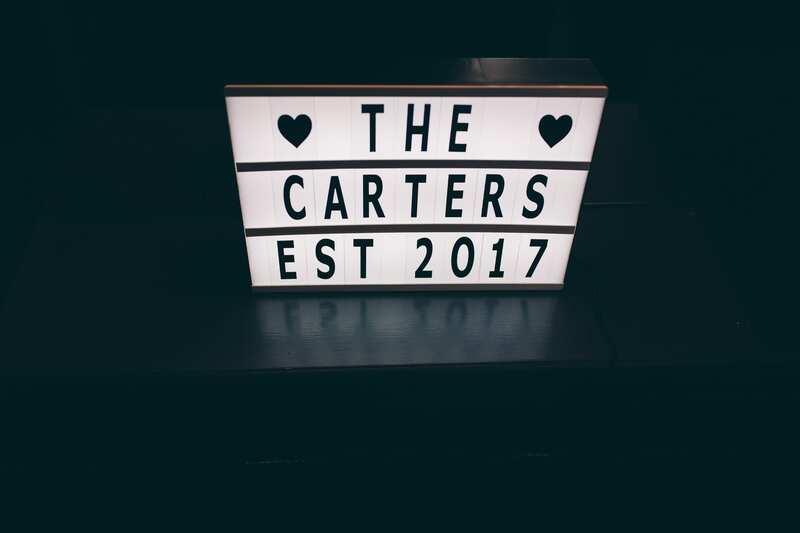 this turned out to go down quite well as many people thought we wrote them ourselves. 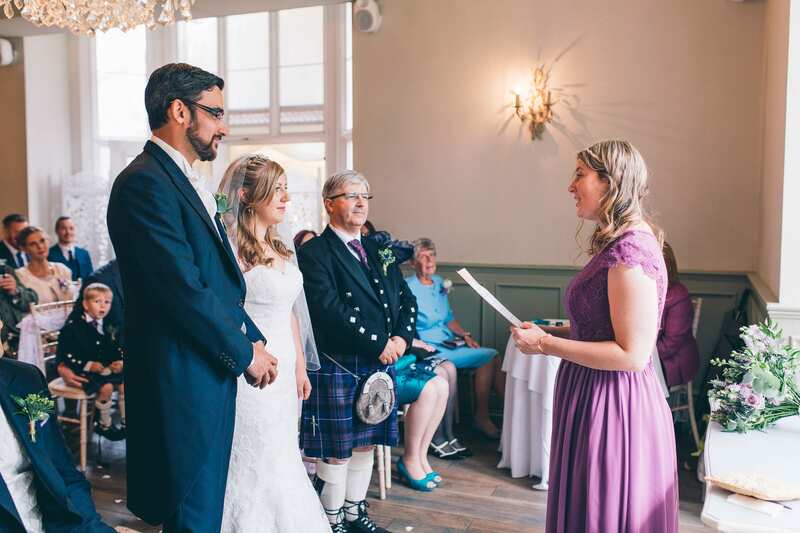 She also wrote a poem of her own for us which we had framed and placed in the ceremony room. 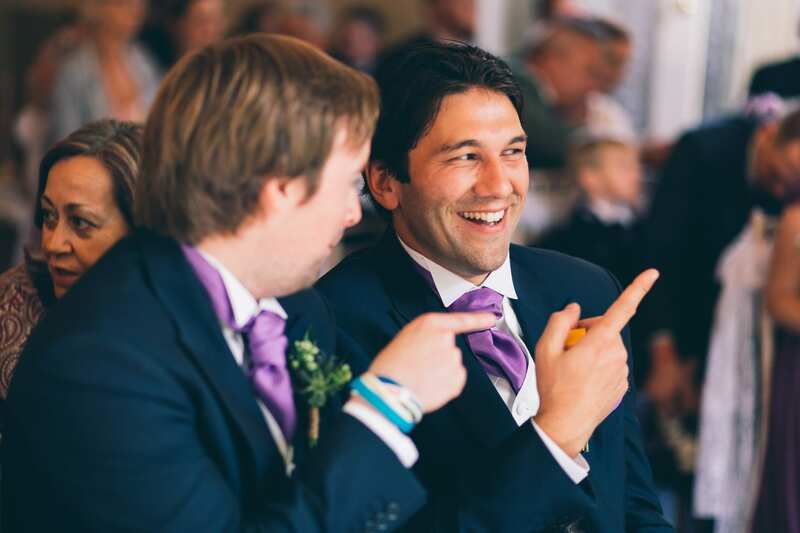 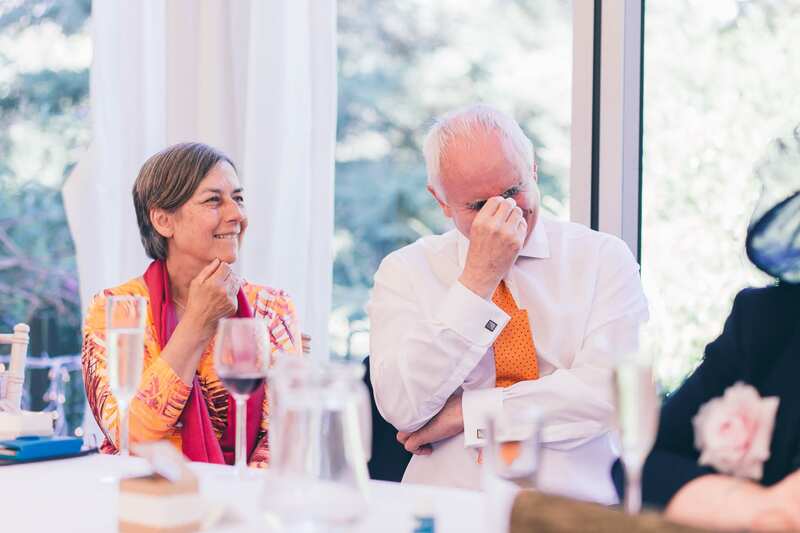 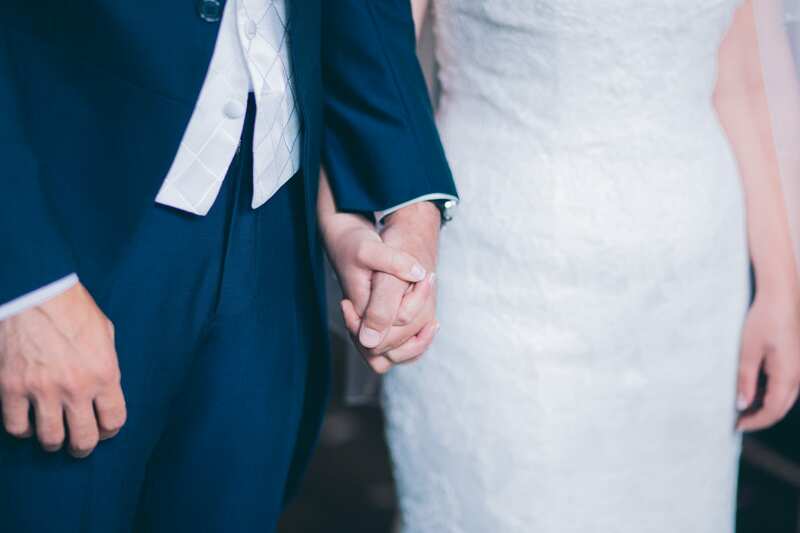 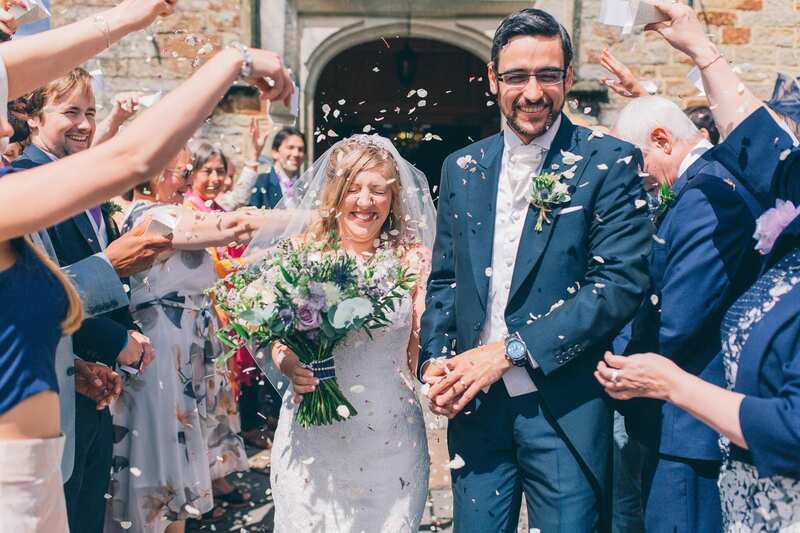 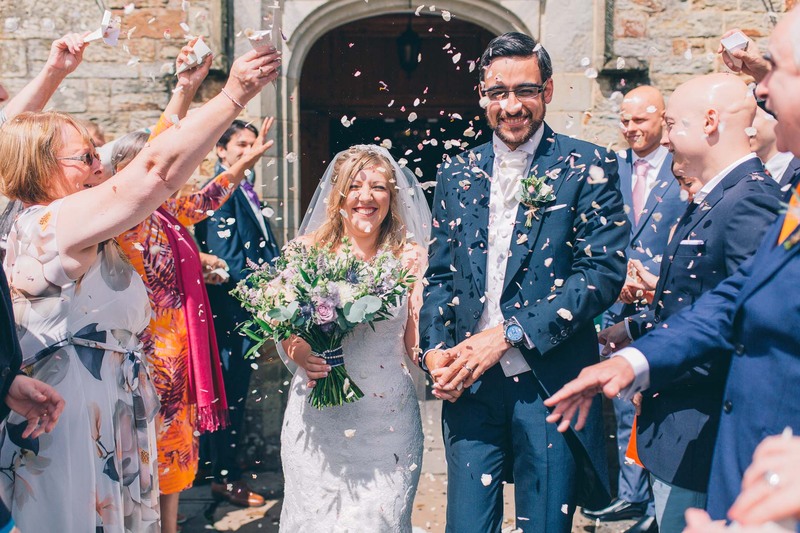 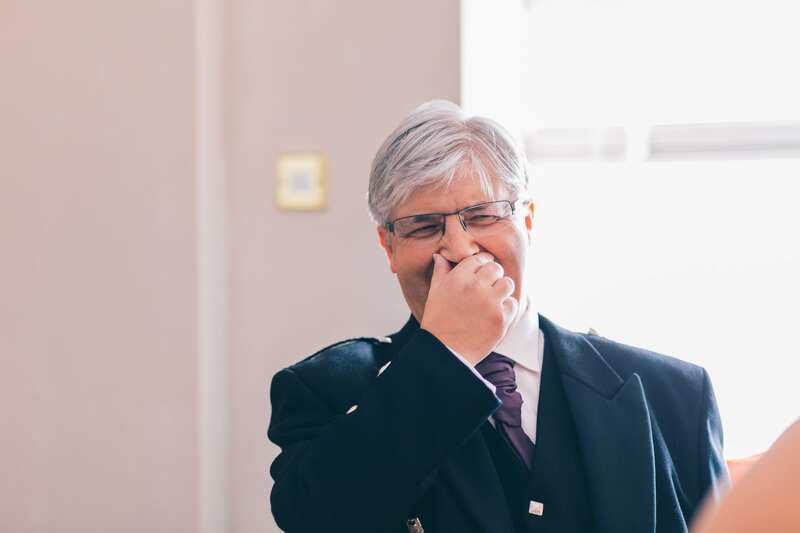 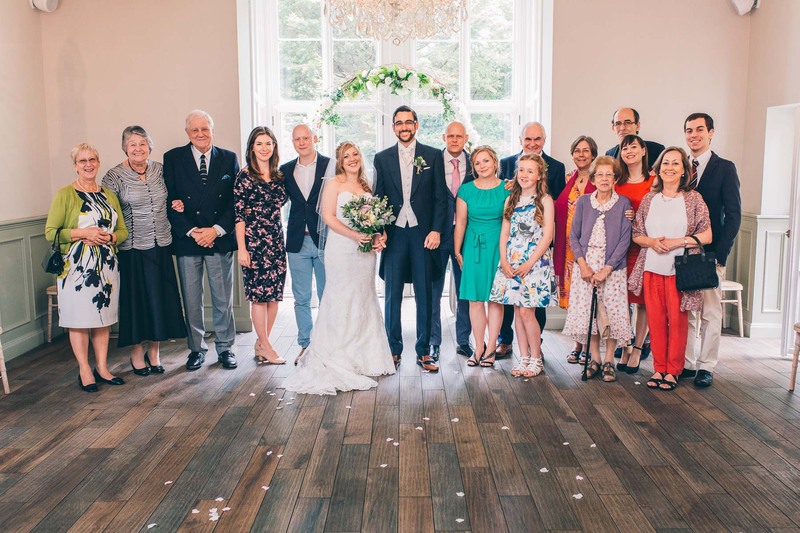 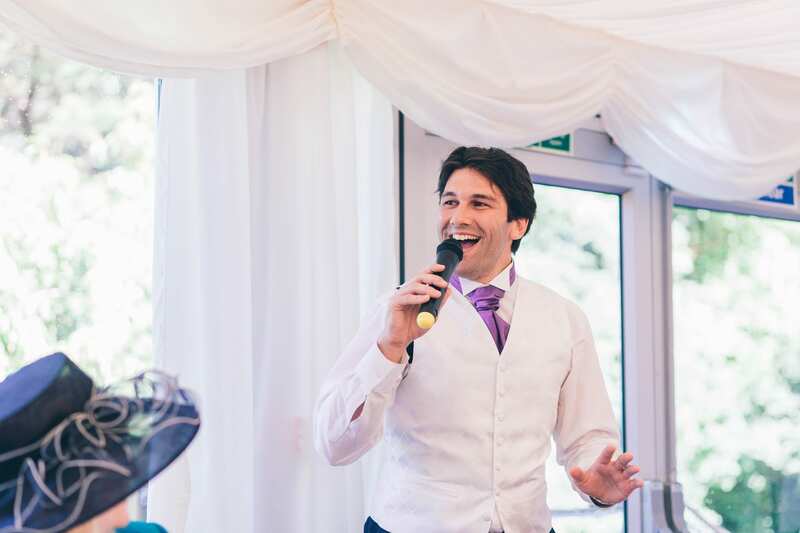 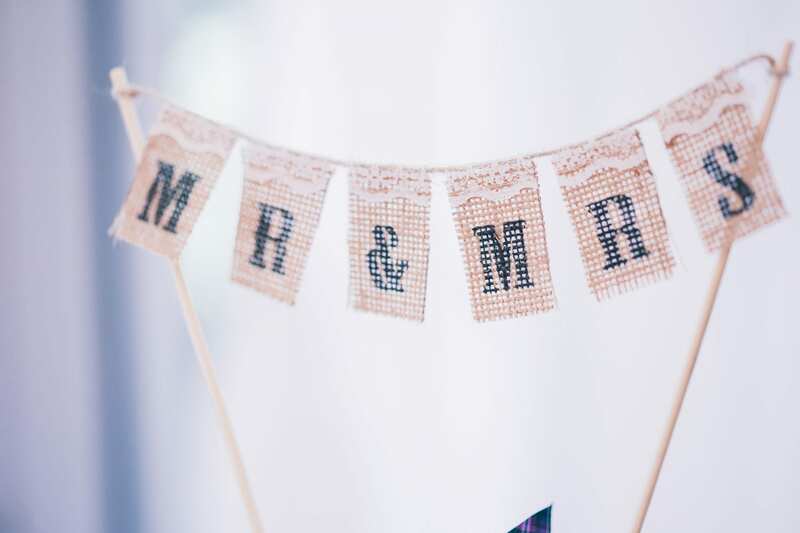 When we were pronounced ‘husband and wife’ everyone cheered and said ‘finally’, it was great because the registrar allowed everyone to feel relaxed and enjoy the ceremony and it was full of laughter! 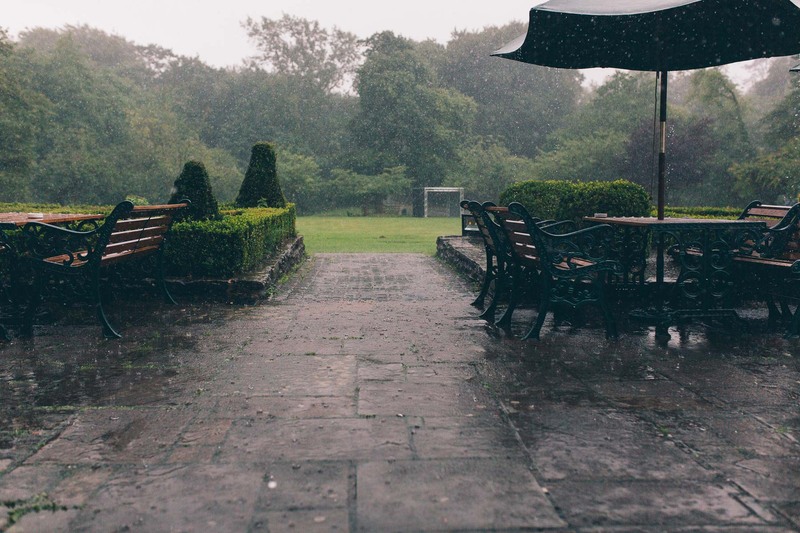 We had a few outdoor games for if the weather was nice. 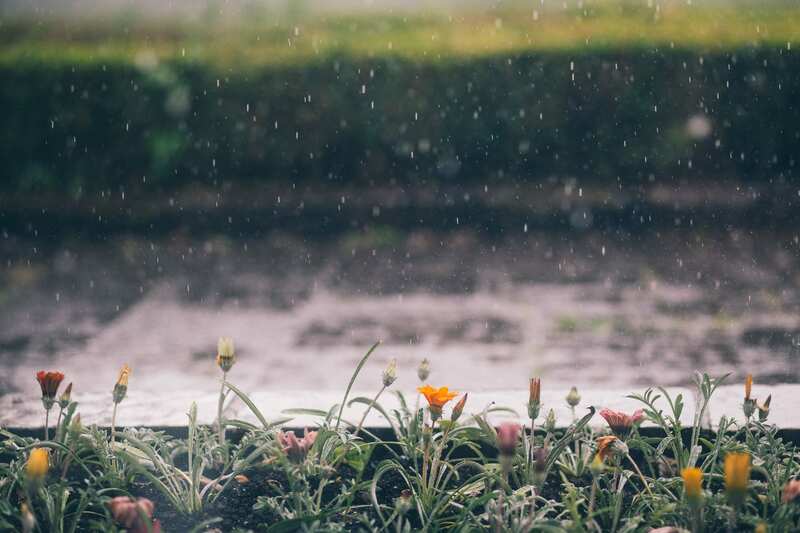 It was not for the most part because it was Wales in July! 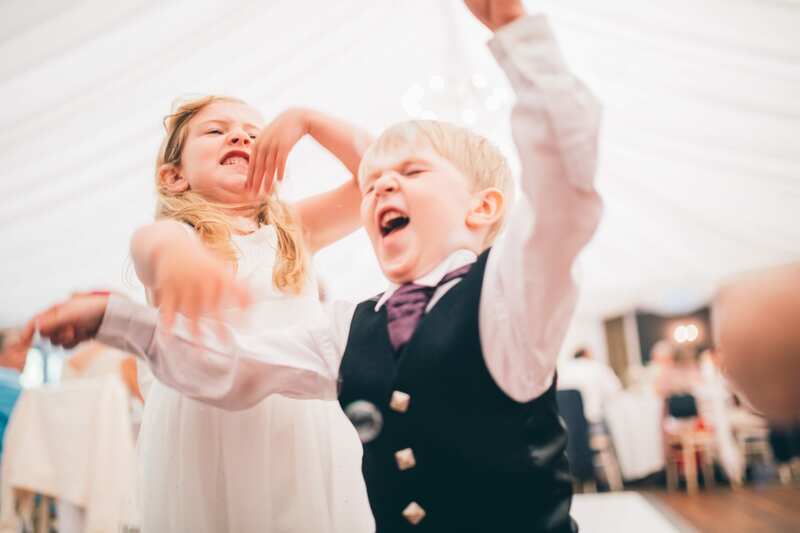 However my niece and nephew made good use of them. 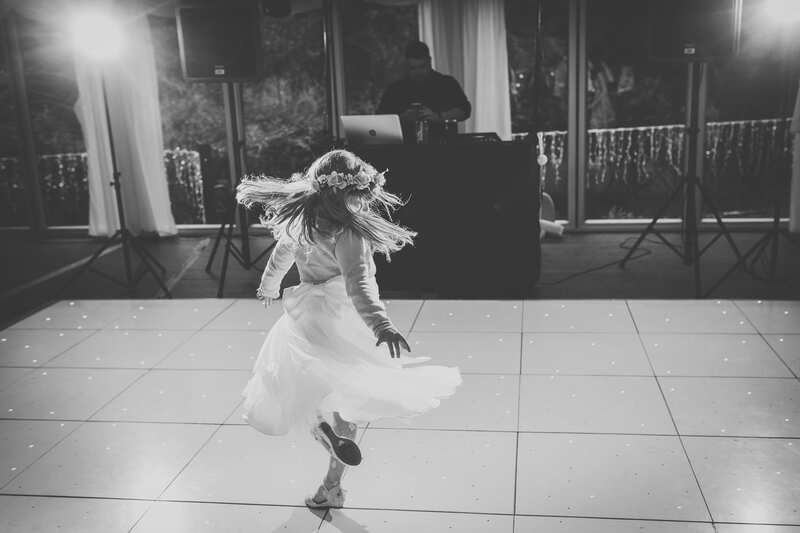 We had a DJ for the evening who did a very good job of getting everyone dancing. 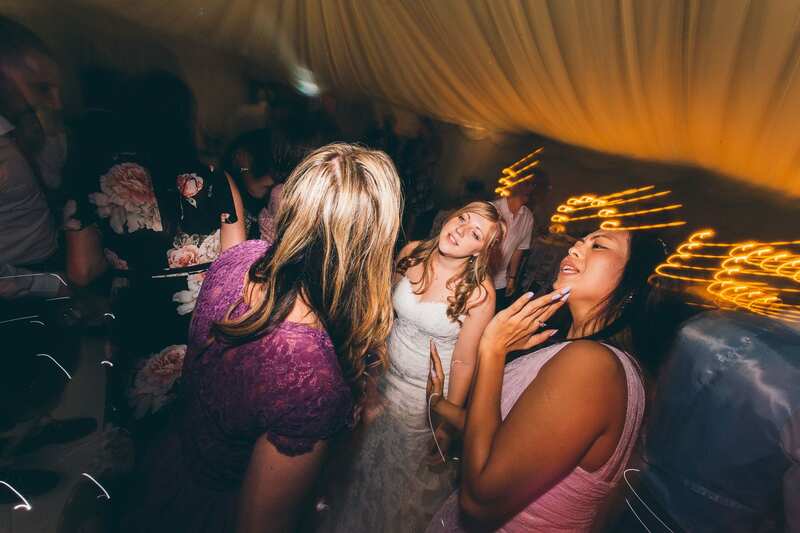 I asked for a couple of songs. 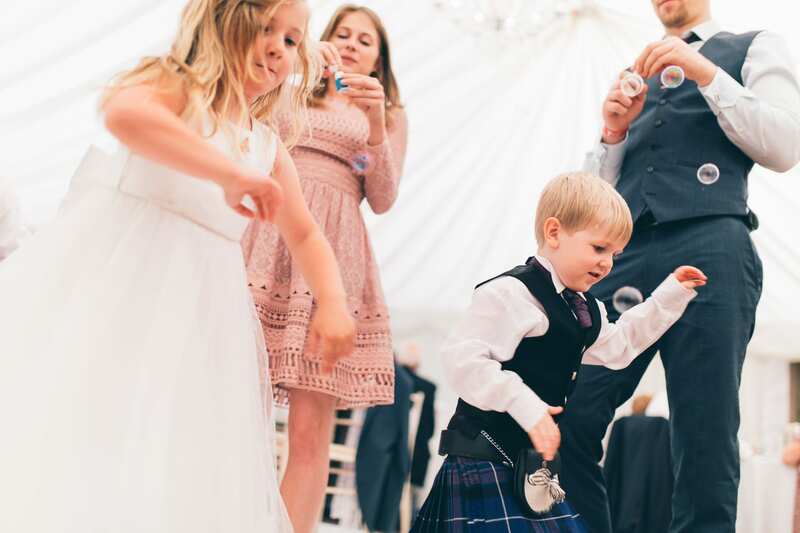 The first dance song was ‘I’m yours’ which was picked because we could sway on the spot without looking stupid and Owain thought the lyrics were very relevant. 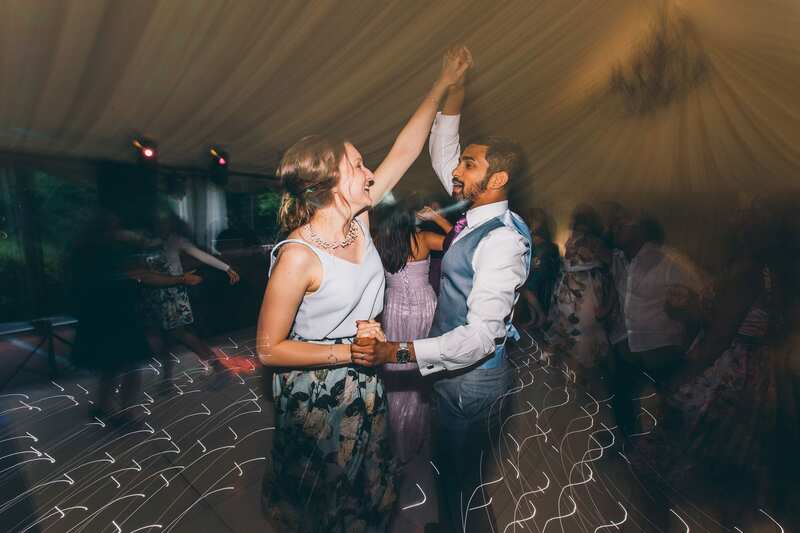 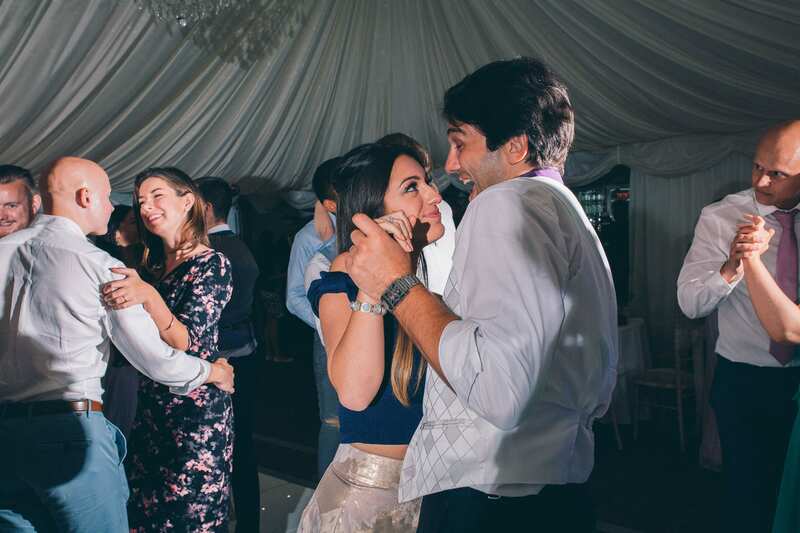 We also chose to have ‘accidentally in love’ as our second dance as it was a song we both enjoyed. 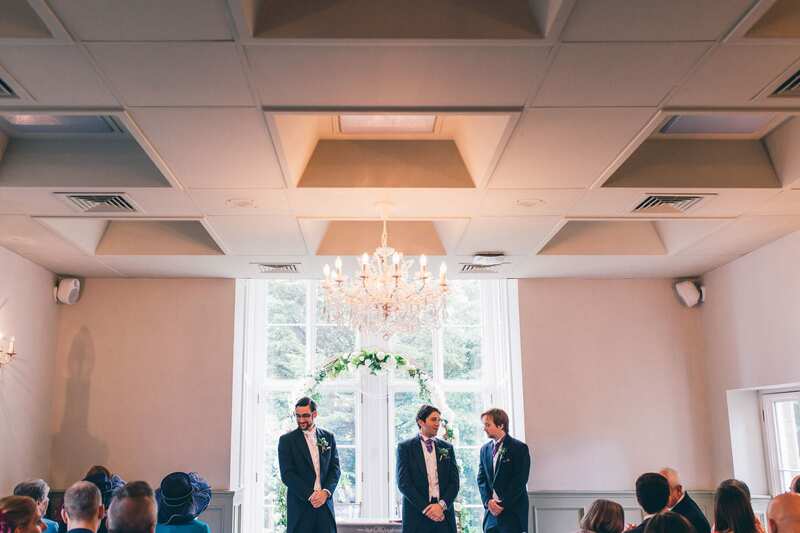 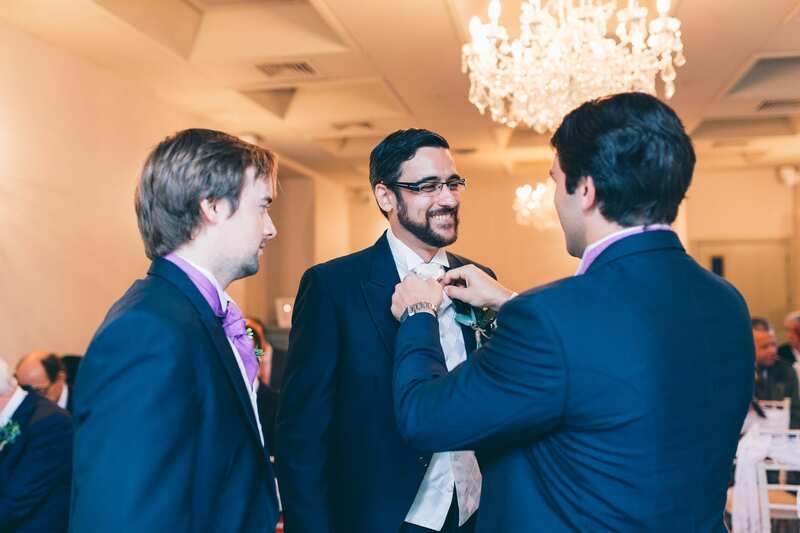 The ceremony was our favourite part of the day. 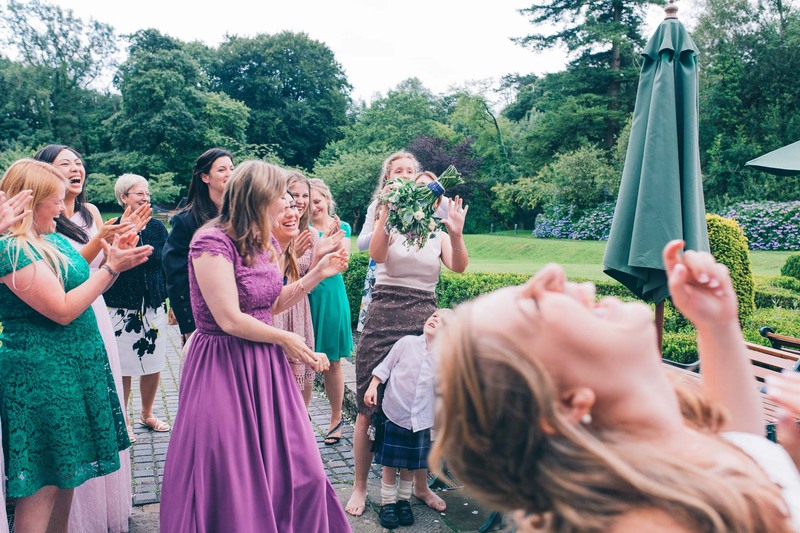 Everybody seemed happy and relaxed and it was the first time I was able to see Heather that day. 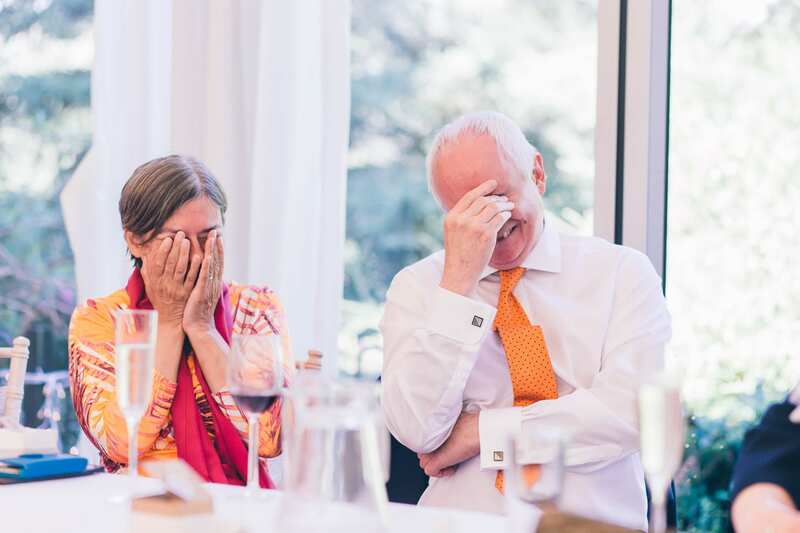 It was wonderful to share the day with all our family and friends and the cheer at the announcement was lovely to hear. 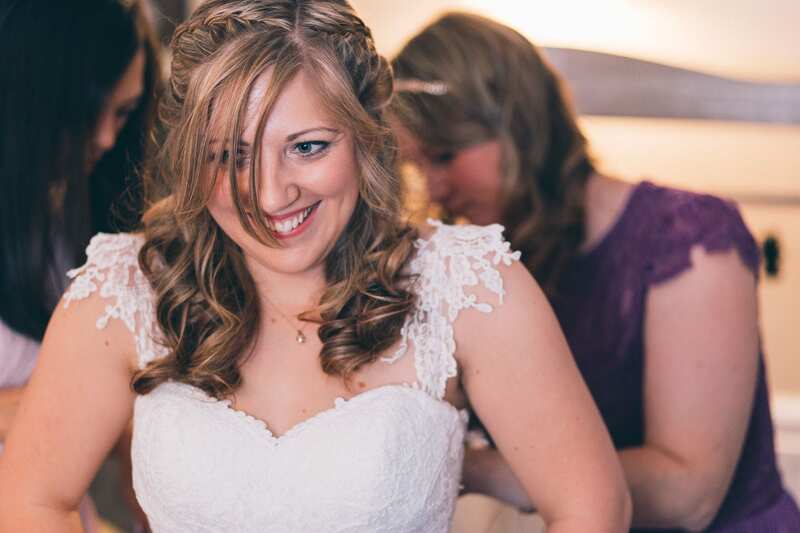 Larissa was excellent throughout the whole process, from booking to receiving our photographs. 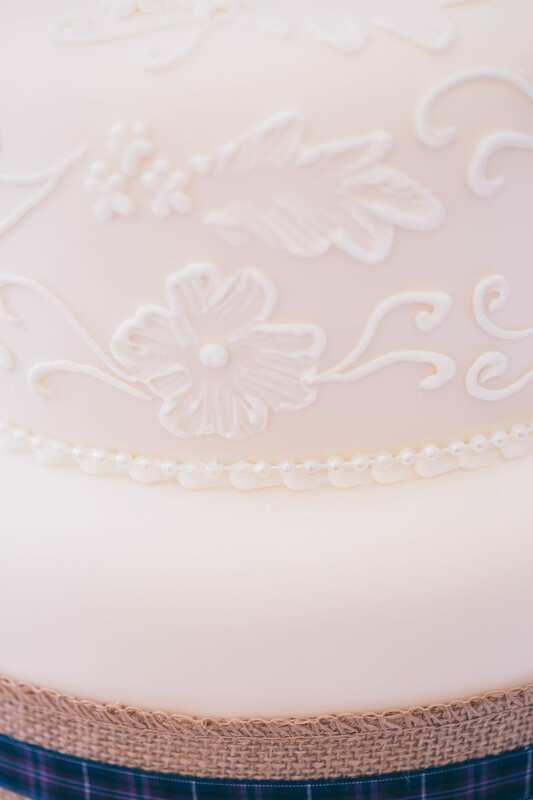 Her style was what we were looking for and her prices for the quality of her work are excellent! 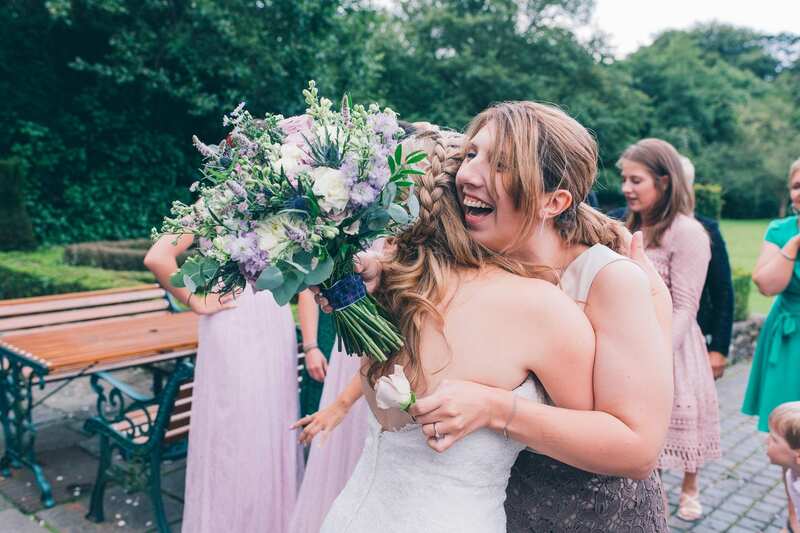 She was there for the whole day and as a result we have great photos of all the different parts which made the wedding day what it. 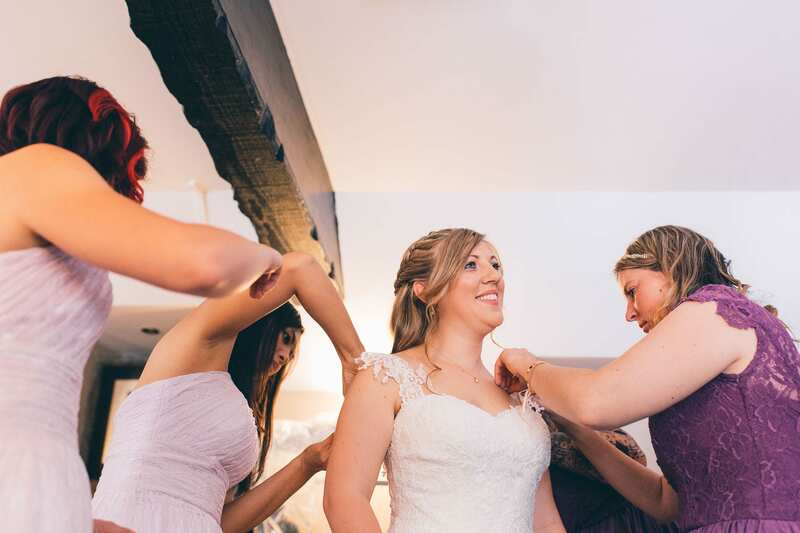 She takes a lot of time and effort to get to know you, the style of wedding and family/friends to help capture the day to reflect you. 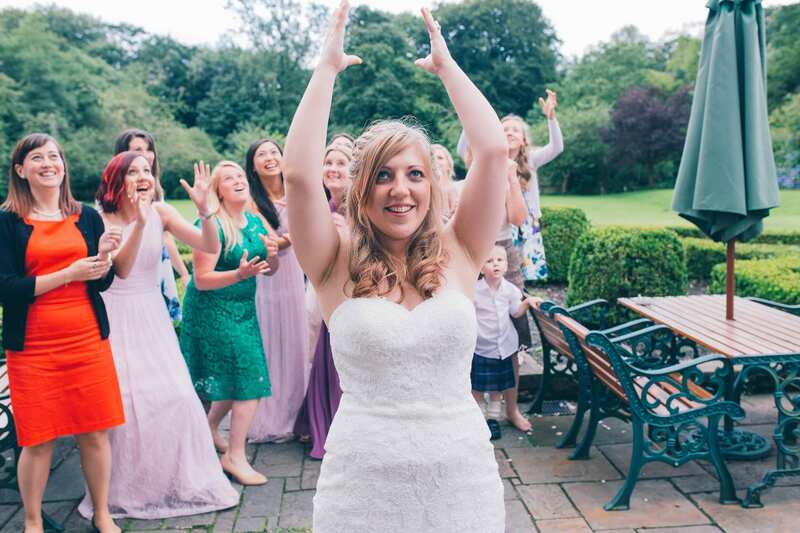 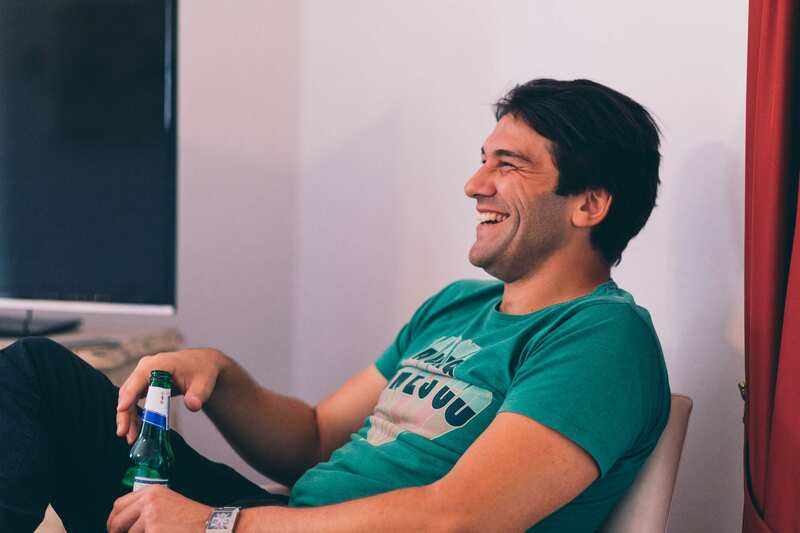 She put us at ease throughout and her professionalism and bubbly, humorous personality helped. 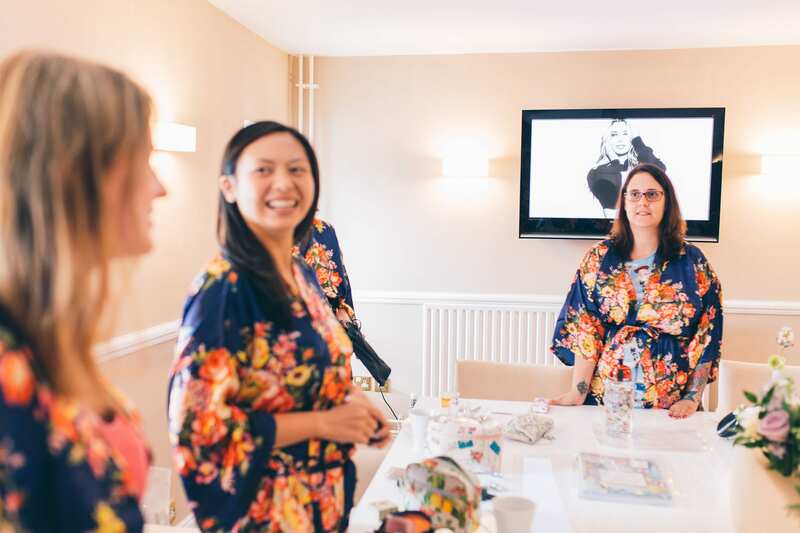 The best part was that all of our guests commented on how wonderful Larissa was and that they felt she did a brilliant job. 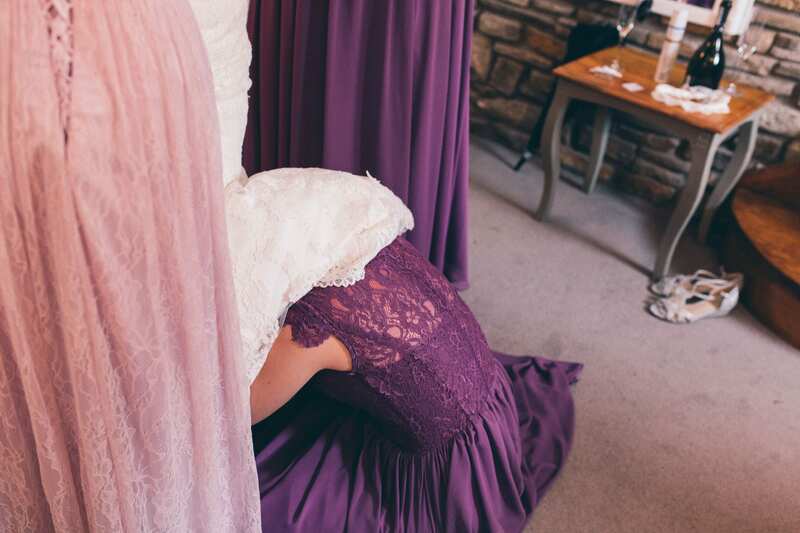 I would recommend her to anyone looking for a professional photographer whatever the occasion!